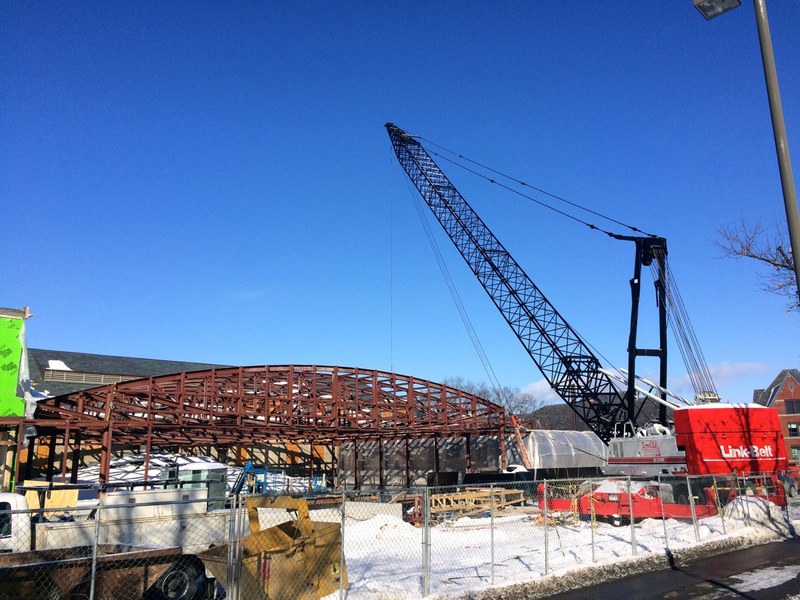 Hats off to Welliver and the crew from Raulli & Sons Ironworks sticking it out through the winter to get the structural steel done. 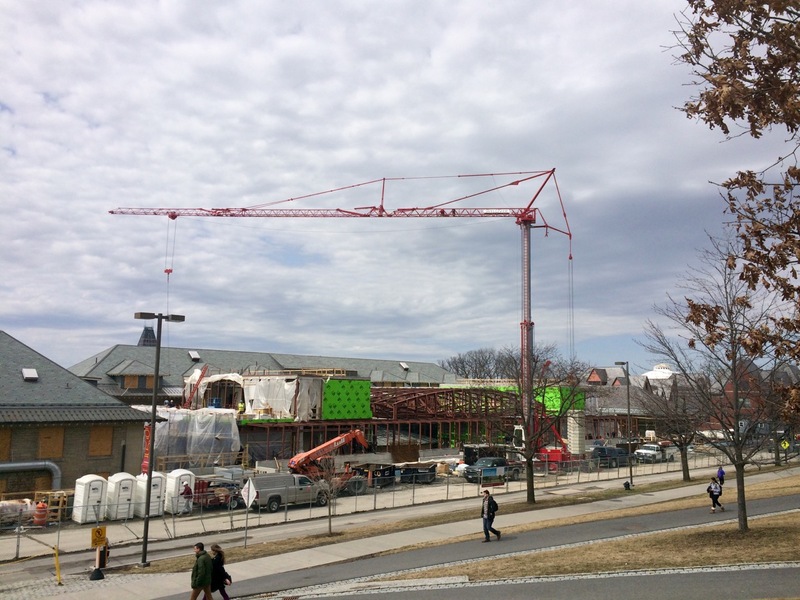 Steel crane is now off site, and as the project rolls on, the new folding jib telescopic tower crane is up-and-running for the remainder of the work, especially the Josef Gartner glass installers that will be working on the glazed ceiling and wall systems that compose the atrium structure. 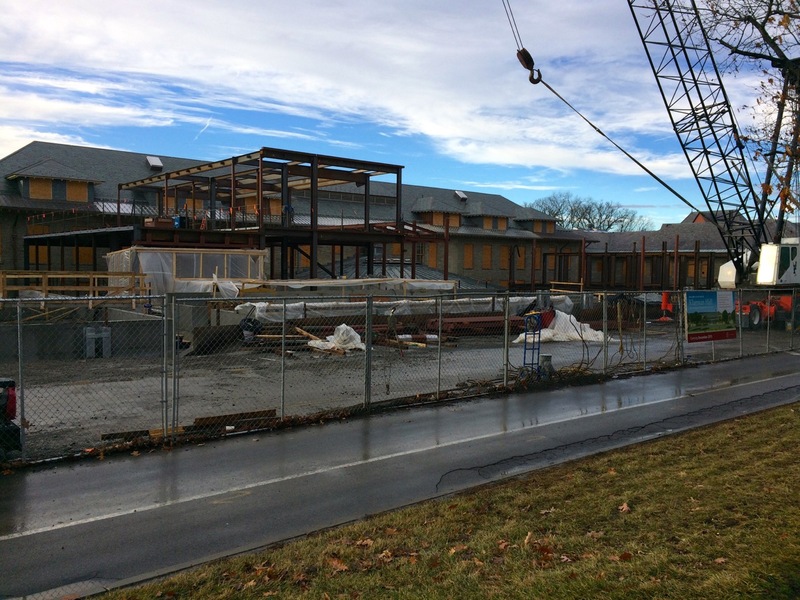 Throughout the structural phase, many of the exterior wall frames have now been assembled and sheathed with glass-mat sheathing in preparation for sandstone panels and various cladding types, and trades for electrical, plumbing, sprinkler systems, etc. 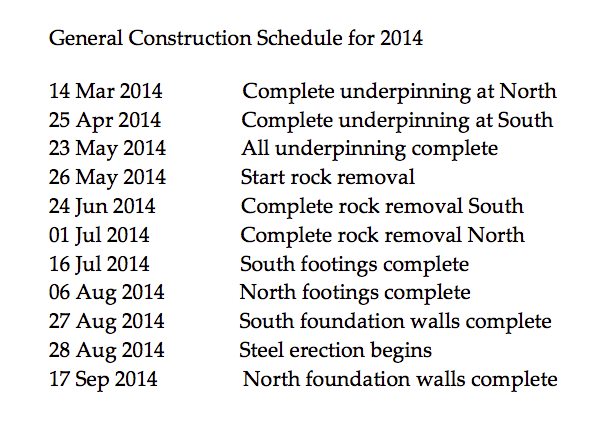 have been busy. 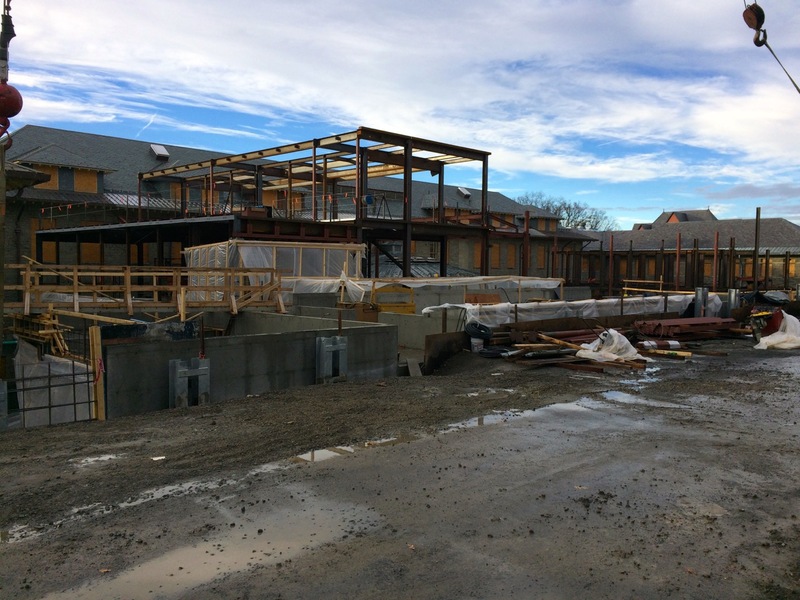 Interior framing started on the North side in March, and drywall and paint will be taking up much of May and June. 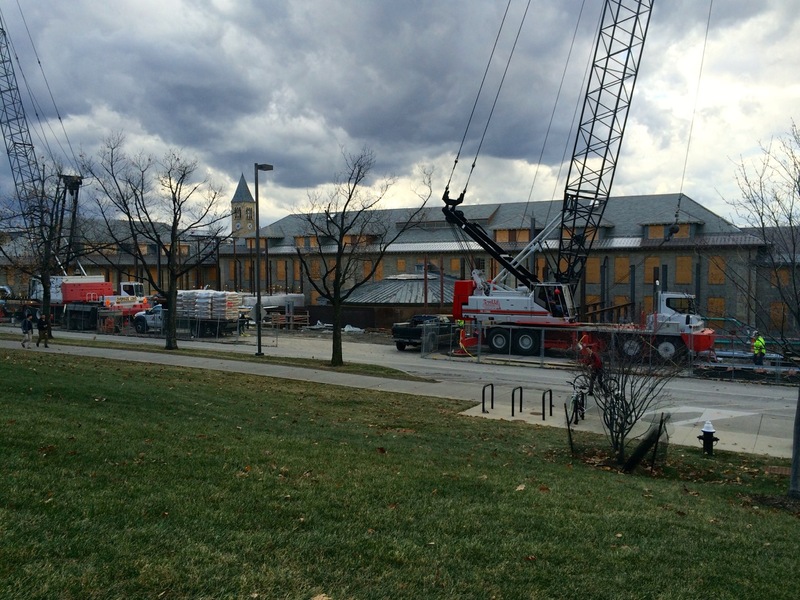 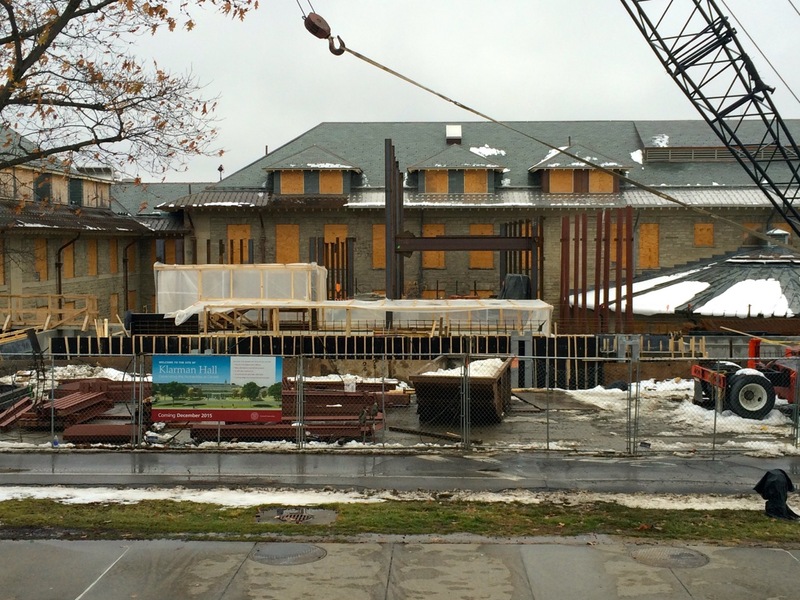 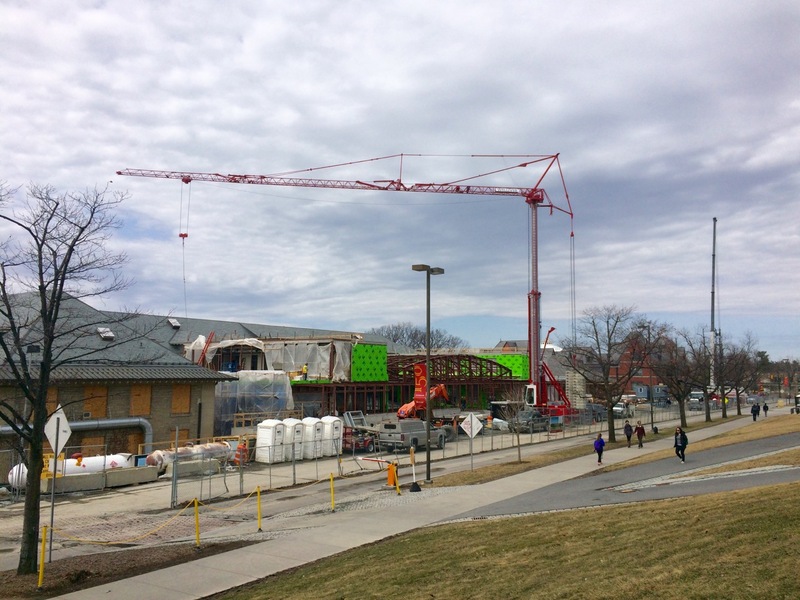 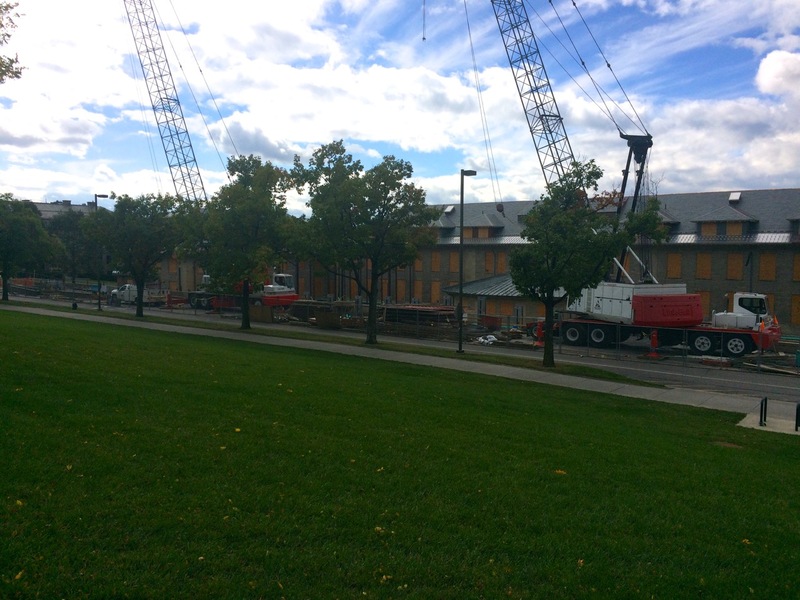 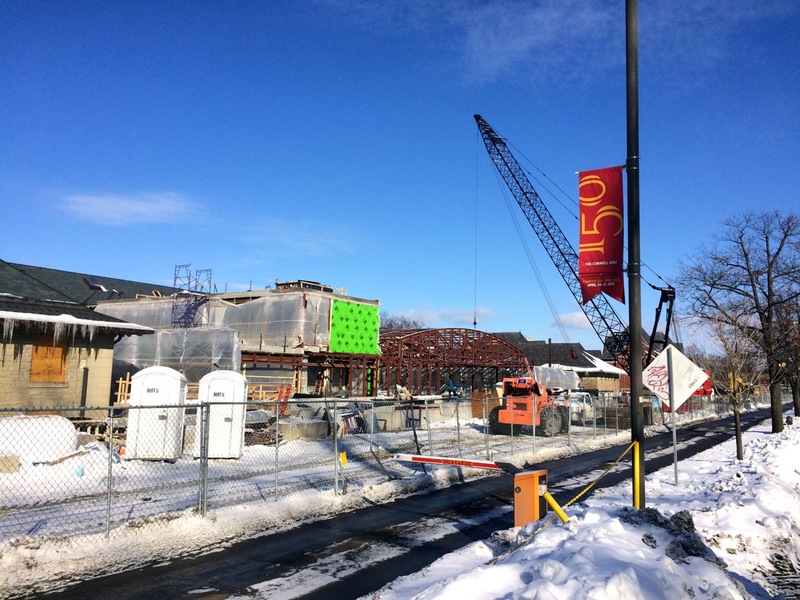 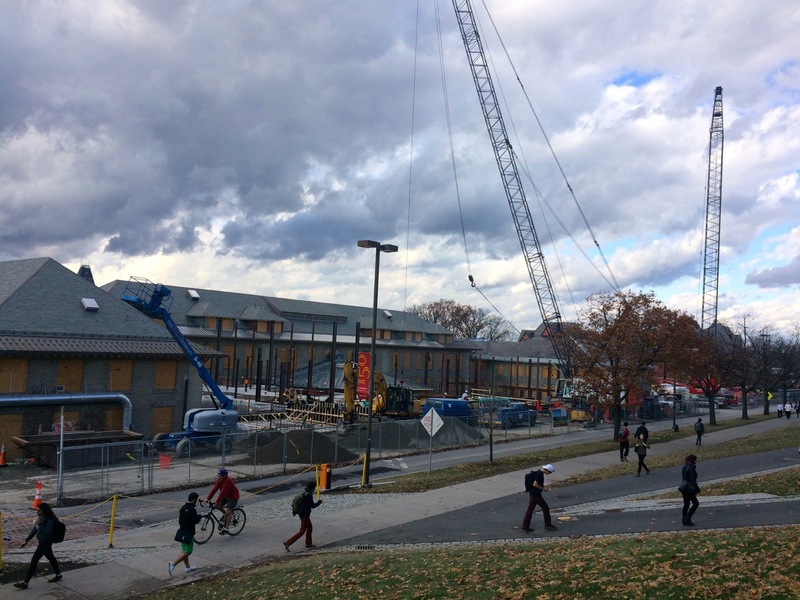 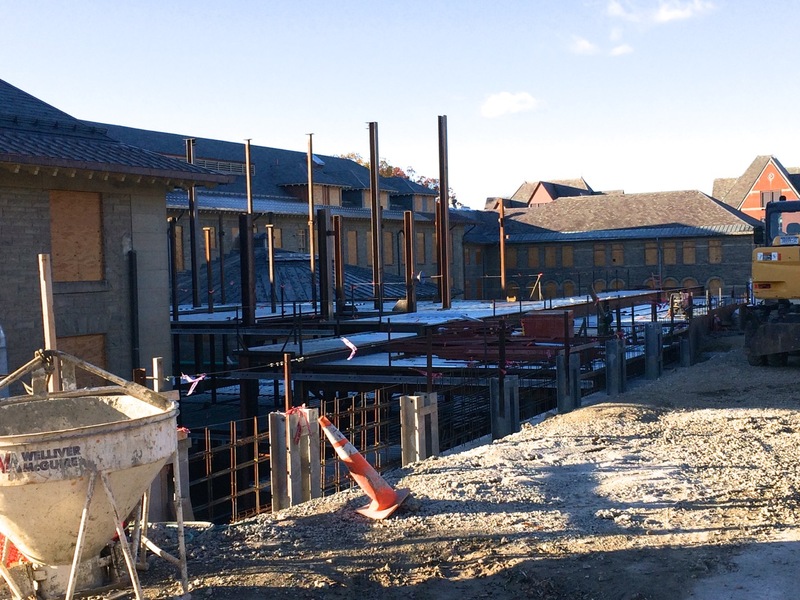 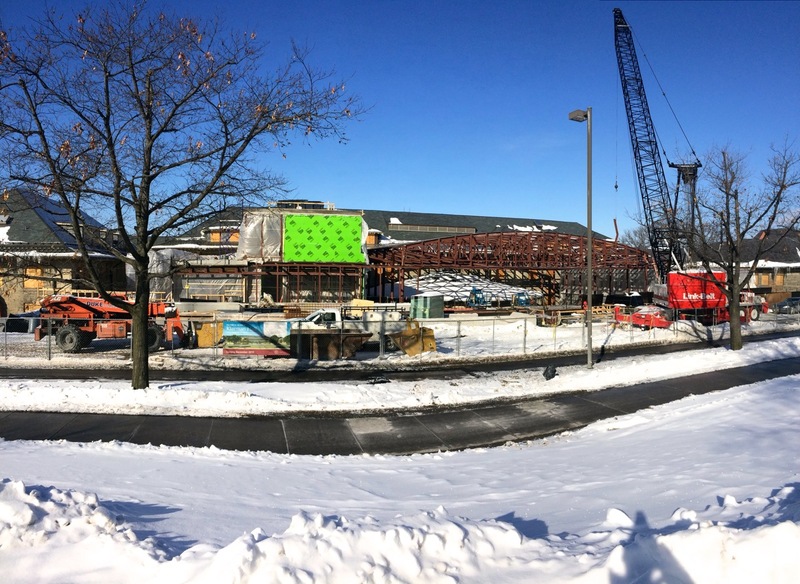 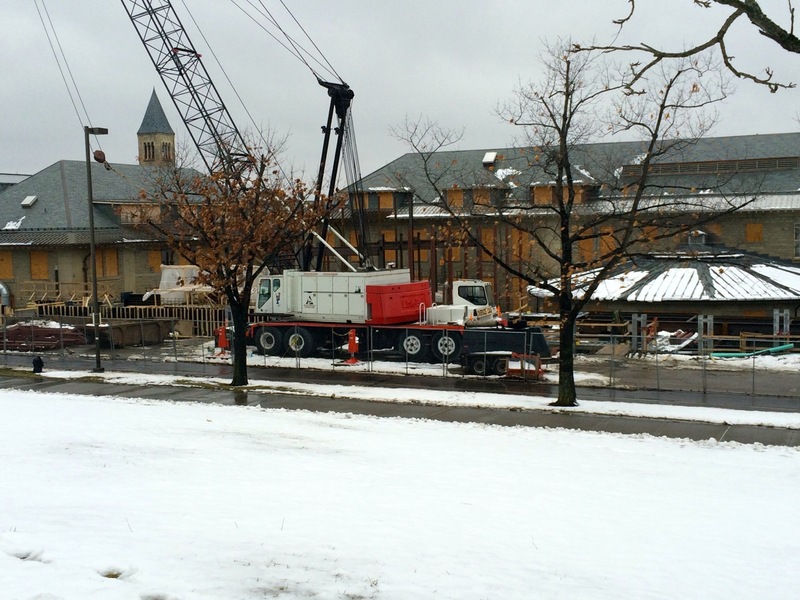 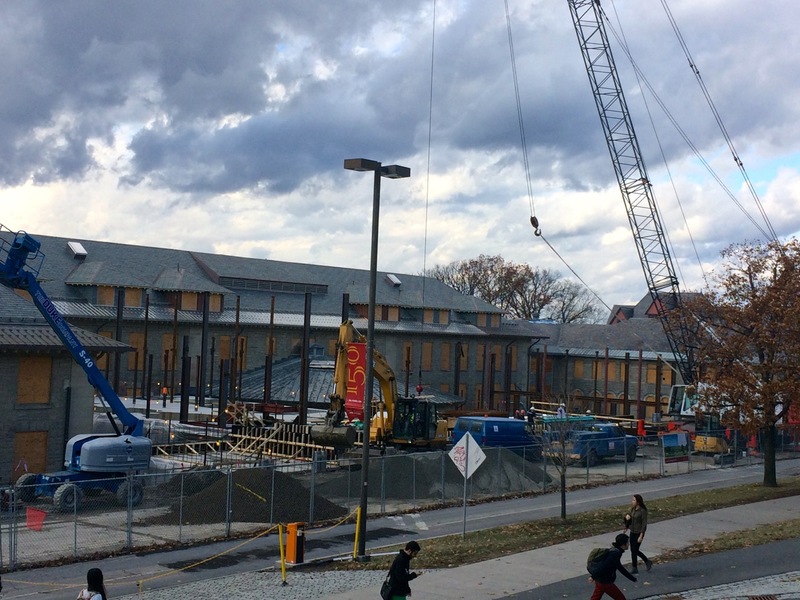 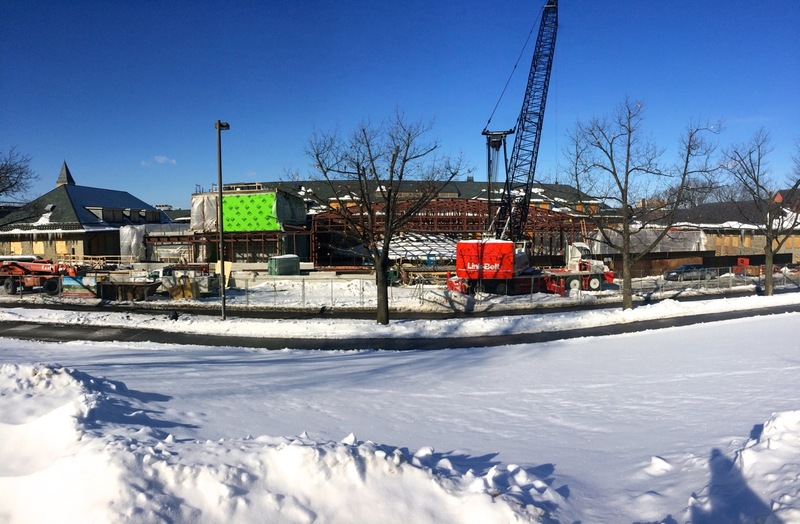 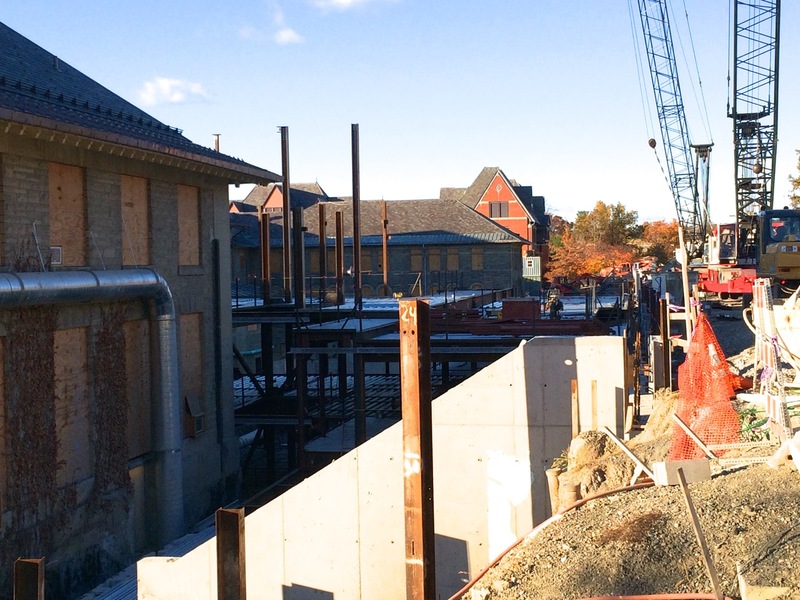 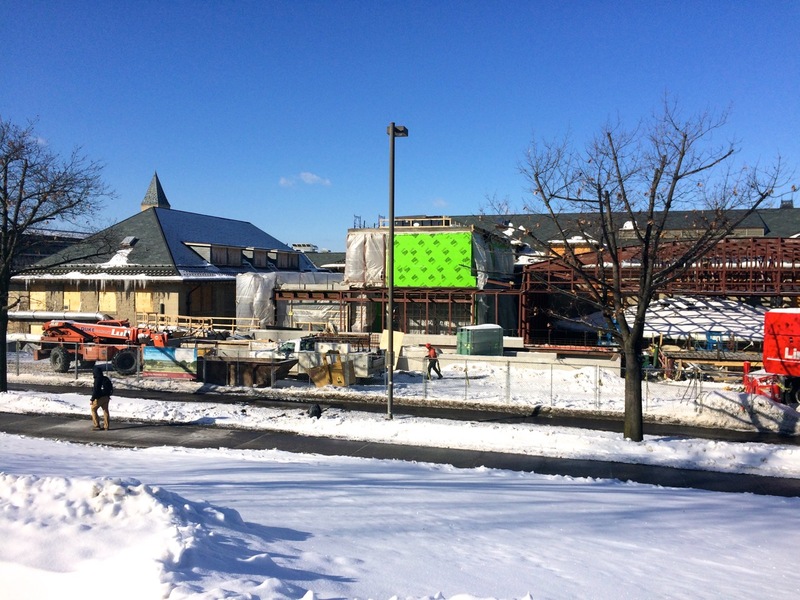 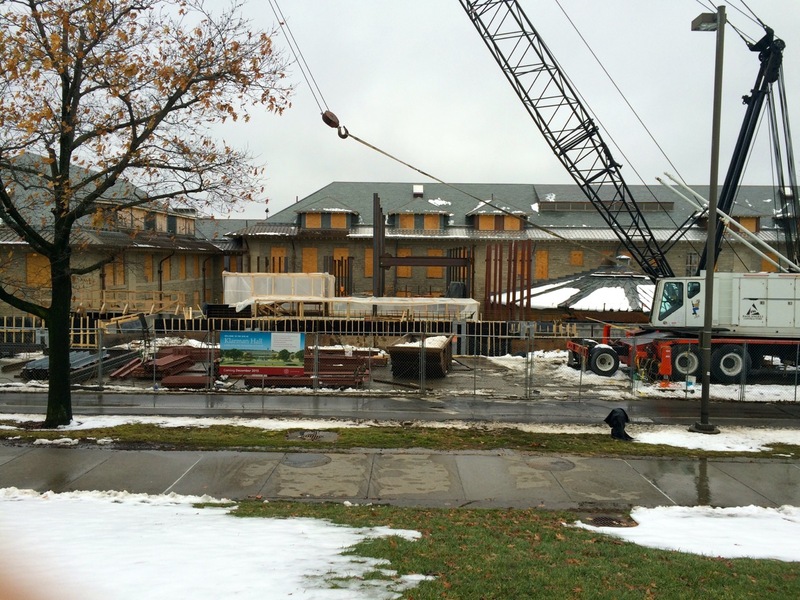 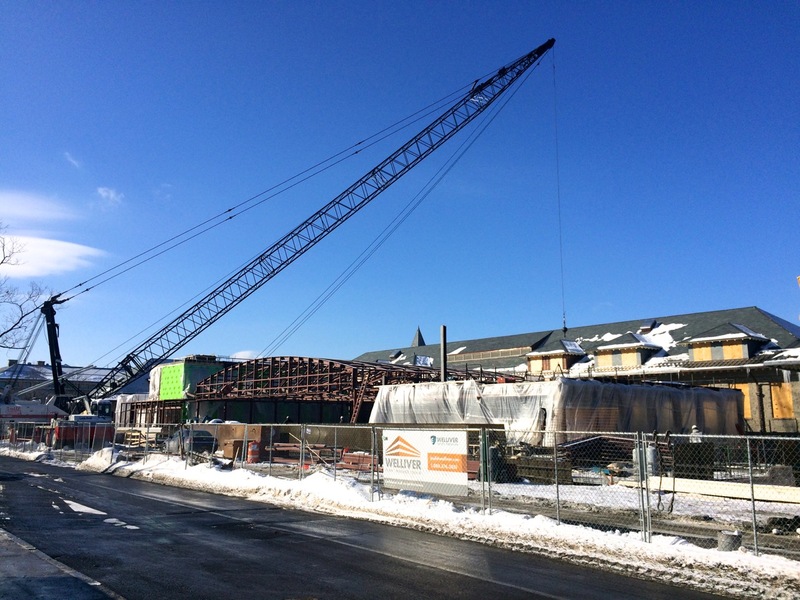 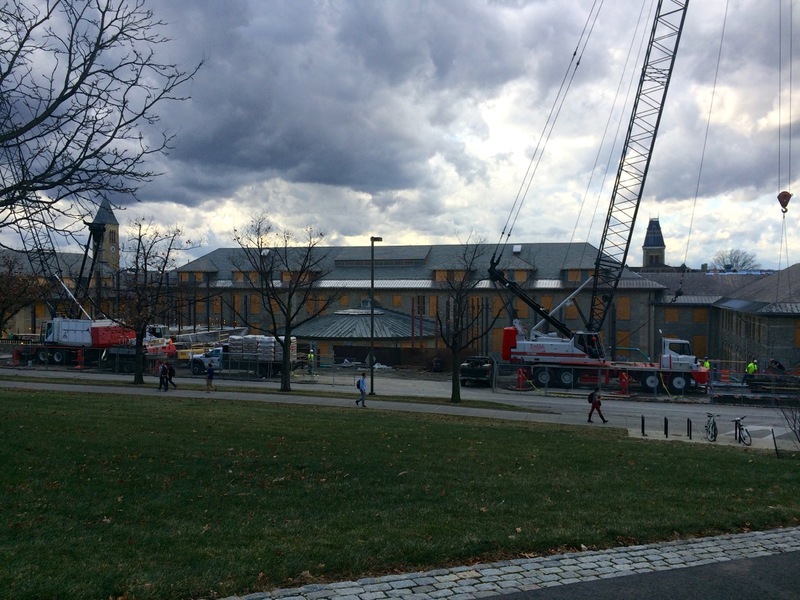 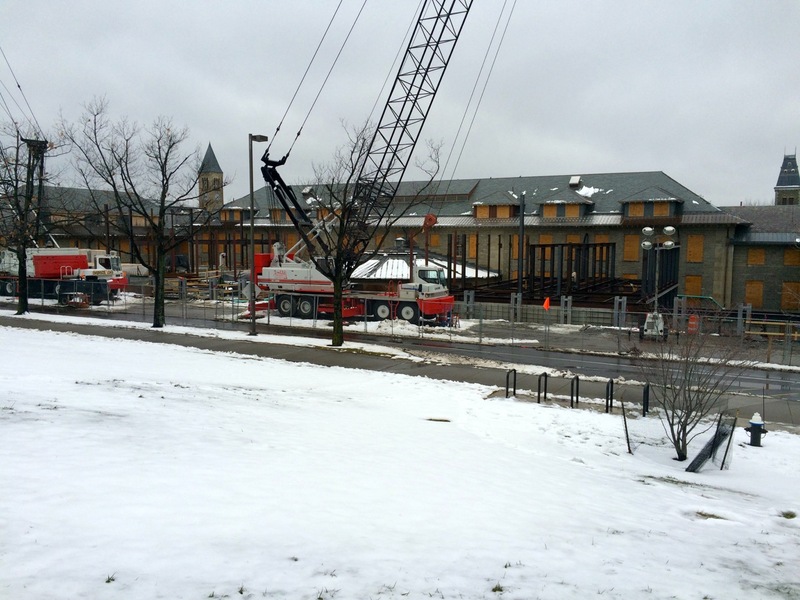 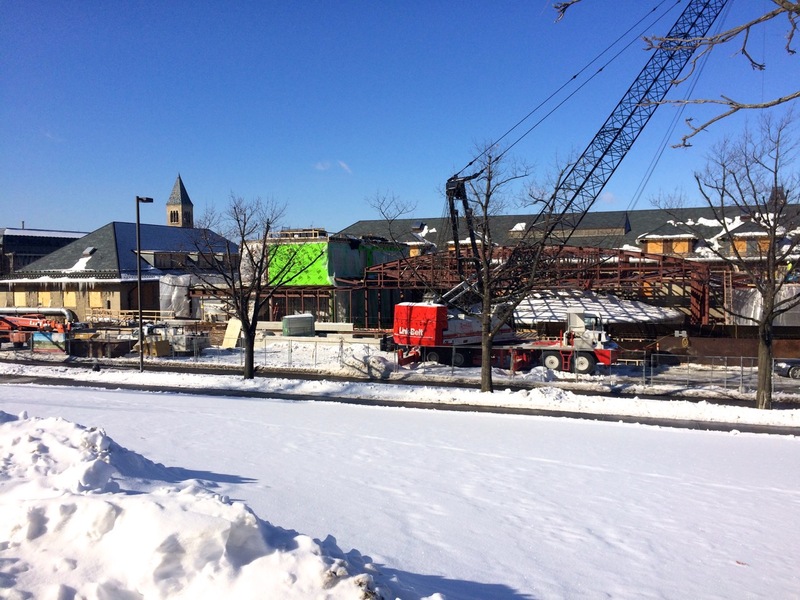 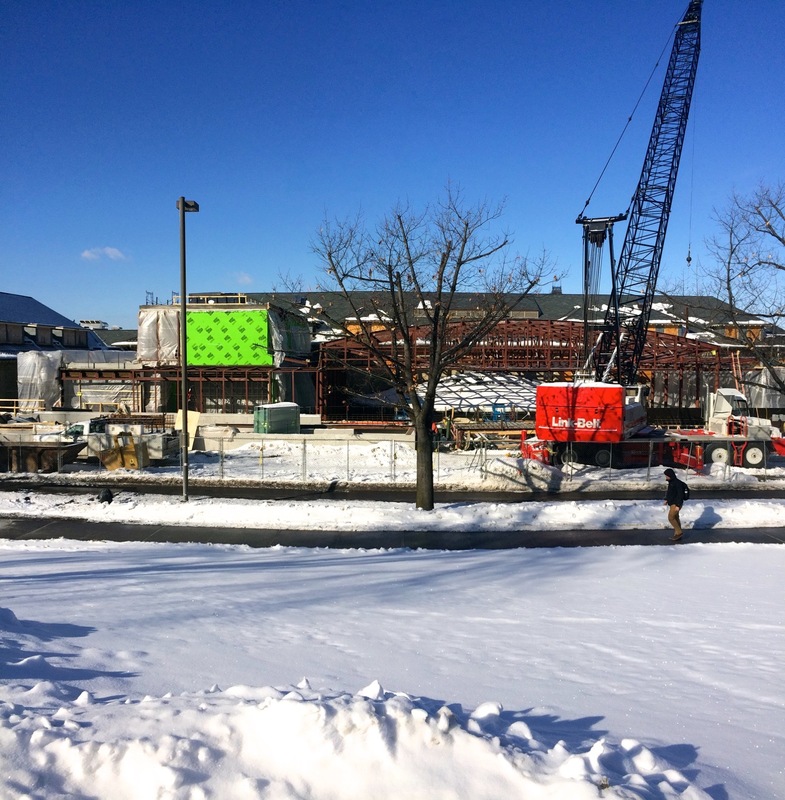 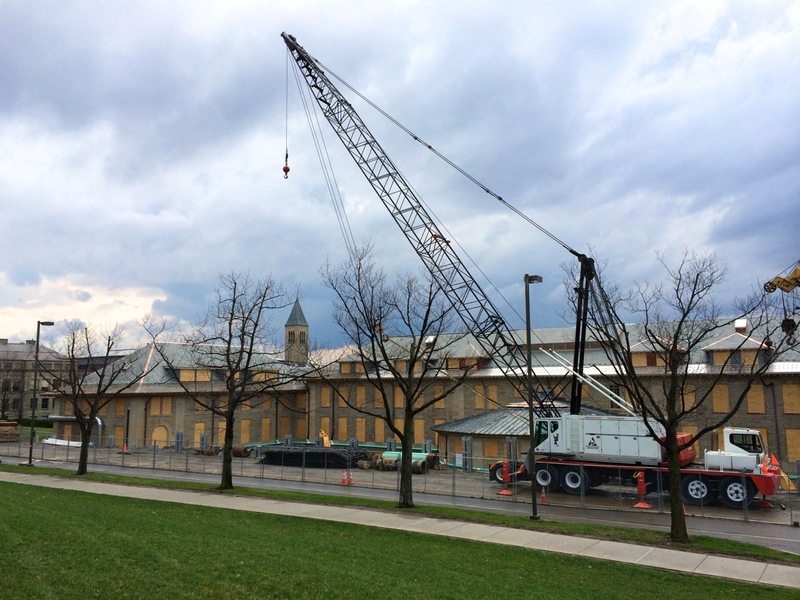 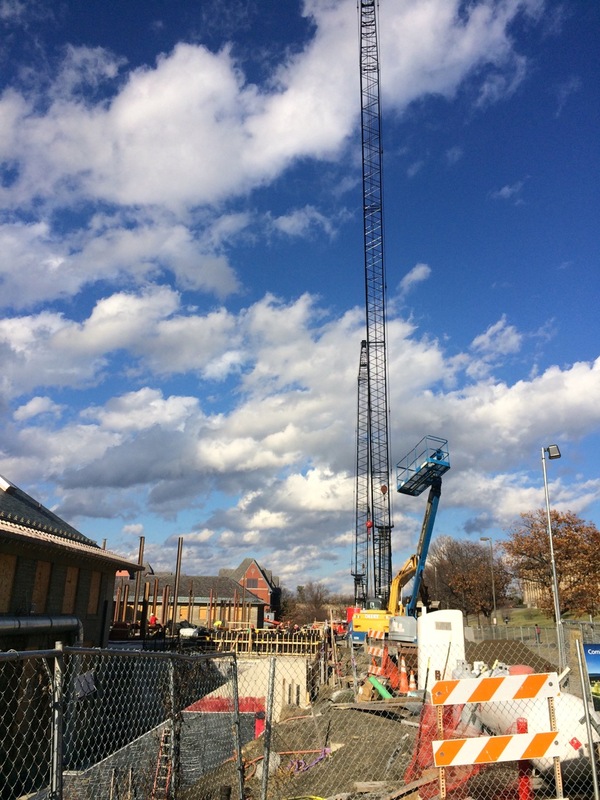 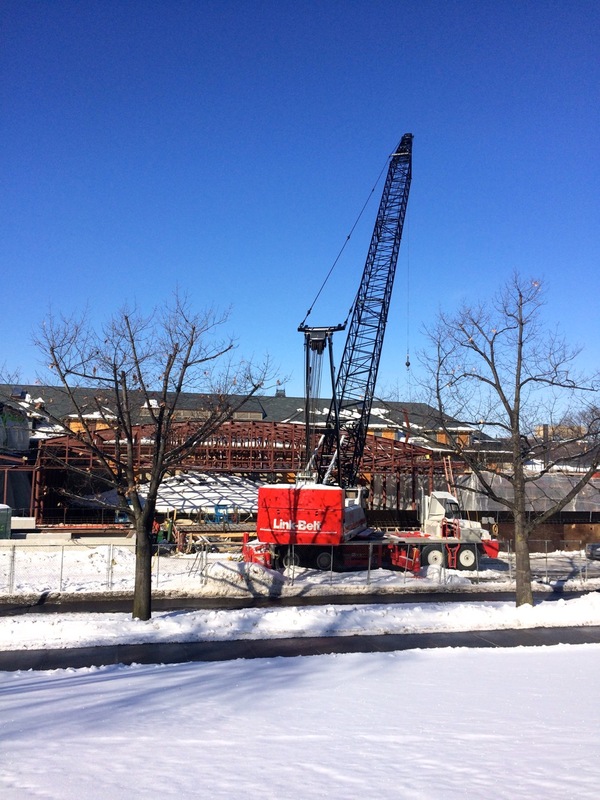 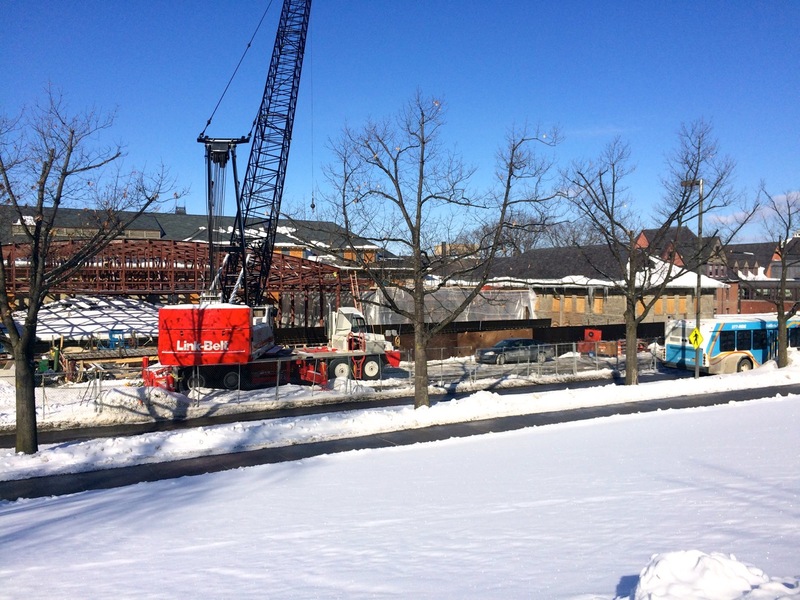 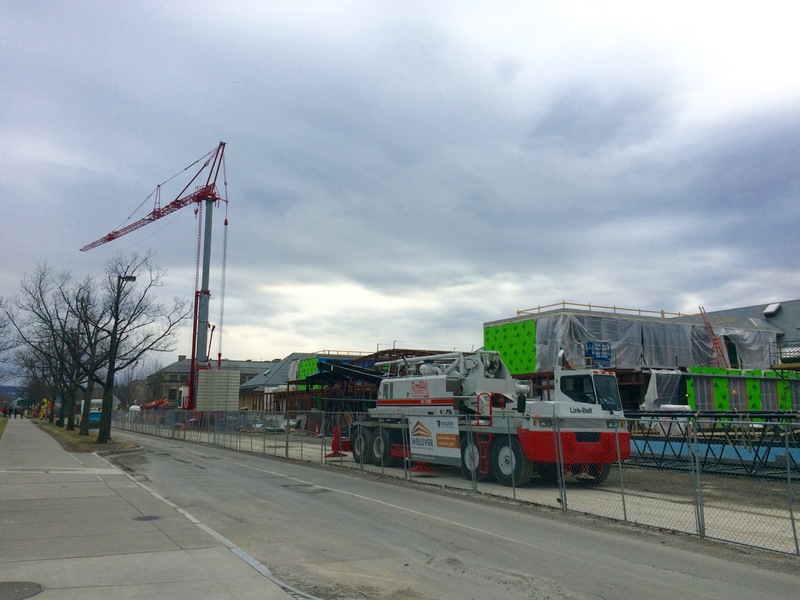 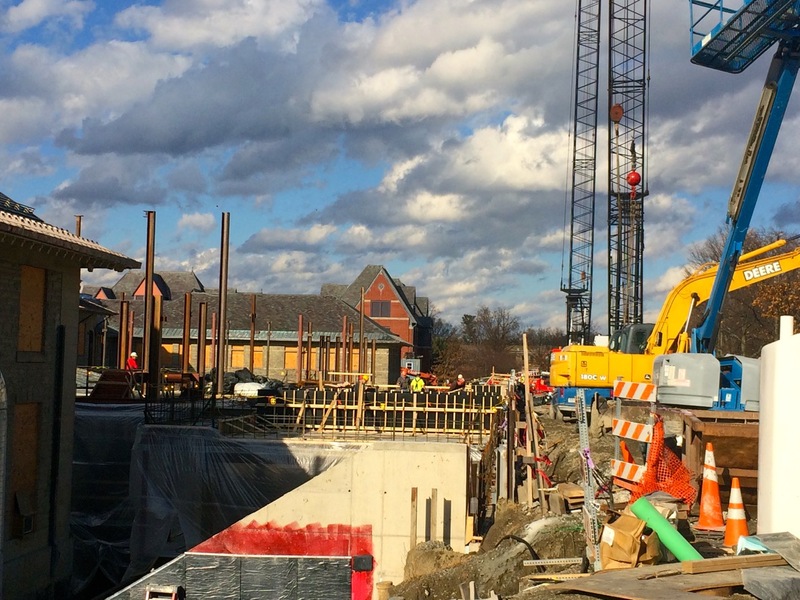 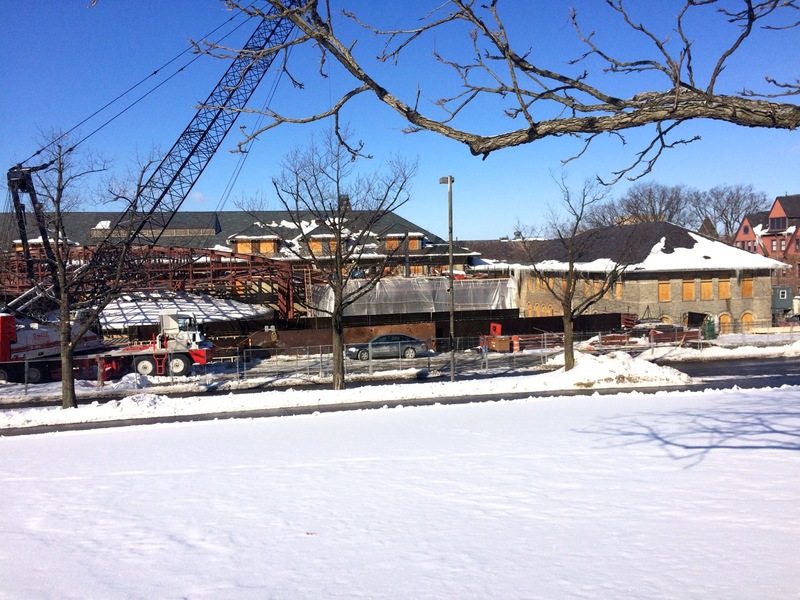 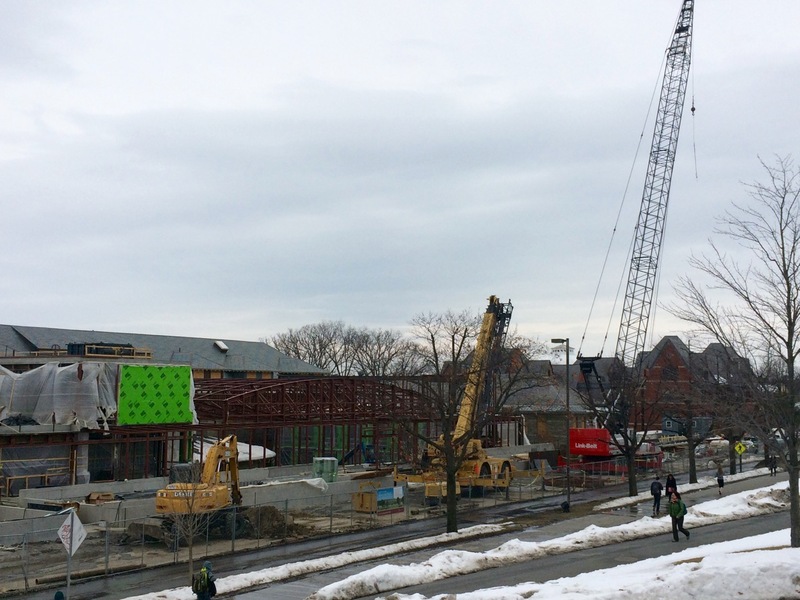 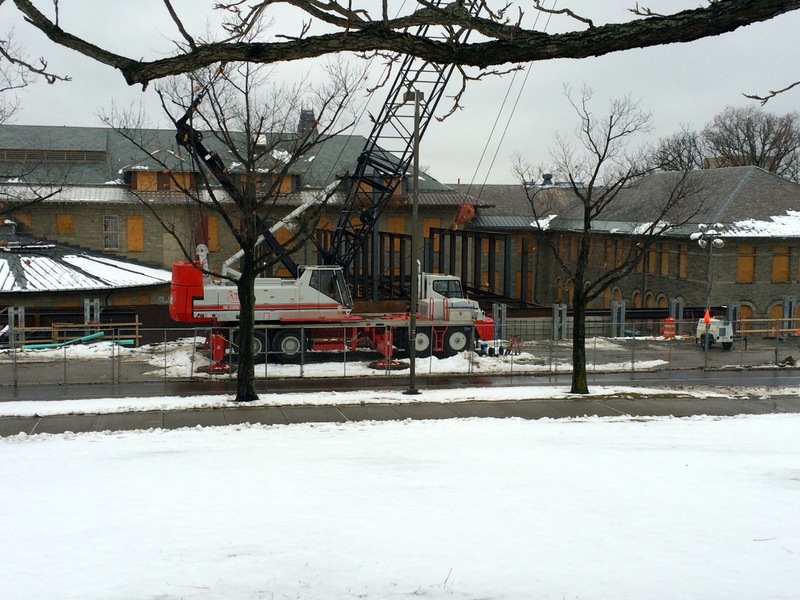 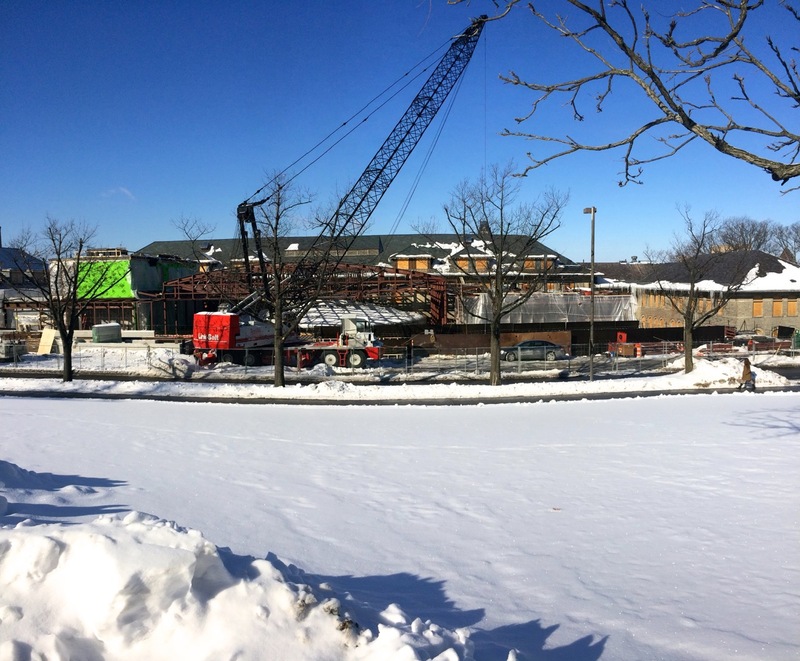 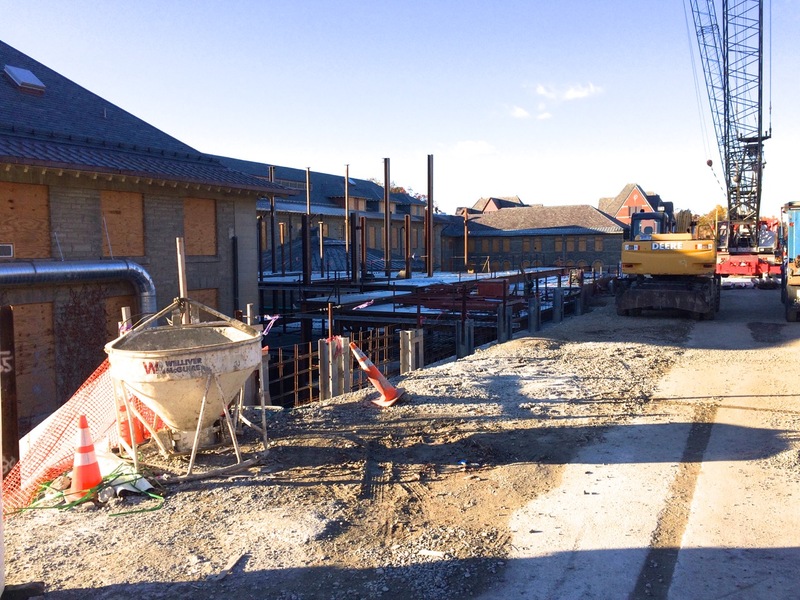 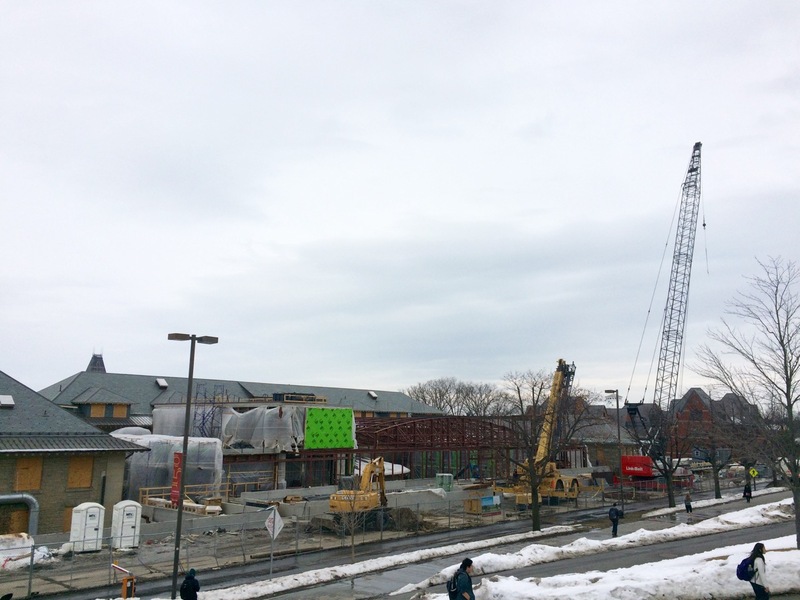 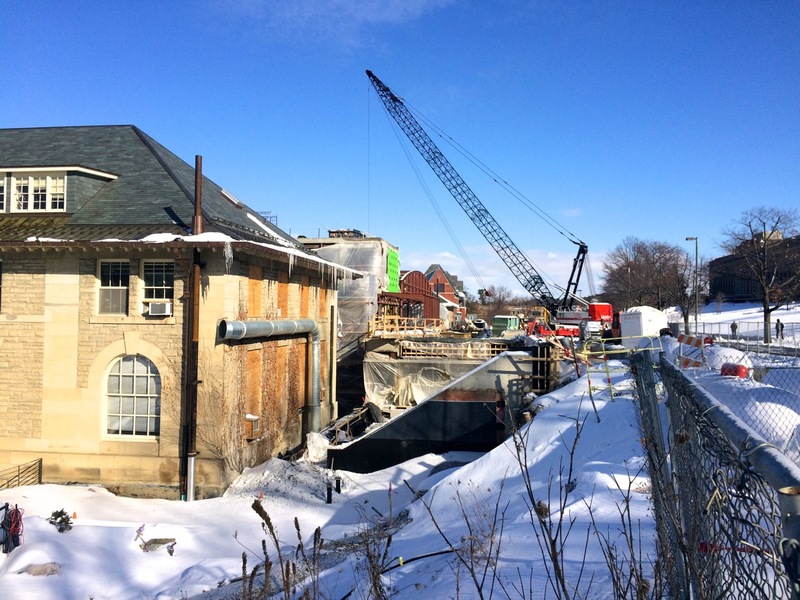 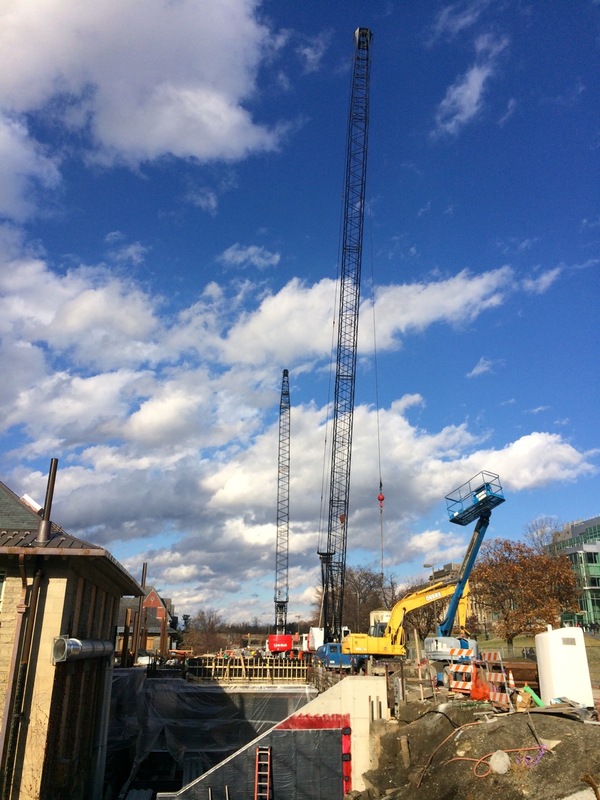 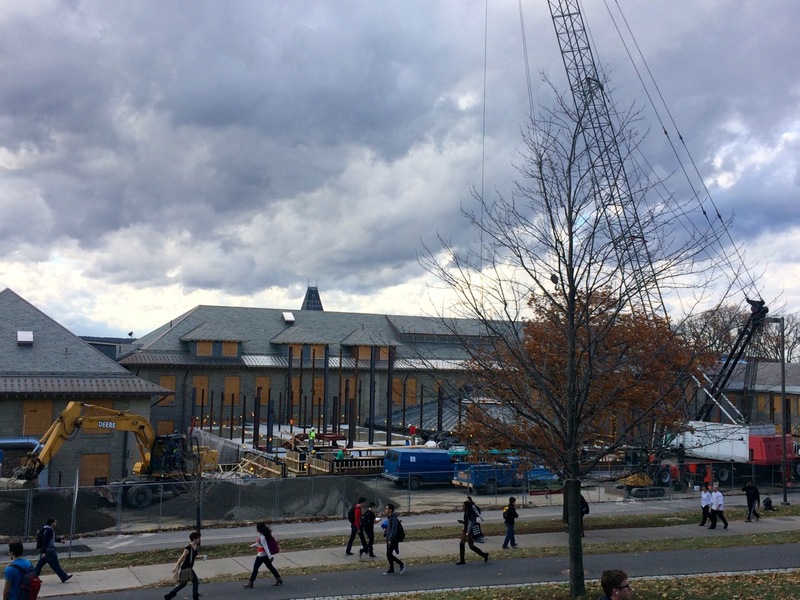 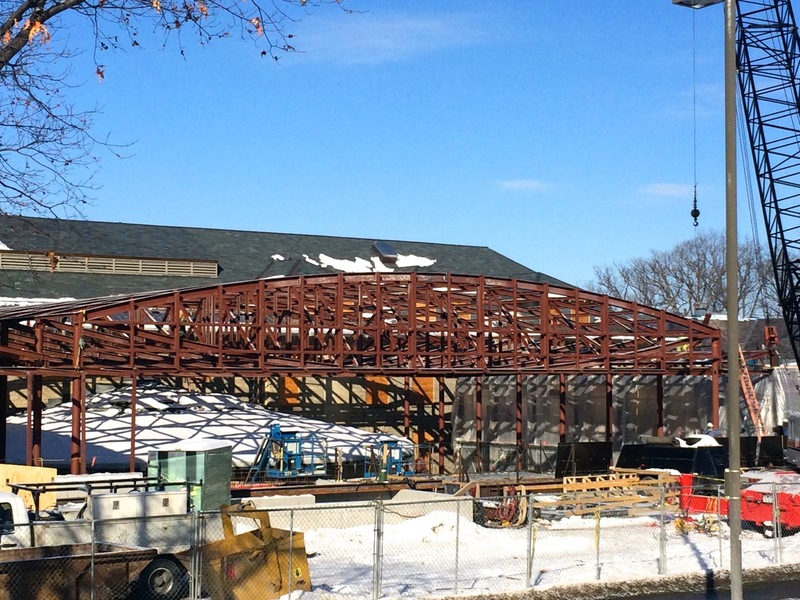 Welliver has been working away on Cornell’s 33,250 square-foot Klarman Hall Project throughout this winter, and in the next week or so, should be complete with all structural steel components. 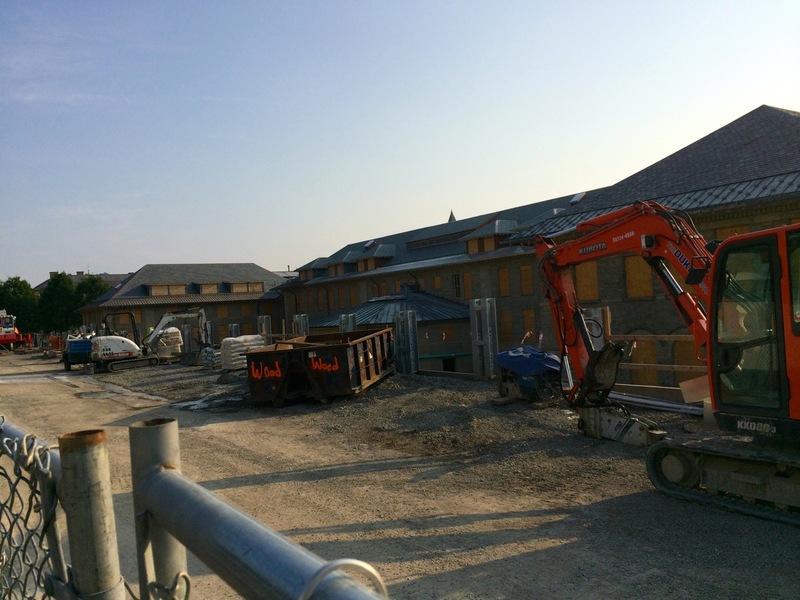 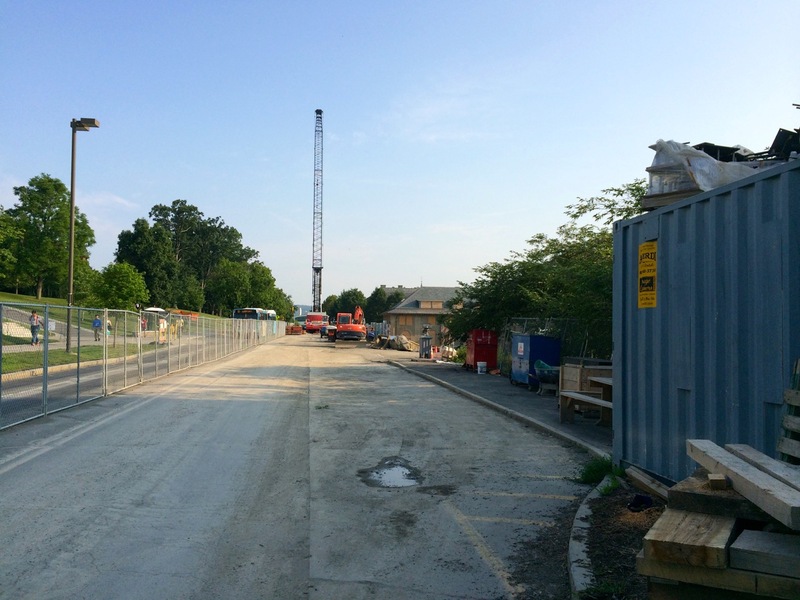 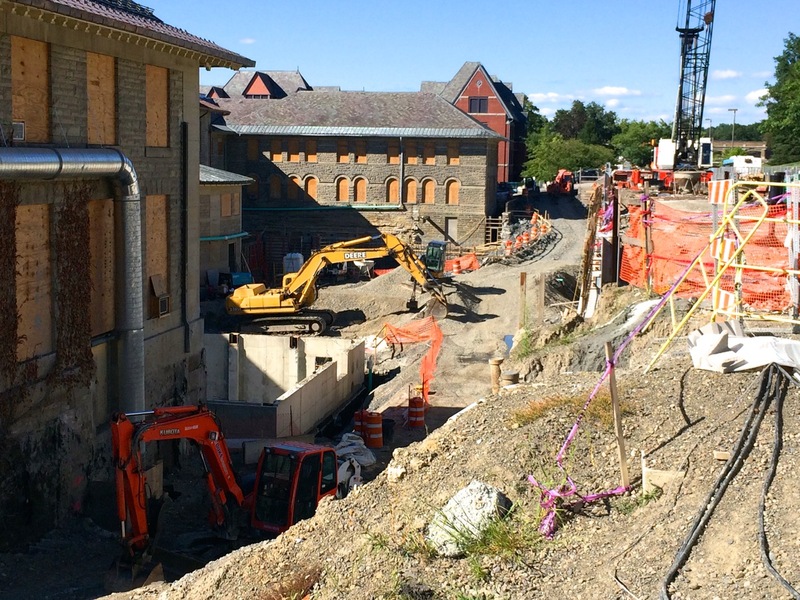 The construction has been split between the south and north sections in each phase since starting the enabling work in September 2013 and pursuant foundation excavation and foundation footings in July 2014. 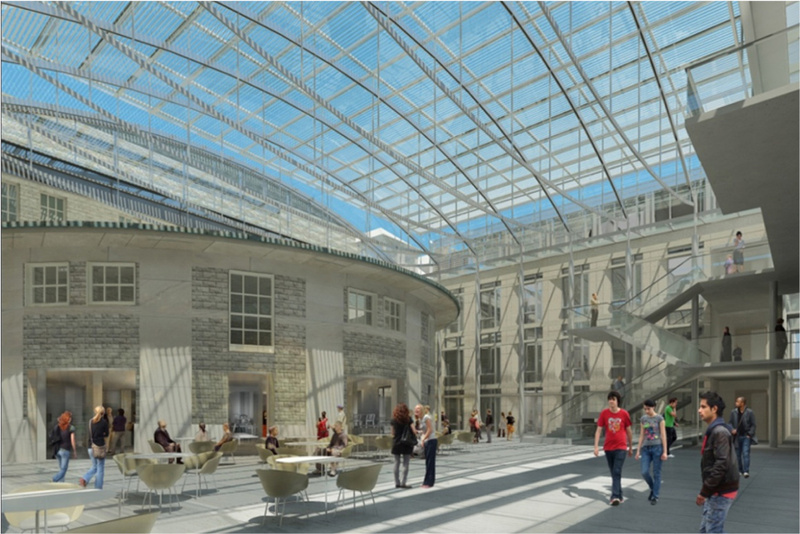 The two sections contain classrooms, offices, and the north section a 350-seat auditorium, and are joined by a large interior atrium, utilizing the rotunda of Goldwin-Smith Hall for seating, food/cafe counter service, and ingress/egress. 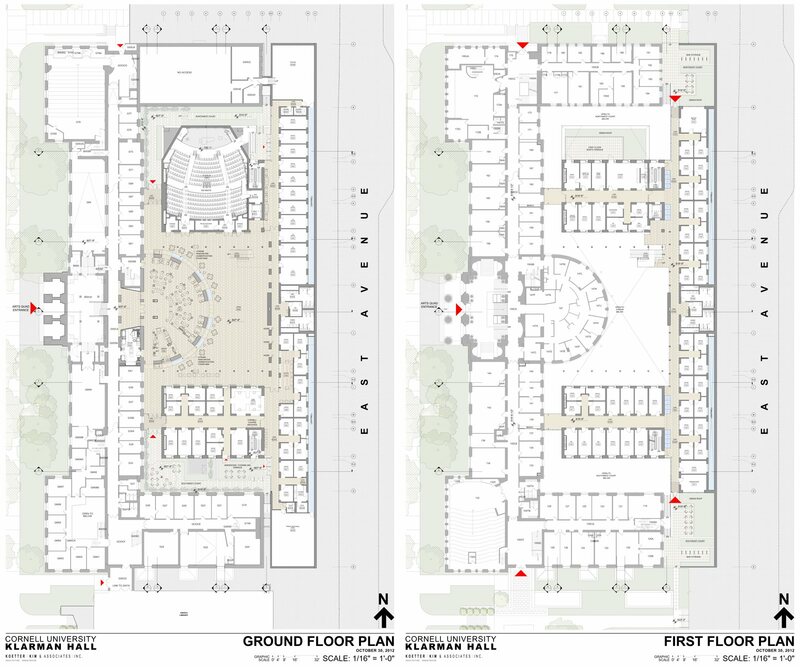 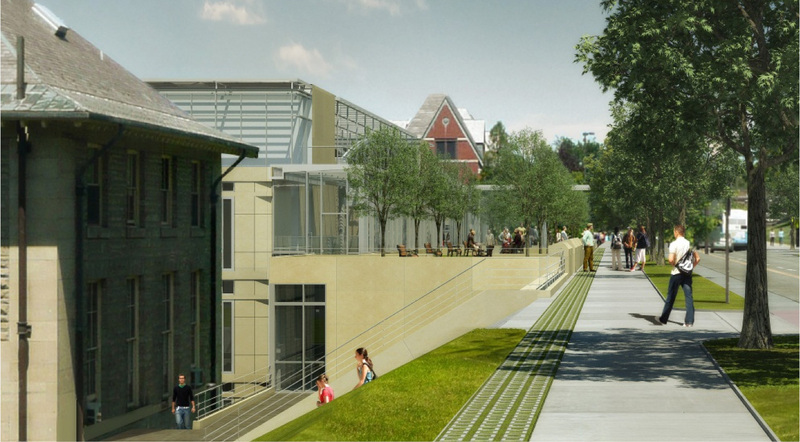 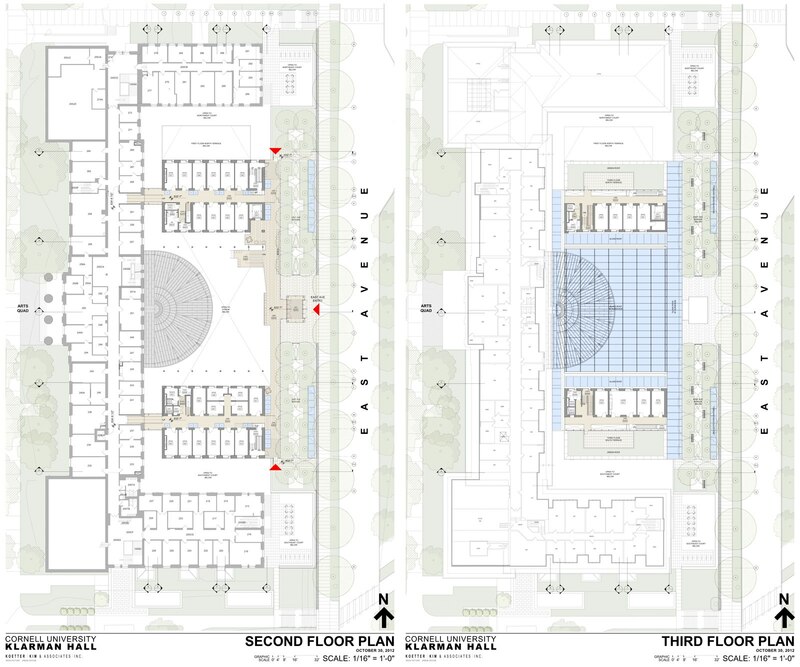 Klarman and Goldwin-Smith will be combined through several connecting hallways and common areas as well, as shown in the plans below. 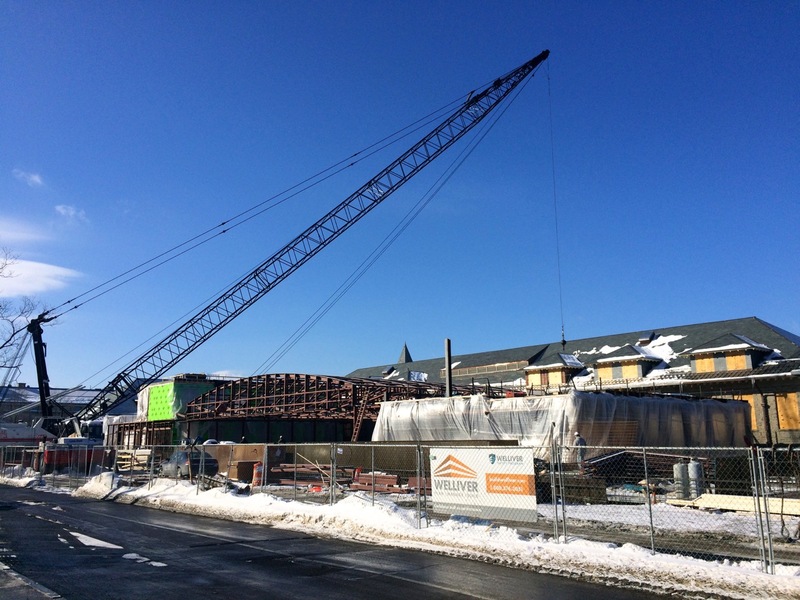 Since October, the structural steel contractor Raulli & Sons Ironworkers out of Syracuse have been delivering, craning, bolting, and welding the steel columns and beams into place, along with the massive atrium trusses that stretch the two main structural sections. 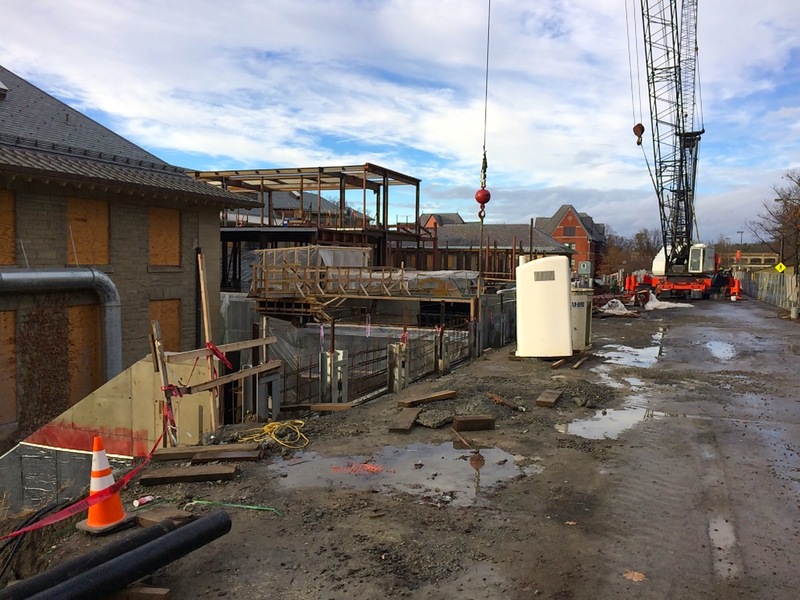 As steel finished-up on the south section late November, crews moved-in to deck the floors with corrugated sheet metal and applied steel mesh to reinforce the concrete floor pours. 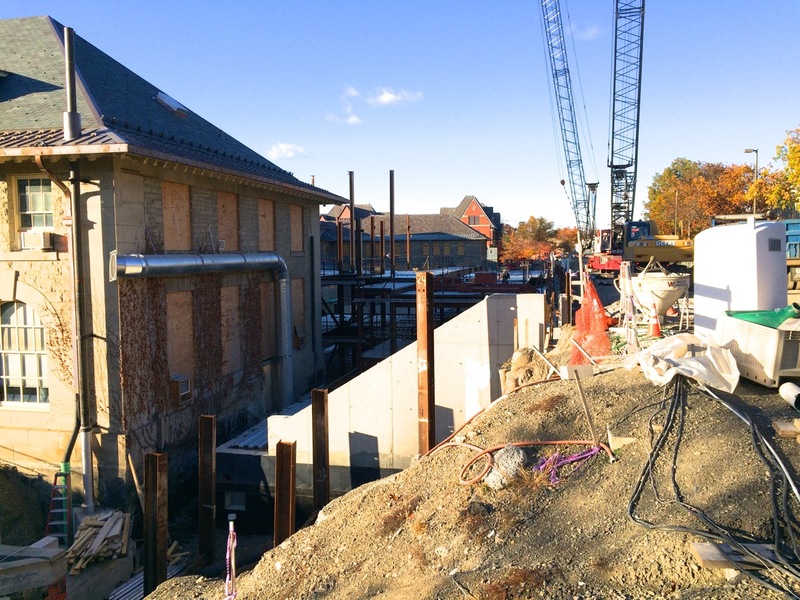 Once the concrete dried in January, framers came in to frame the walls with steel studs and sheetrock the walls. 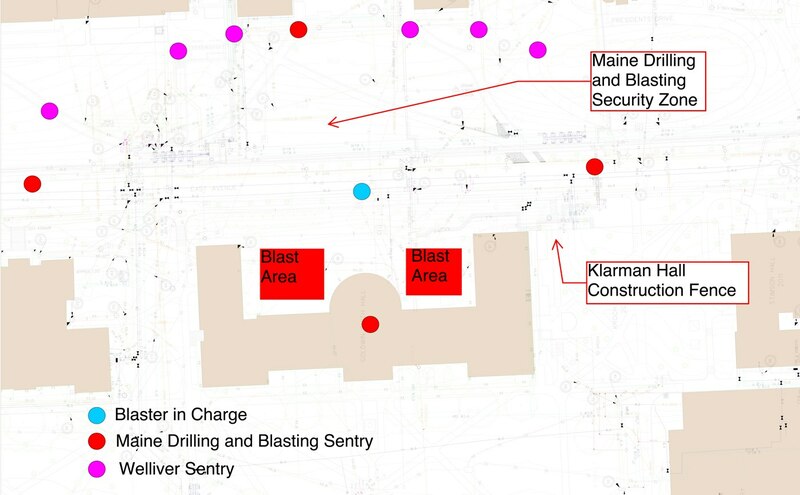 According to the schedule (end of post), Josef Gartner comes on-site to mobilize this march to install the glass atrium. 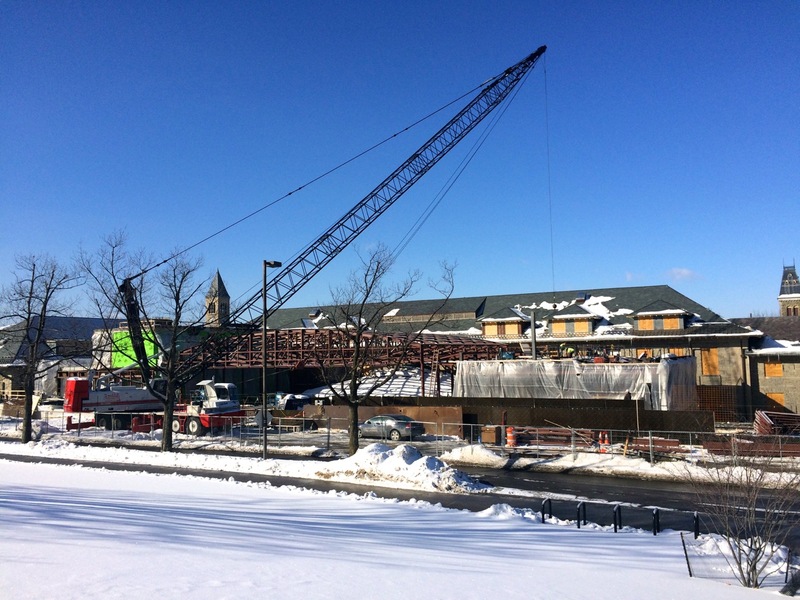 Once the large hoist crane for the steel is off-site, and the lane is cleared of equipment, East Ave will be opened-up to two-way traffic again by April 20th. 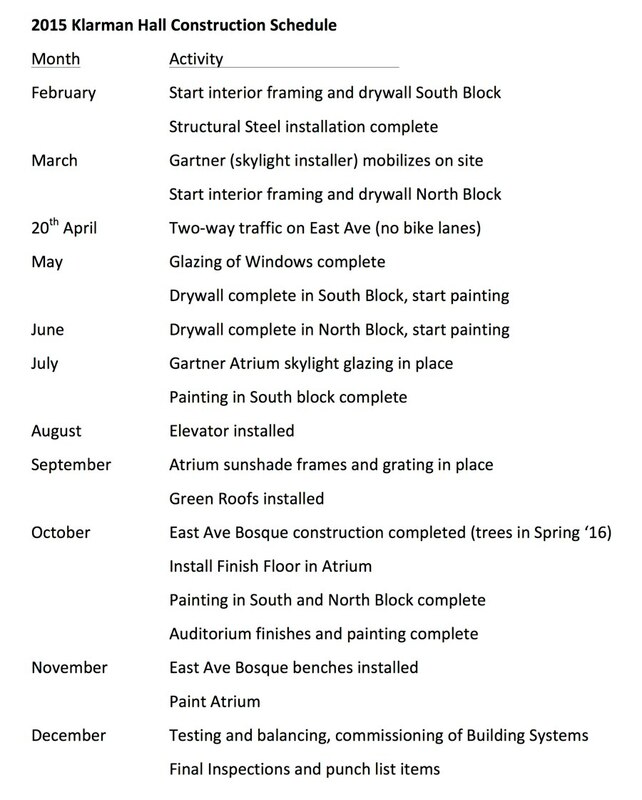 Speciality trades, framing, and drywall will take-up much activity on both the South and North Sections until June/July, and by the Fall, painting, building systems, and finish-work will be left to tackle. 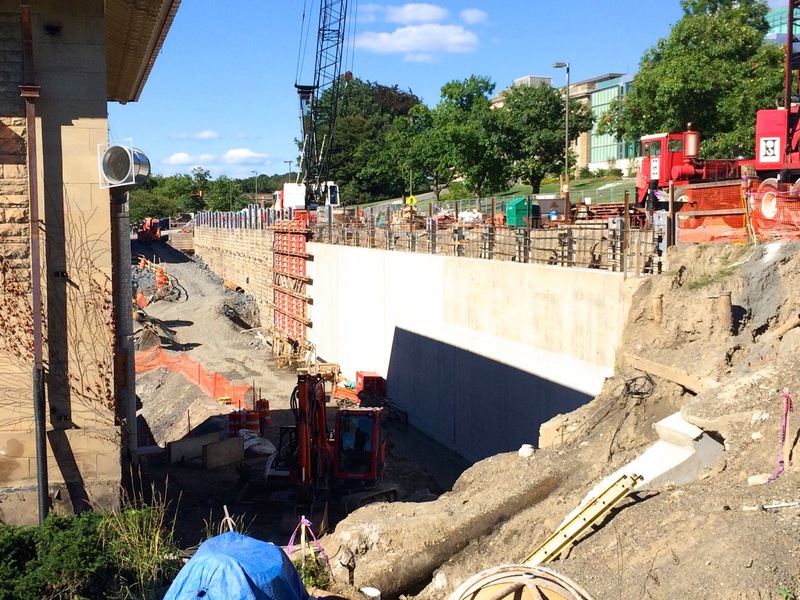 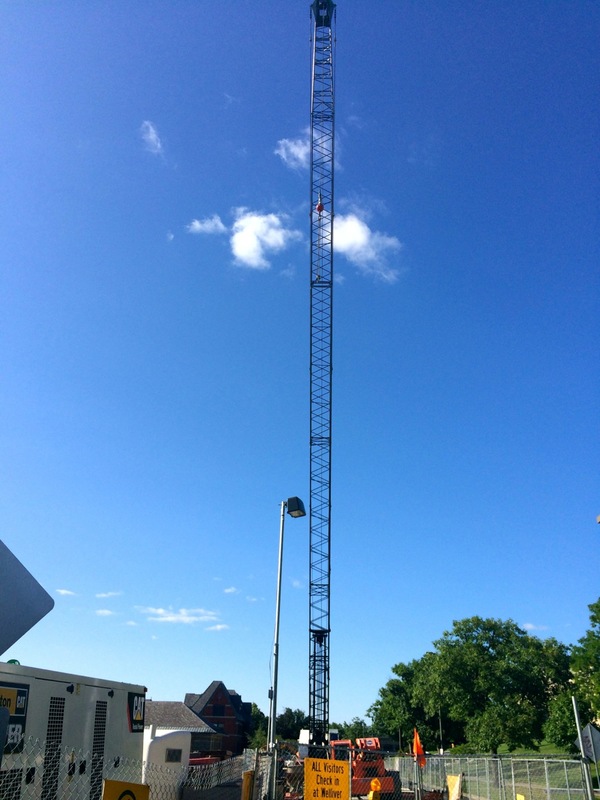 The project is slated for a December 2015 delivery. 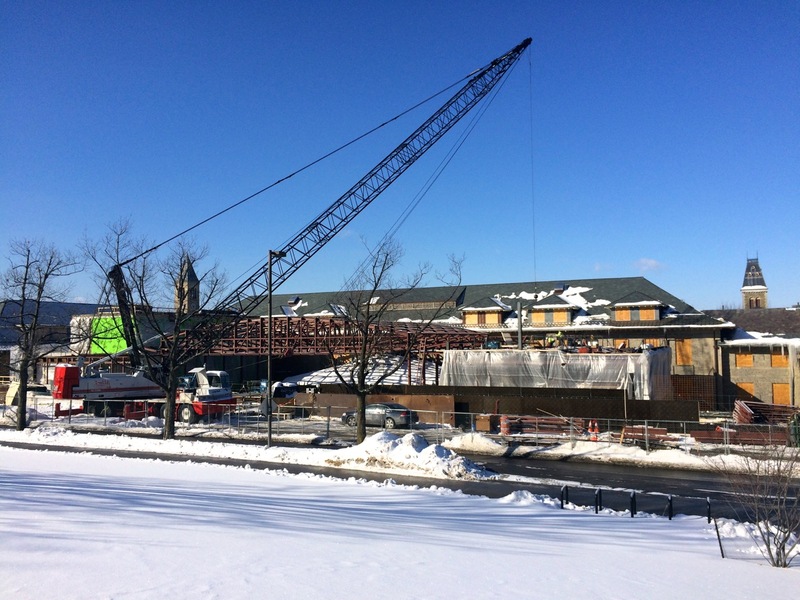 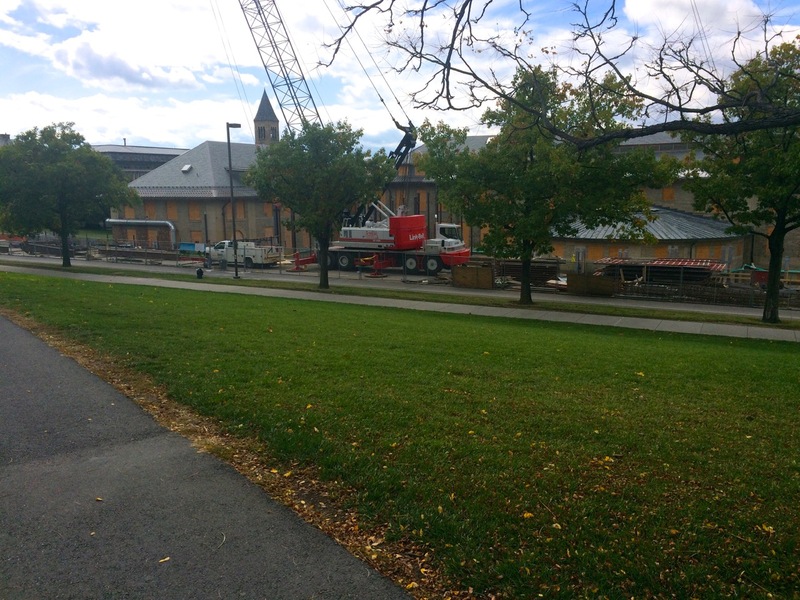 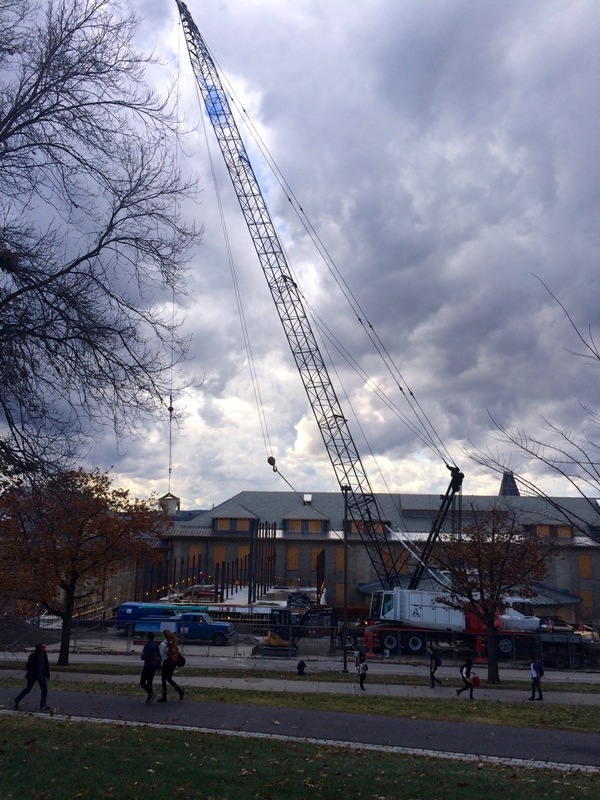 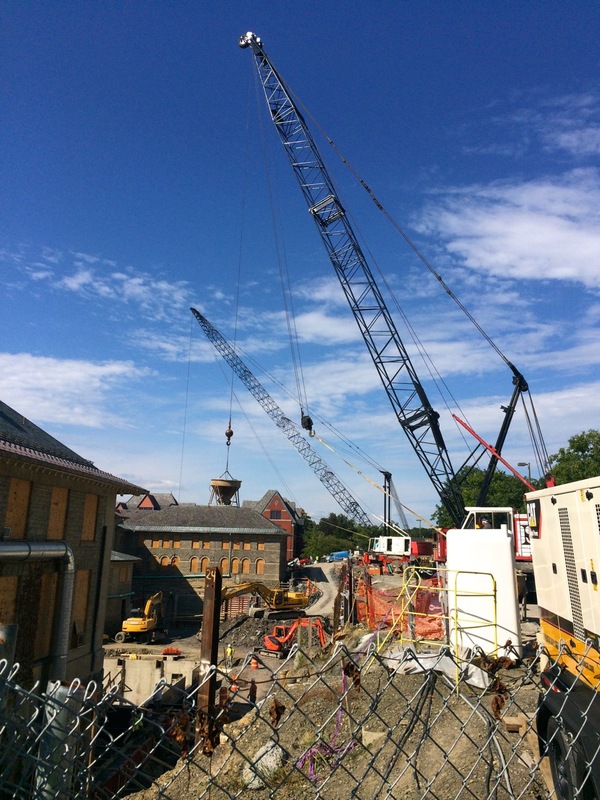 Cornell’s future 33,250 square foot Klarman Hall project being built by Welliver has finished-up the north and south foundations, and steel erectors are on site craning and bolting steel columns and beams in place on the south end. 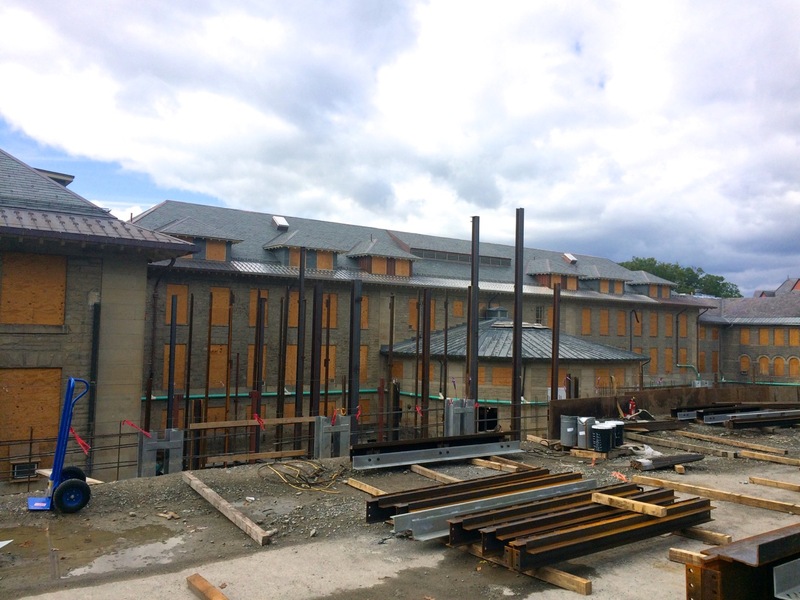 The columns are anchored to each foundation footing cap or pier, then the beams between each column are bolted and welded to the proper connection. 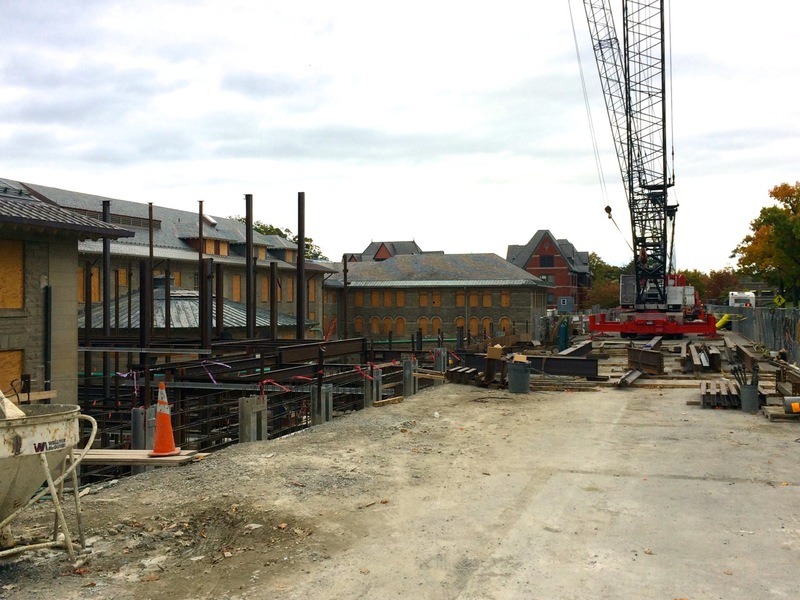 The north end’s steel work should be completed by early November, and we’ll see the atrium steel assembly commence and complete throughout November. 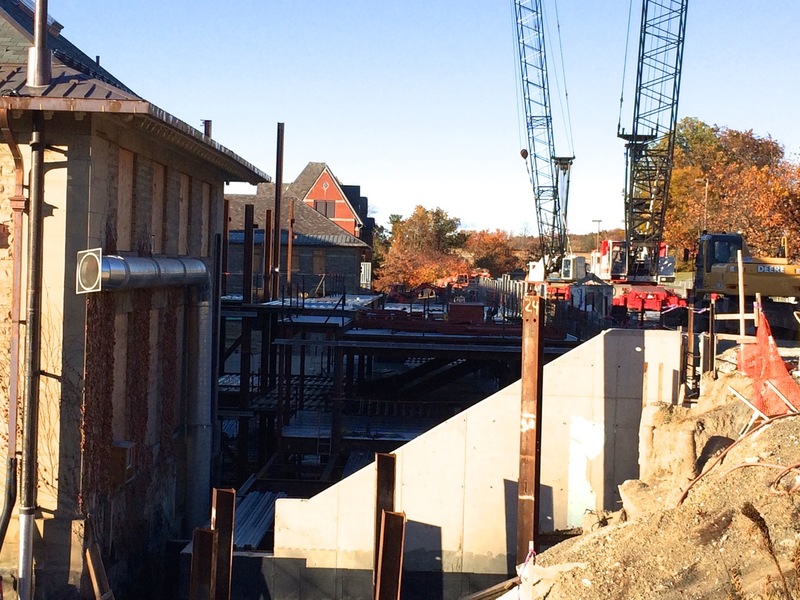 The future 33,250 square foot Klarman Hall project being constructed between the wings of Goldwin Smith Hall by Welliver has completed the north and south foundation walls, and in addition to progress on the retaining foundation wall along East Ave, the southern concrete wall has been formed and poured. 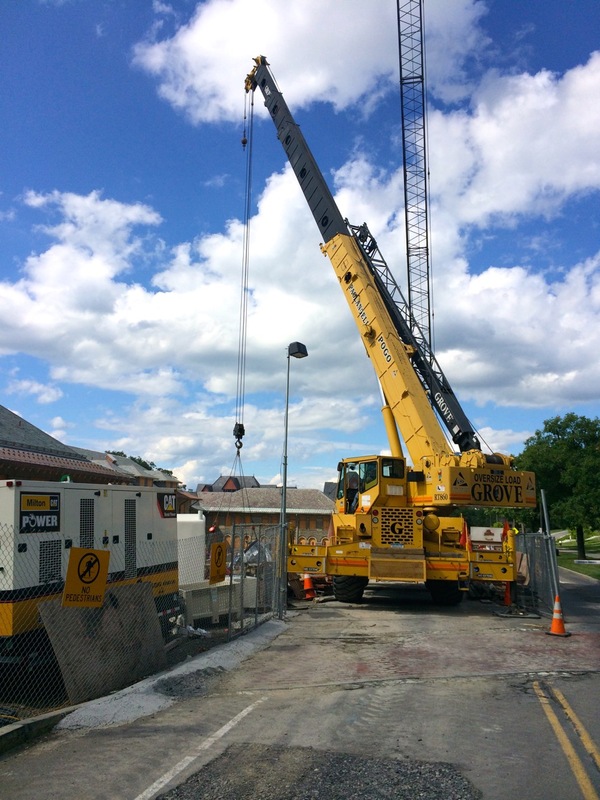 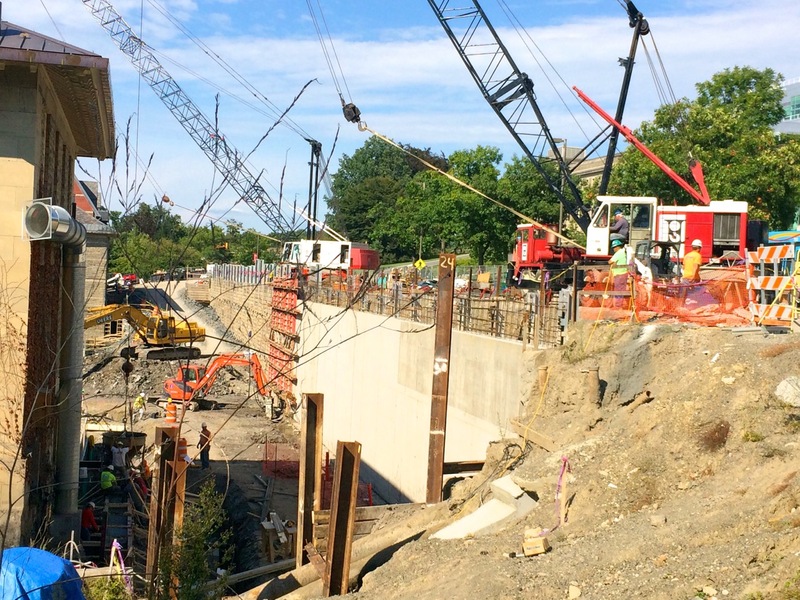 Because of the steep grade and excavation, concrete trucks park on East Ave and unload concrete into crane buckets that hoist the pours over to each form. 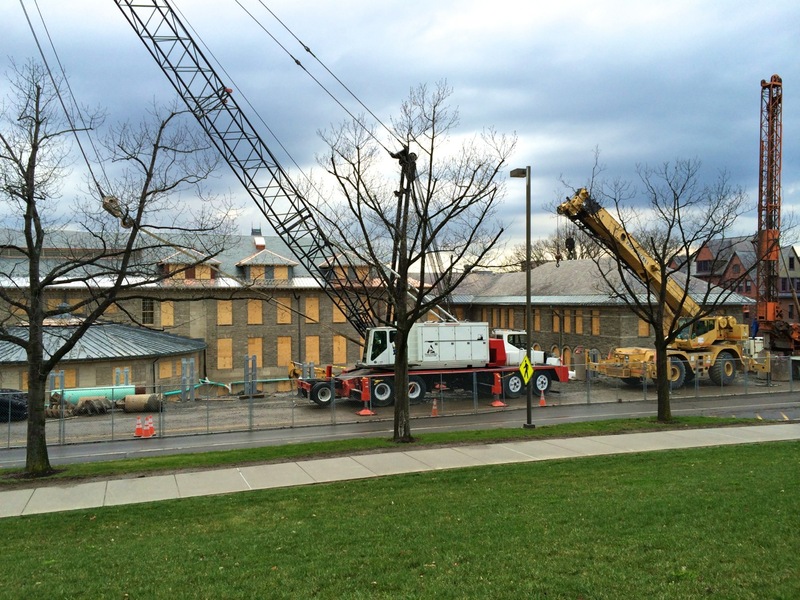 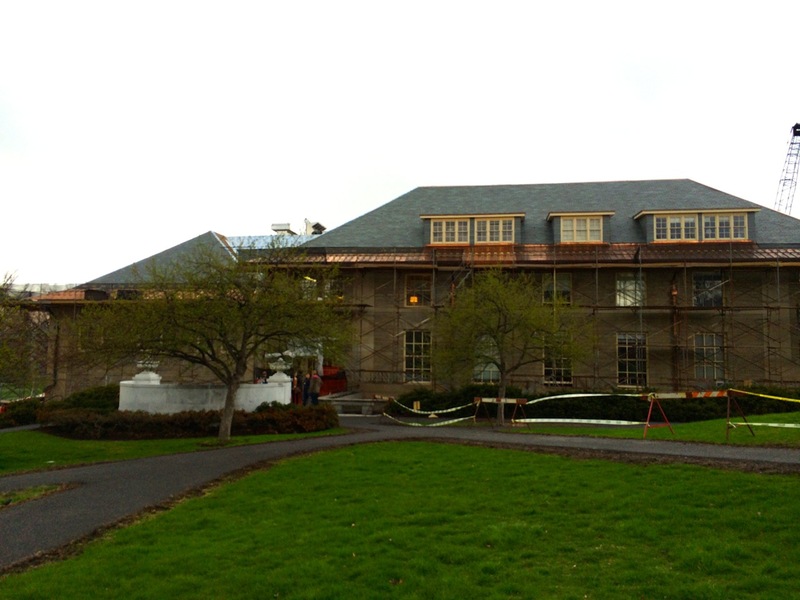 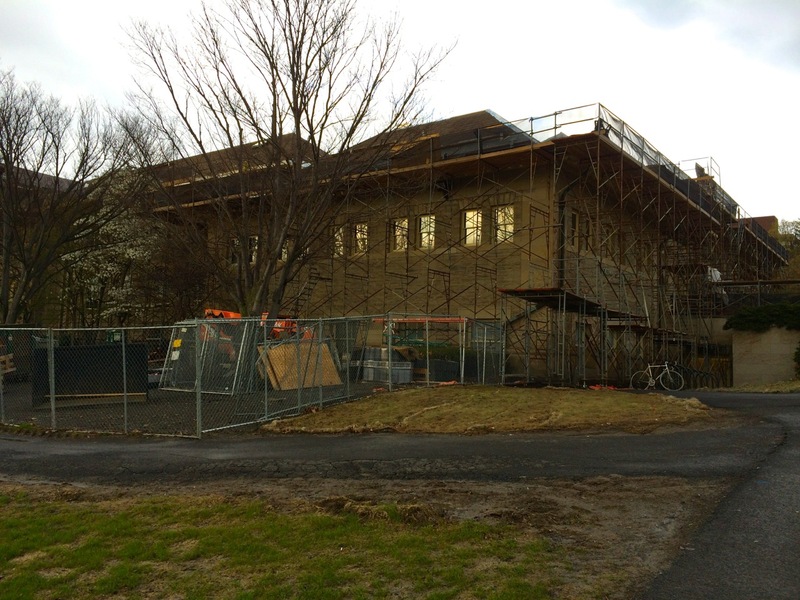 The structure represents Cornell’s first Humanities Building in over 100 years (Goldwin Smith was built in 1892). 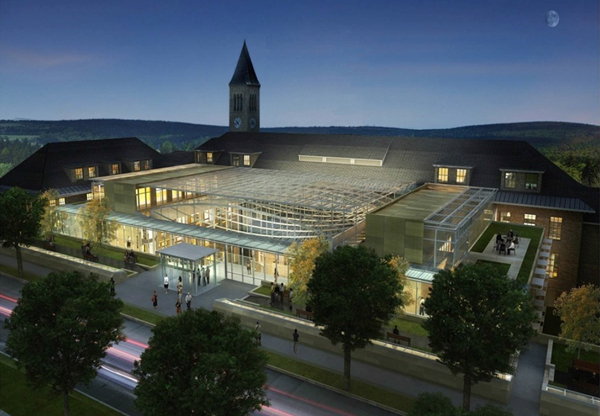 The design was done by Koetter | Kim & Associates. 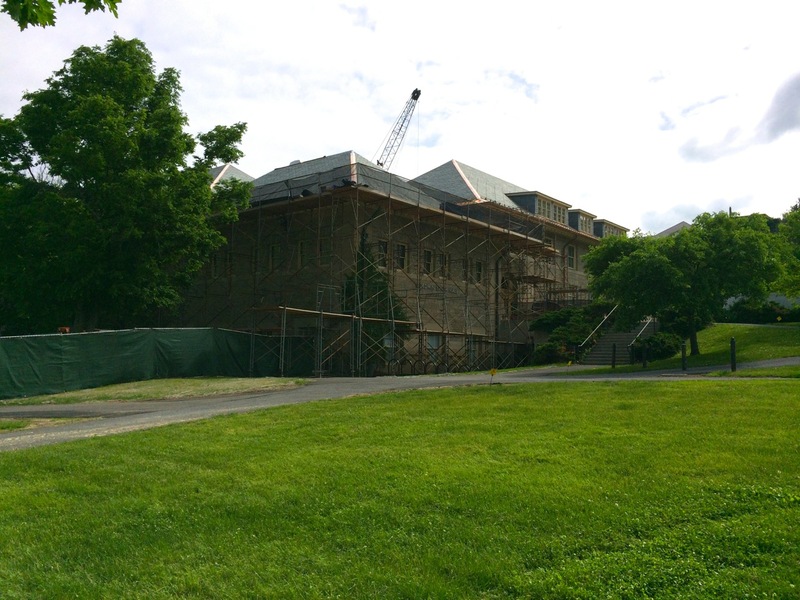 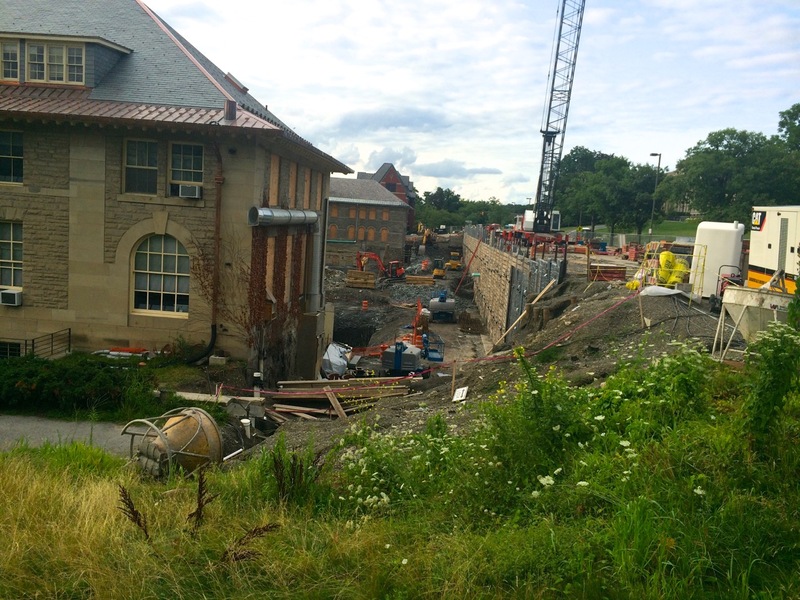 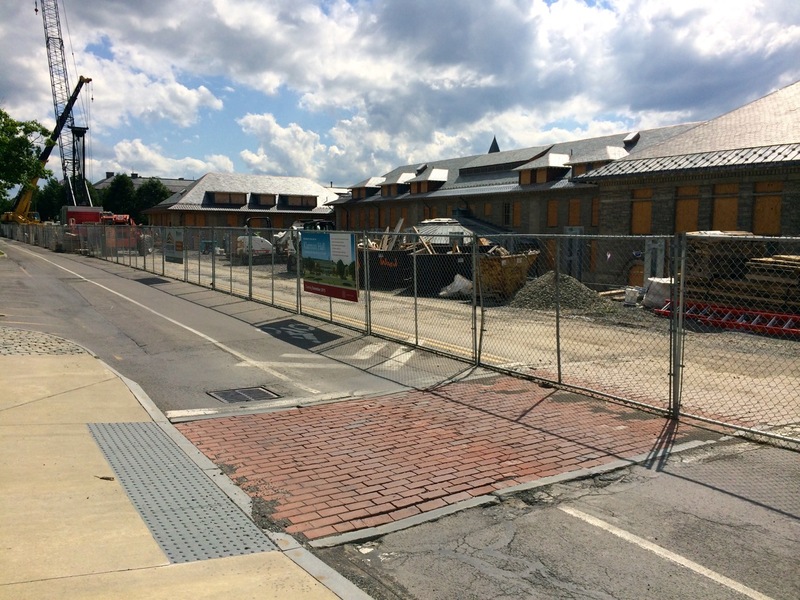 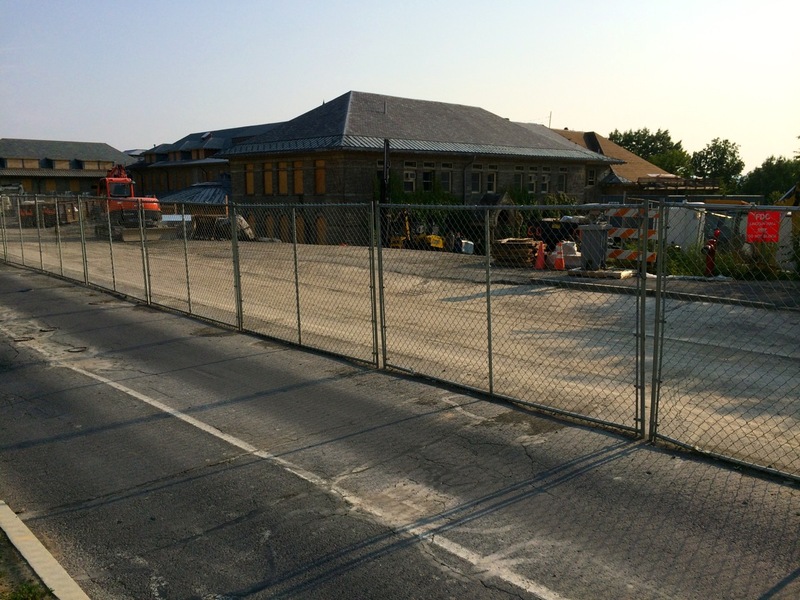 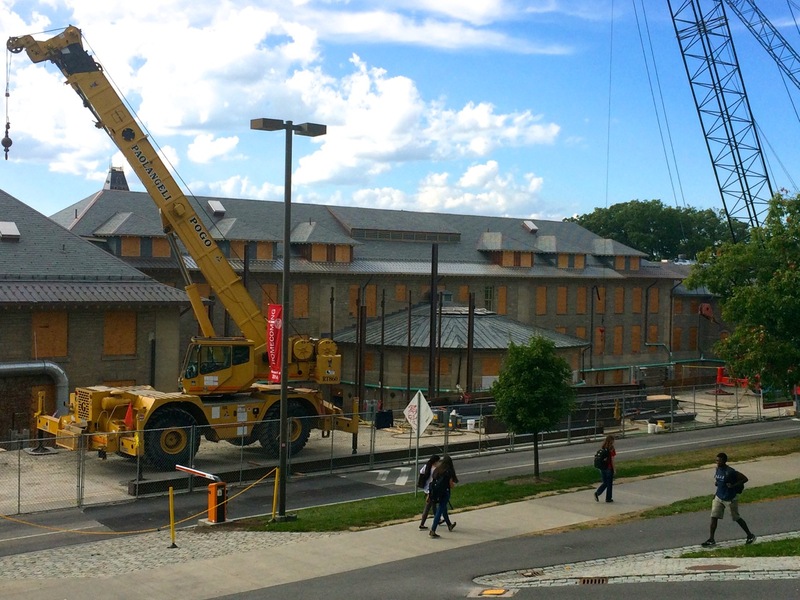 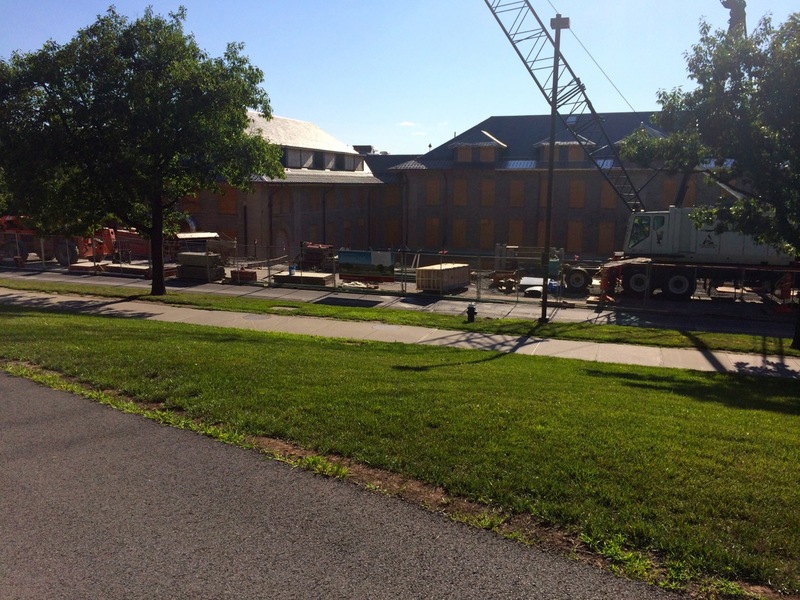 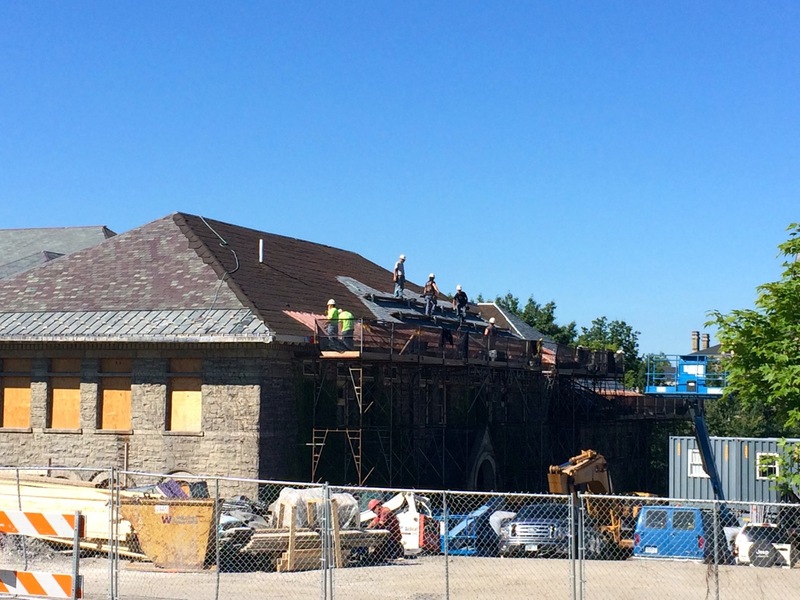 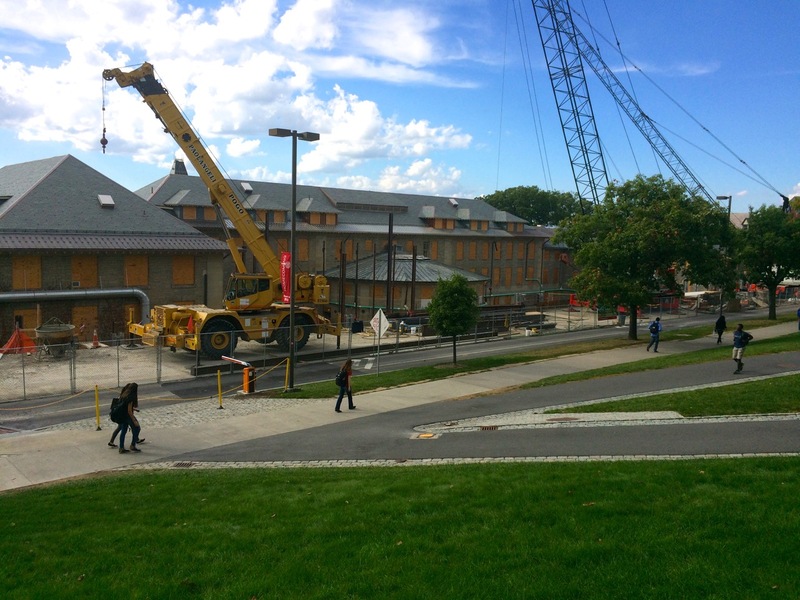 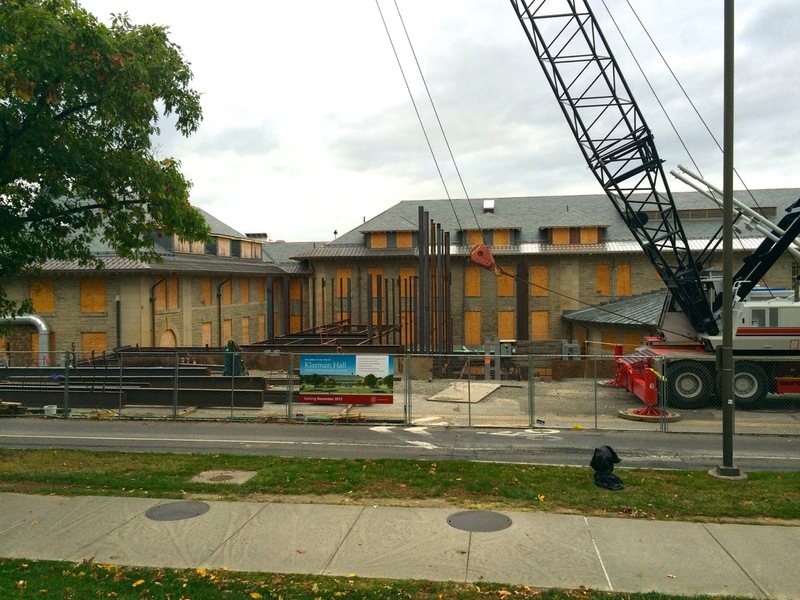 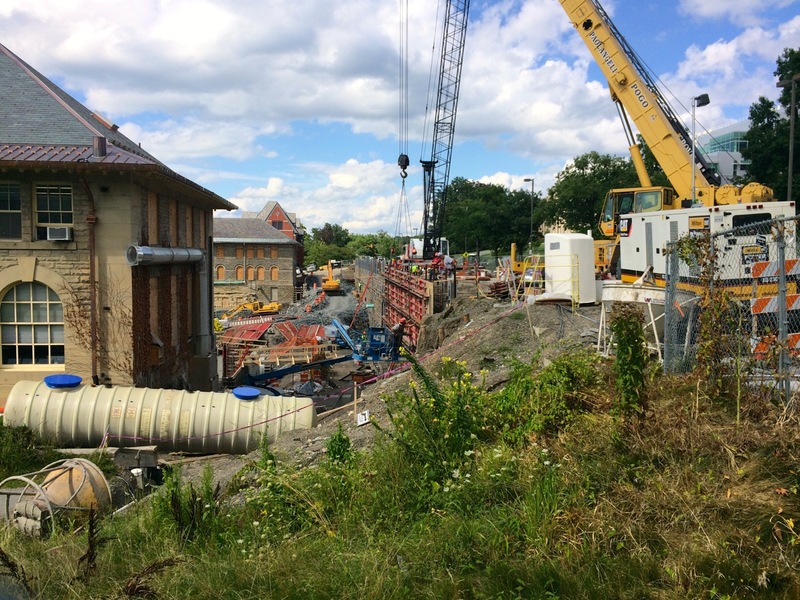 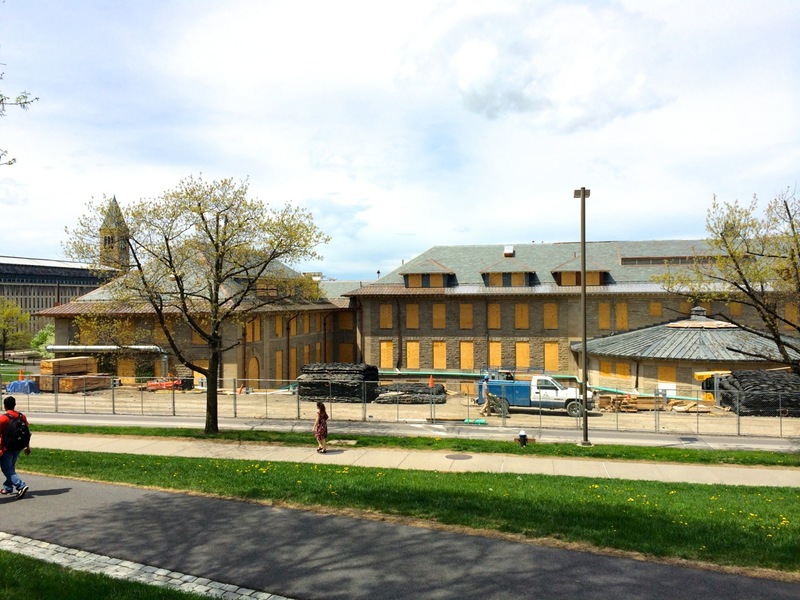 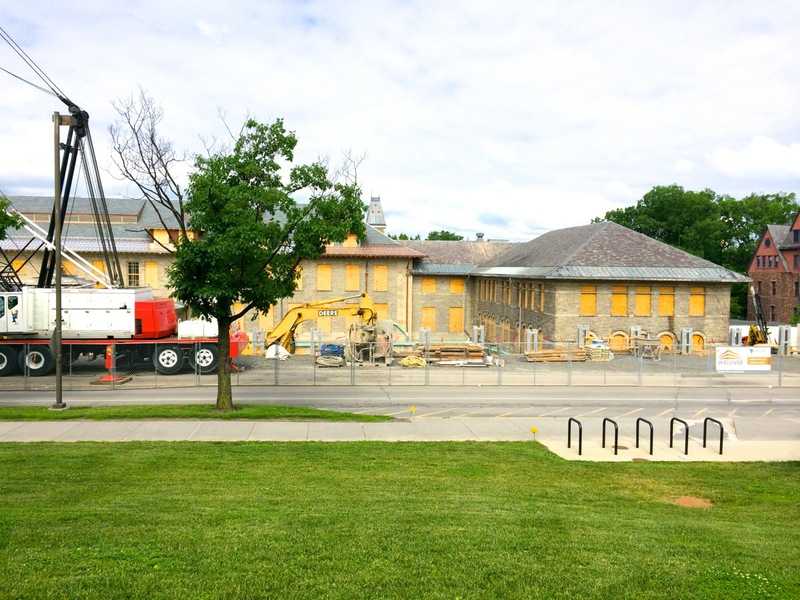 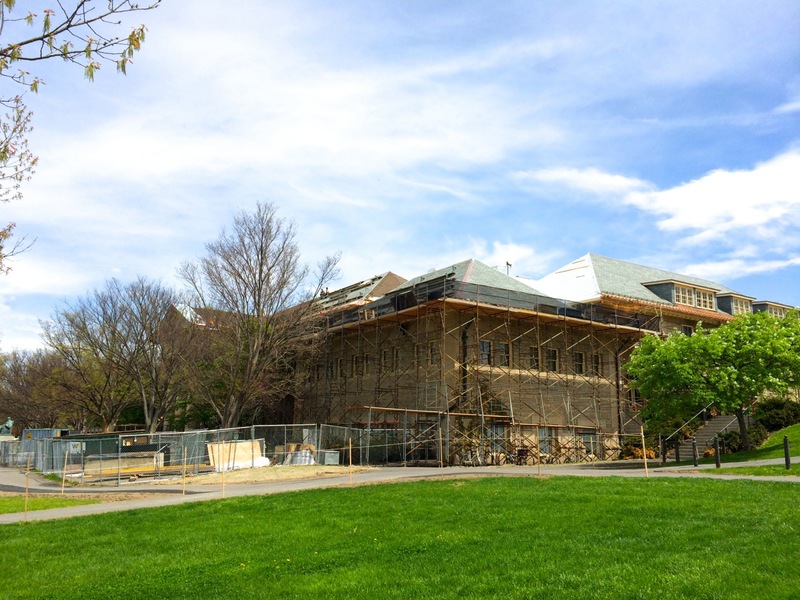 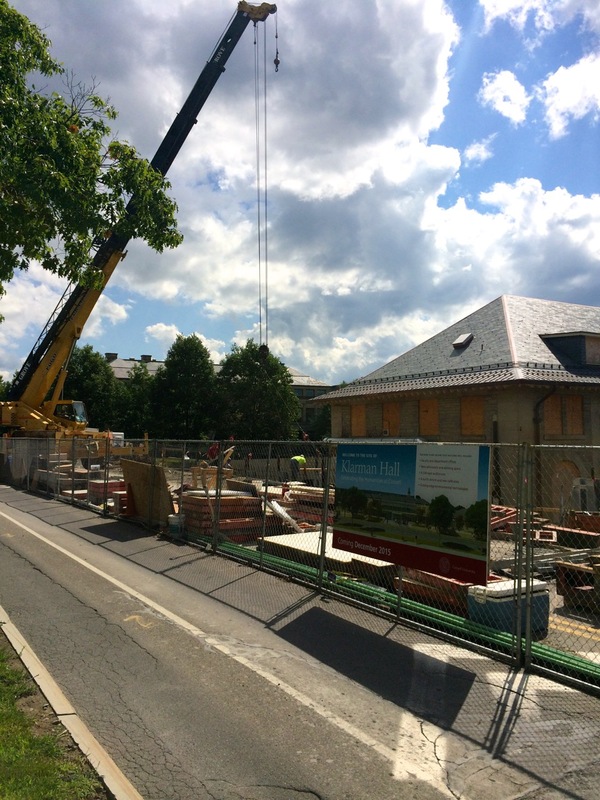 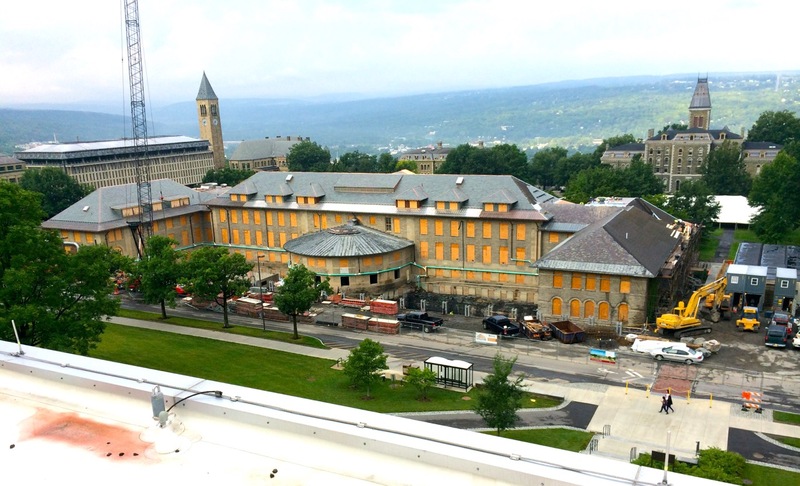 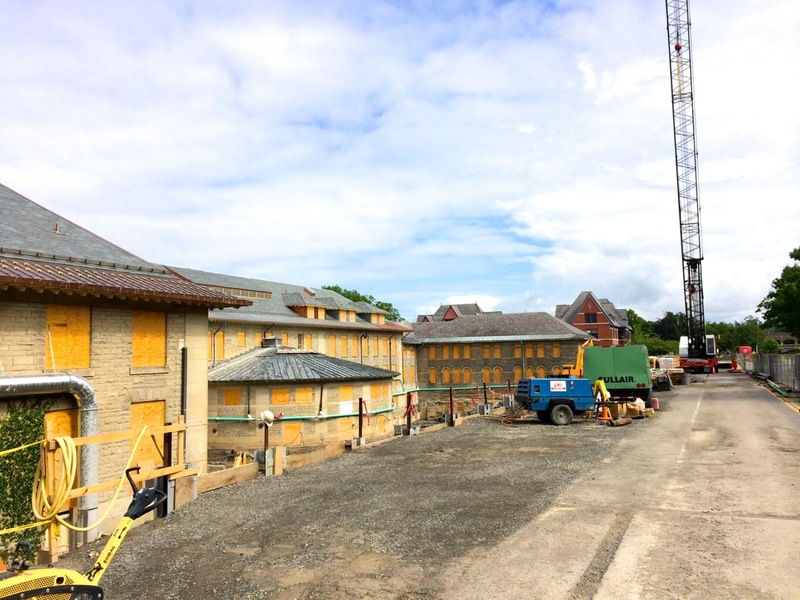 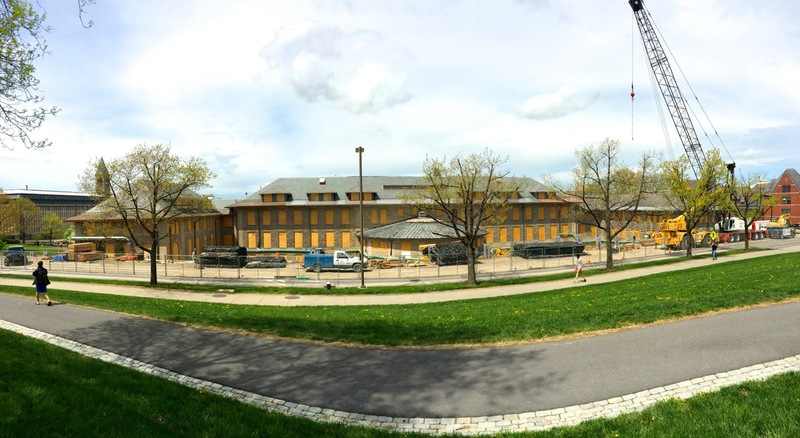 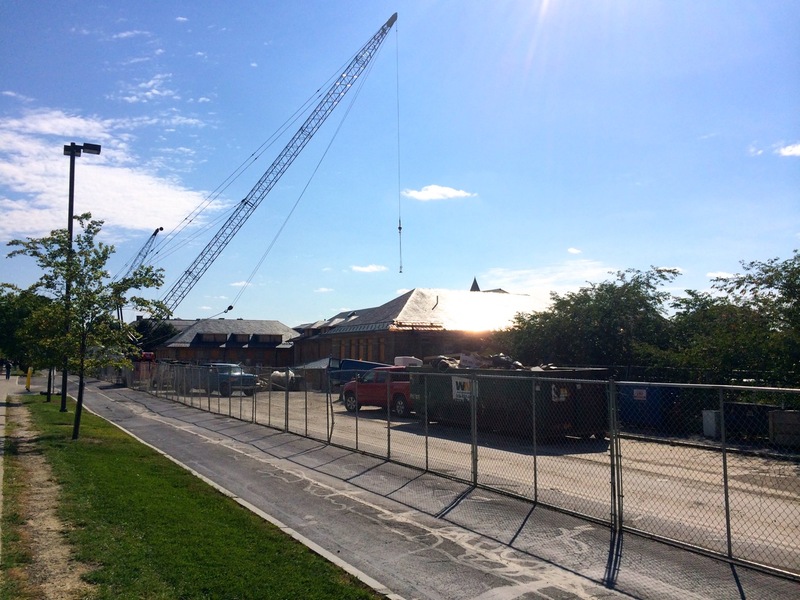 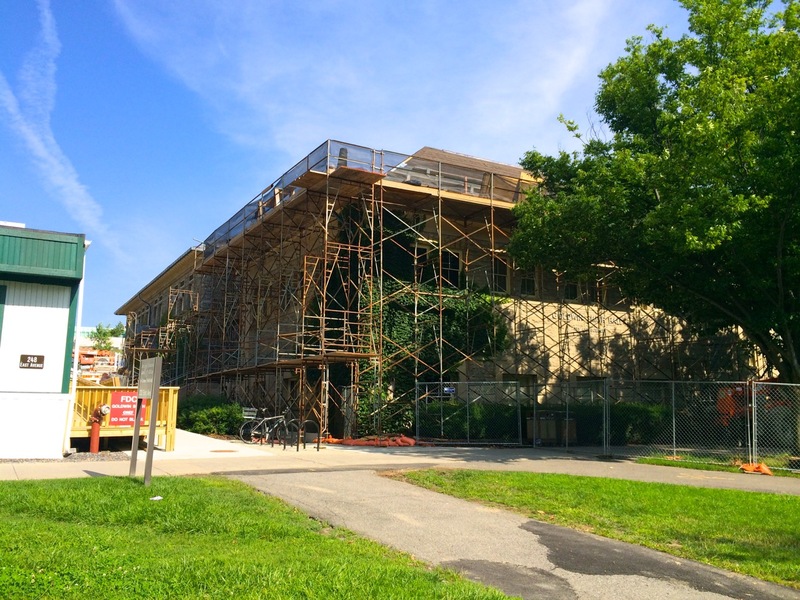 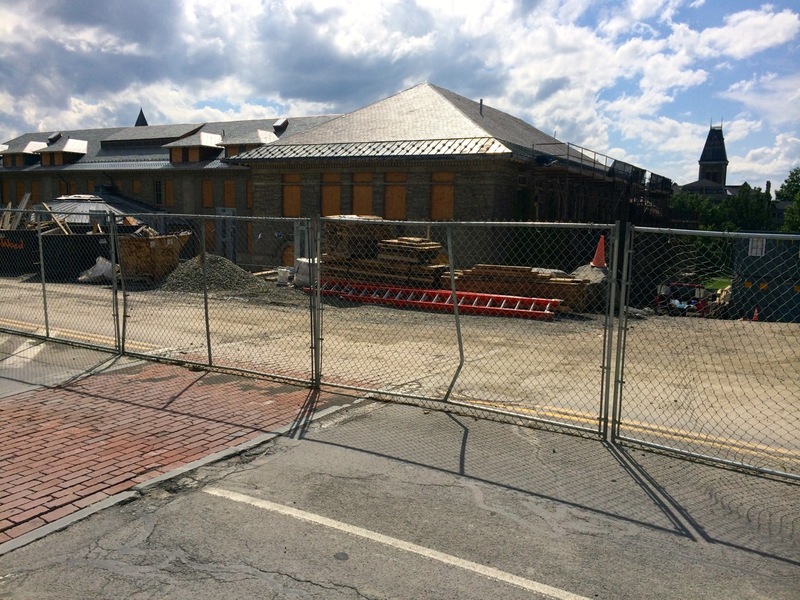 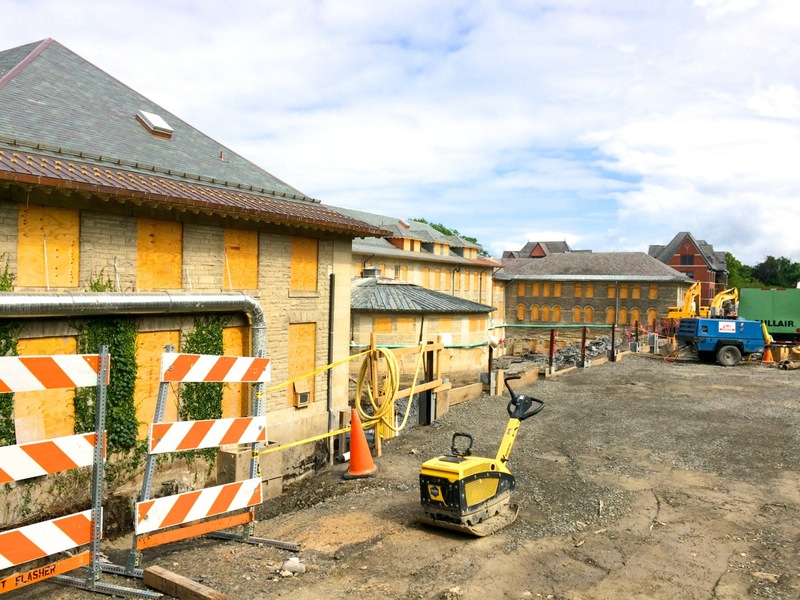 Here’s a photo update (July 29th to August 14th) for Cornell’s 33,250 square-foot Klarman Hall project, a new Humanities building to be situated between the wings of Goldwin Smith Hall along East Avenue. 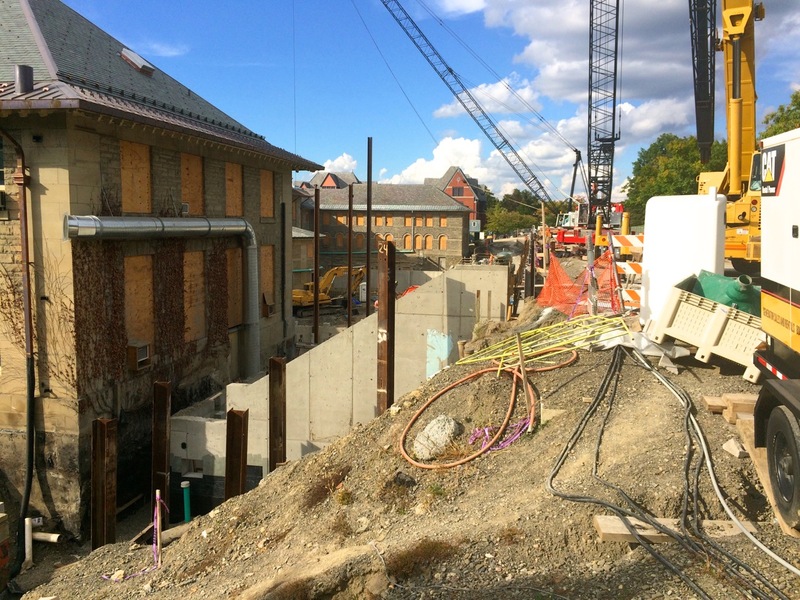 Over the past few weeks, rebar and concrete forms for the south end and north end footings have been assembled and the south end footings and western foundation walls look partially completed. 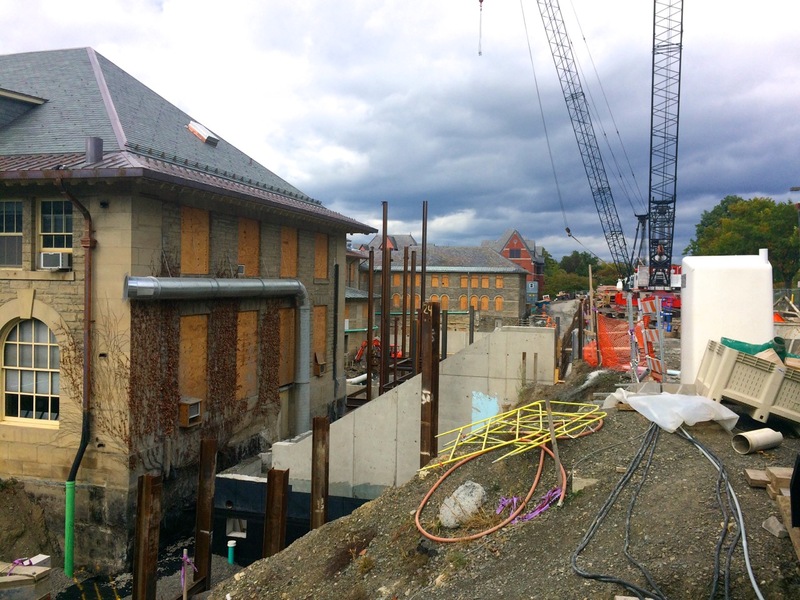 The shoring wall along East Ave is being prepped for pouring concrete as well, as large steel concrete forms are craned into position to sandwich the rebar assemblies between the form and shoring wall. 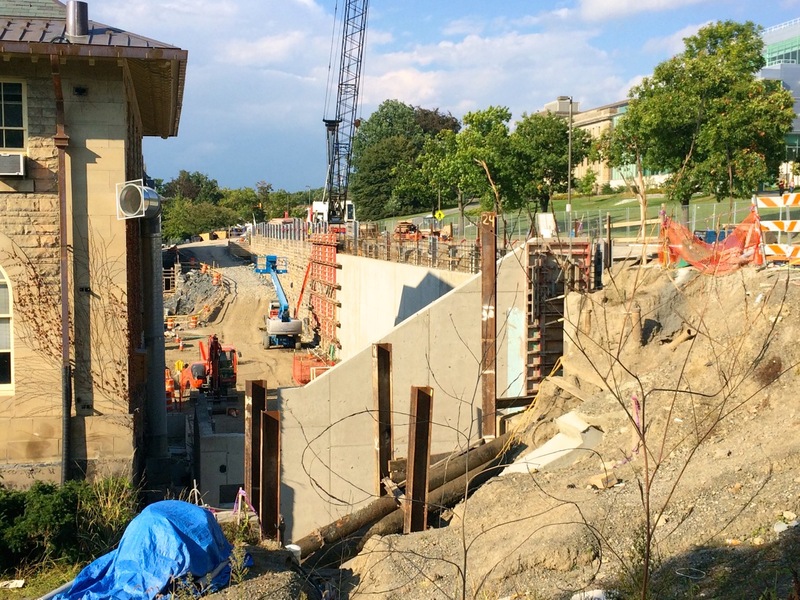 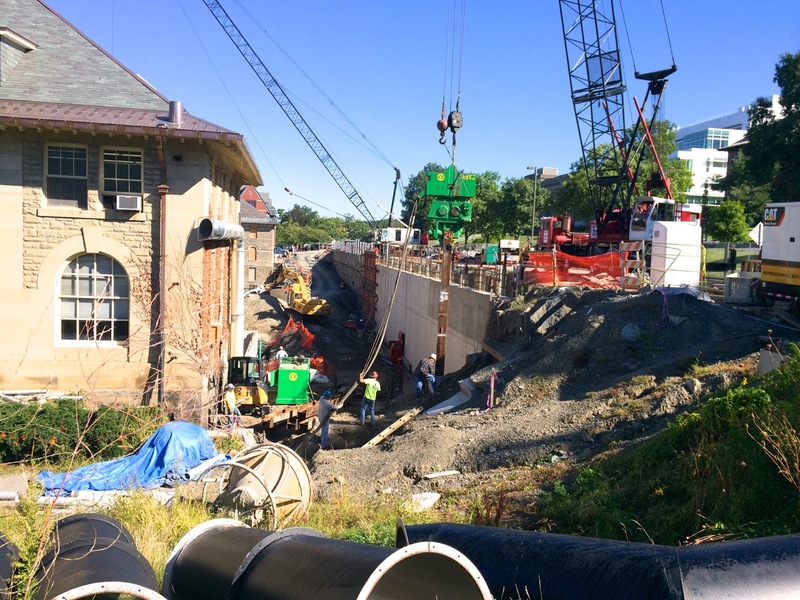 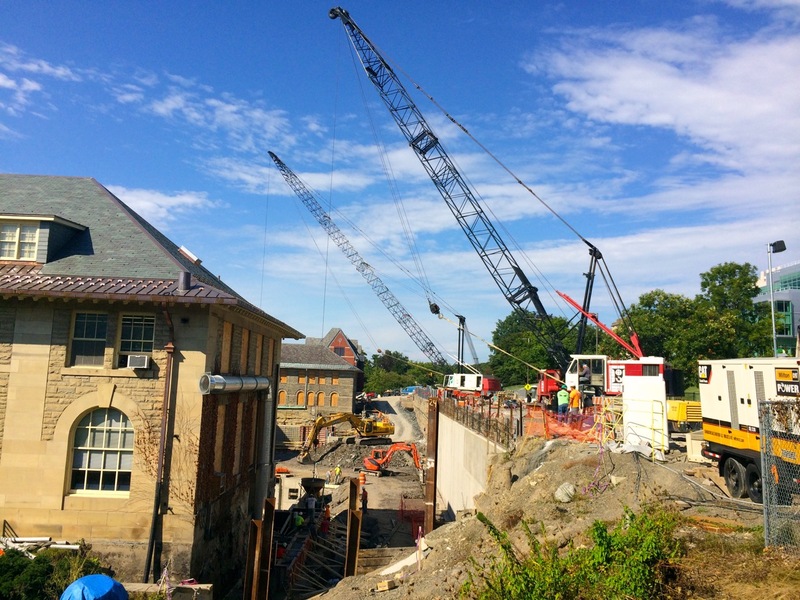 Steel erection over top of the south end’s foundation walls begins later this month, and by mid-September, the north end foundation walls will be completed and ready for structure assembly. 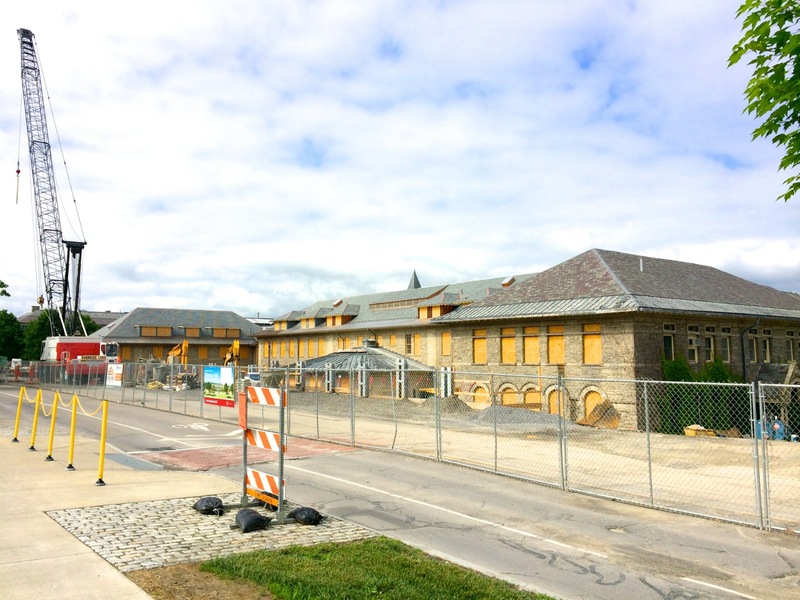 The building is designed by Koetter | Kim & Associates, with construction by Welliver. 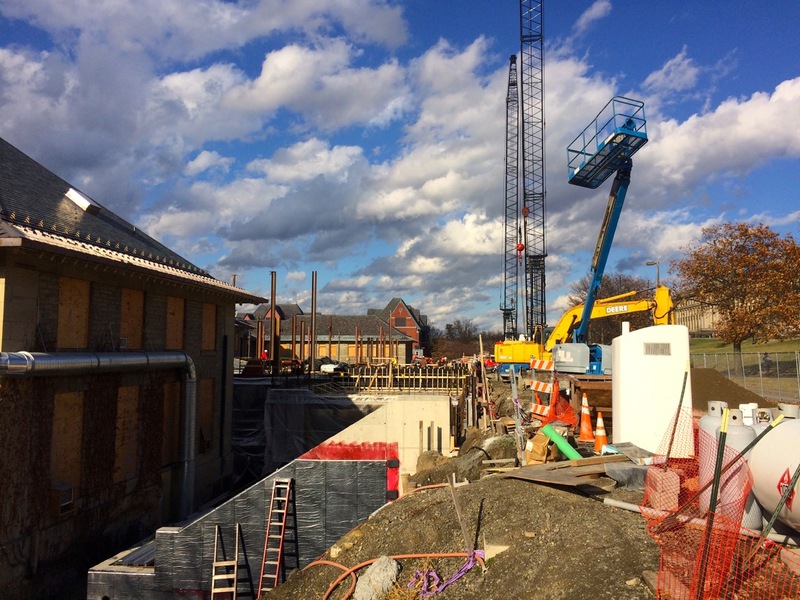 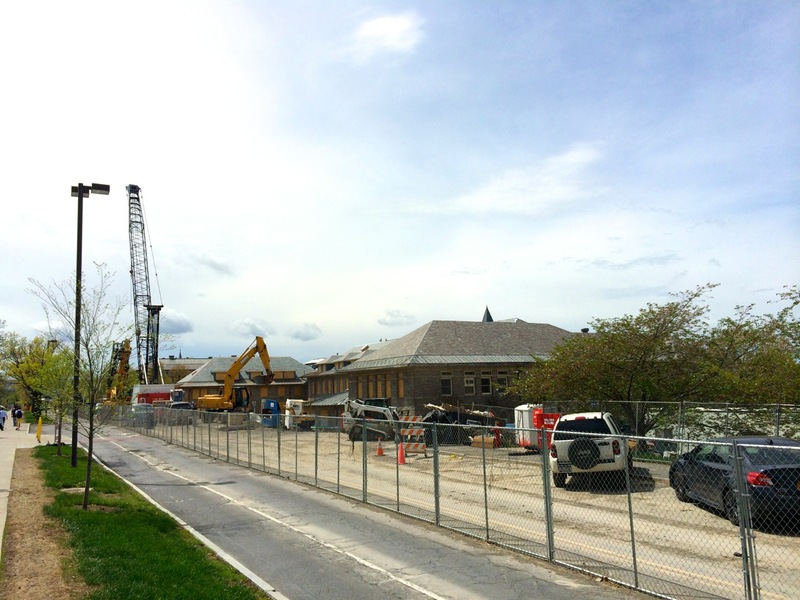 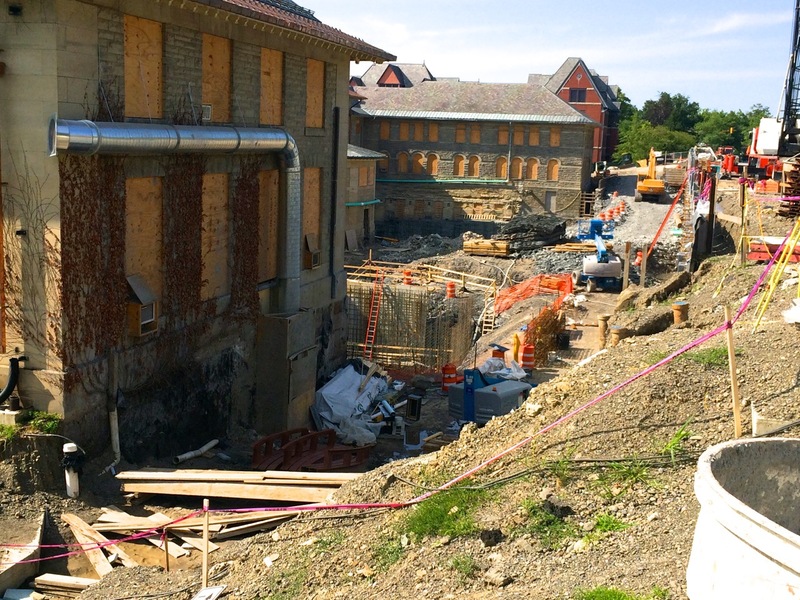 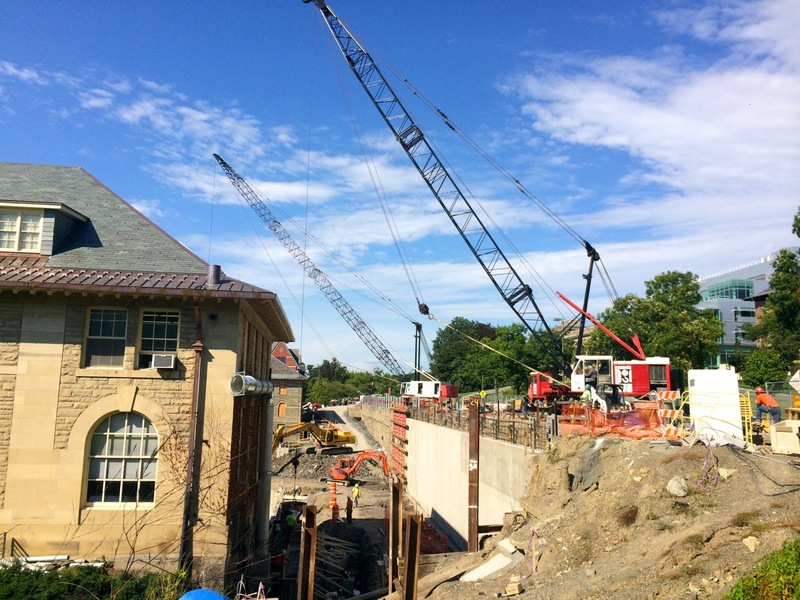 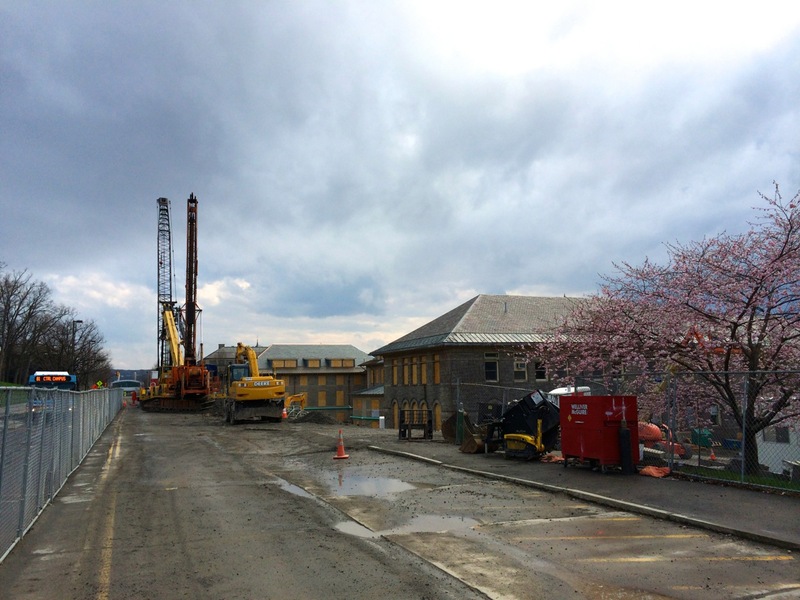 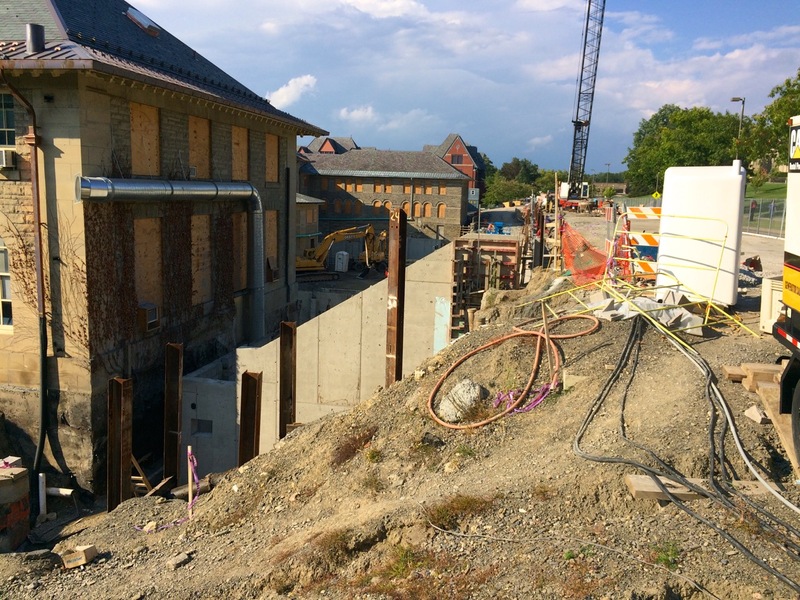 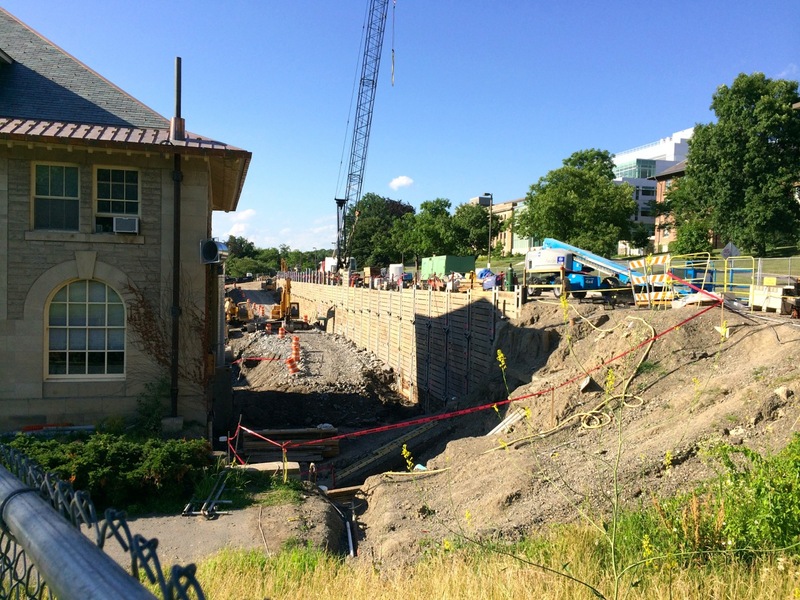 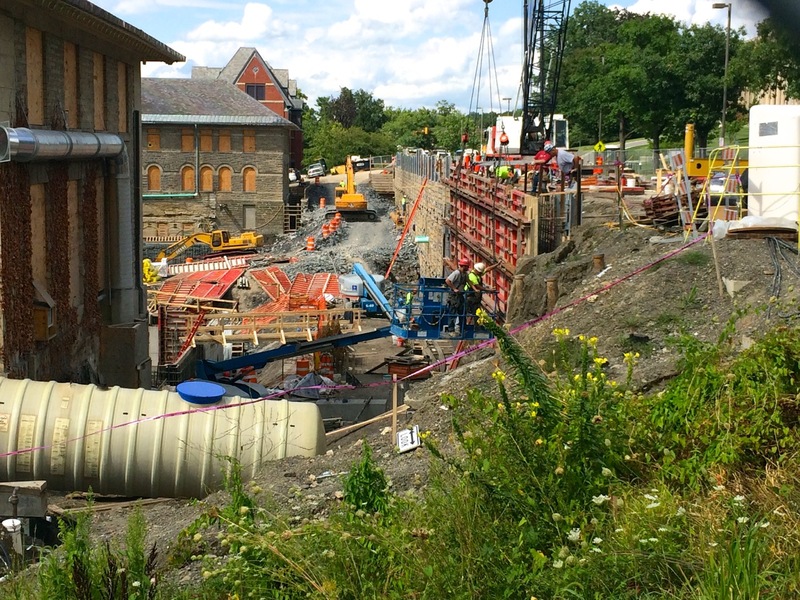 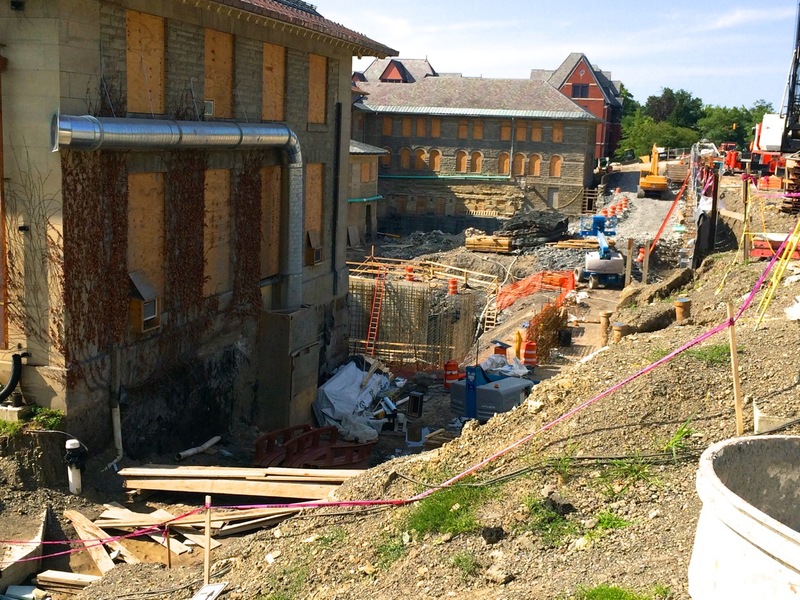 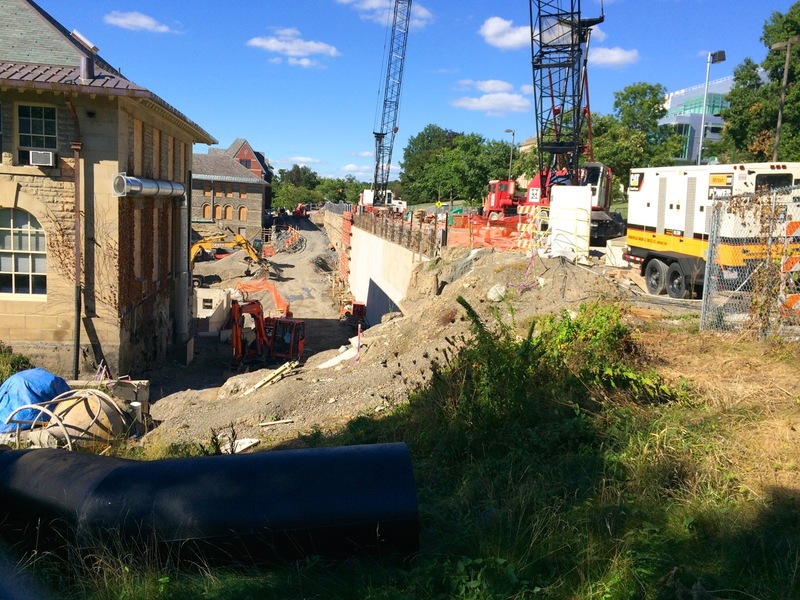 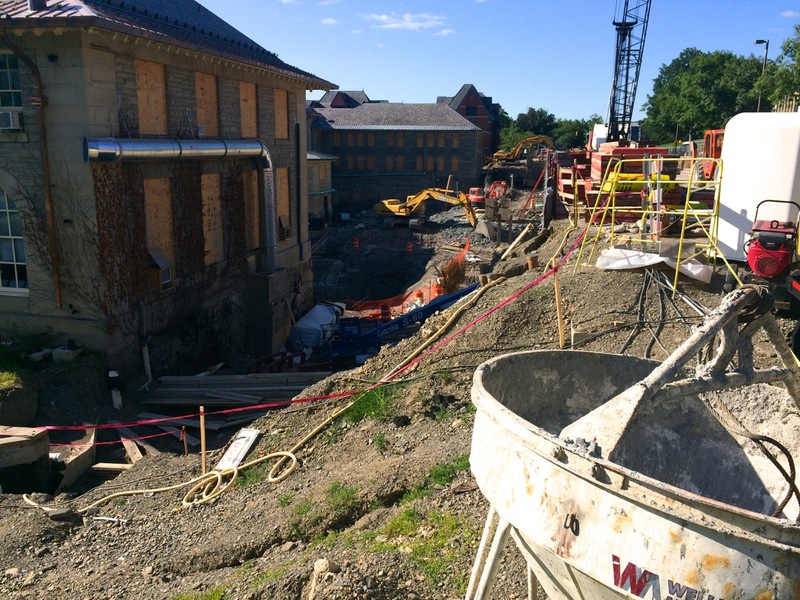 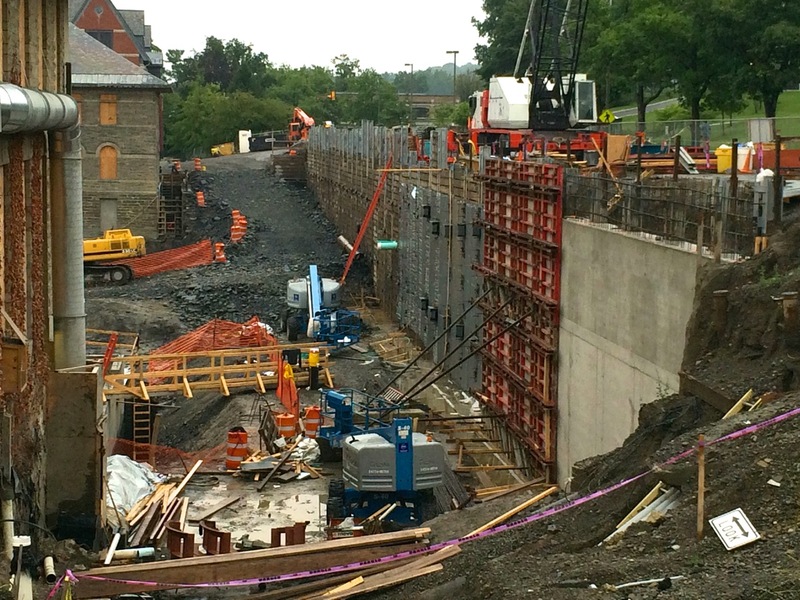 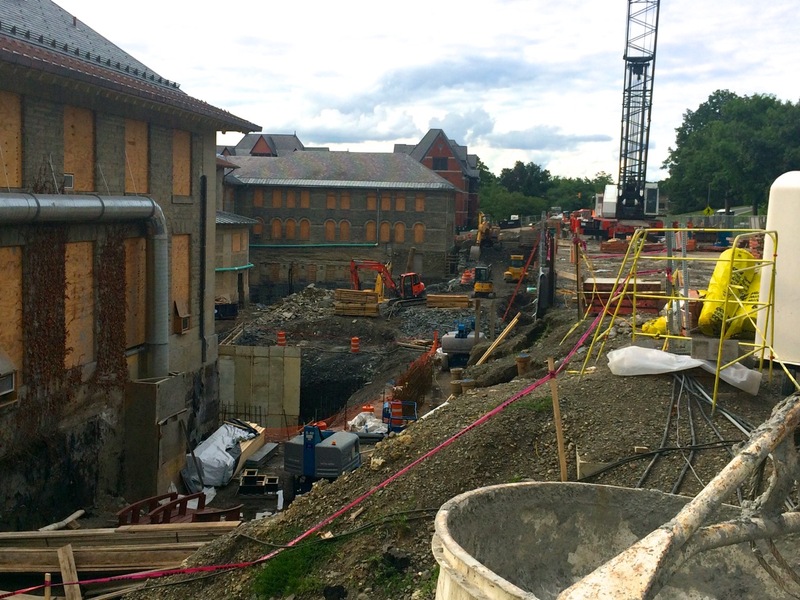 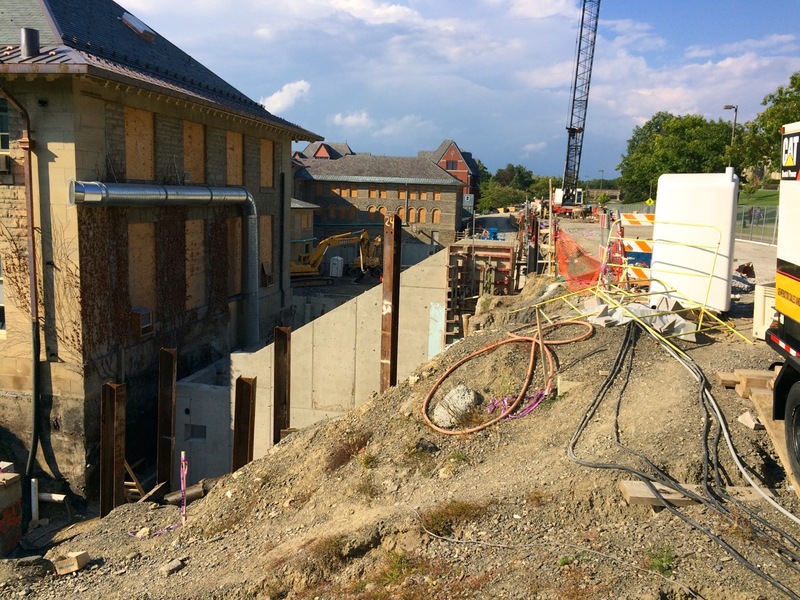 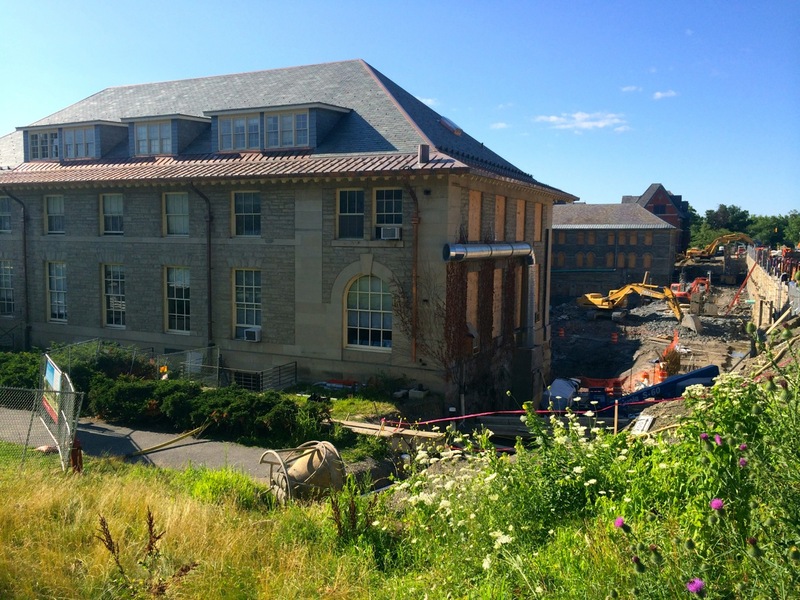 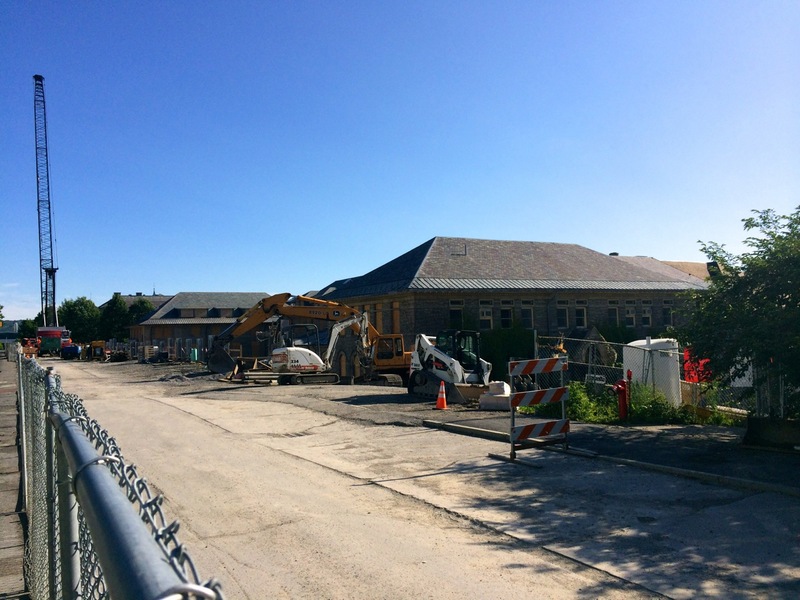 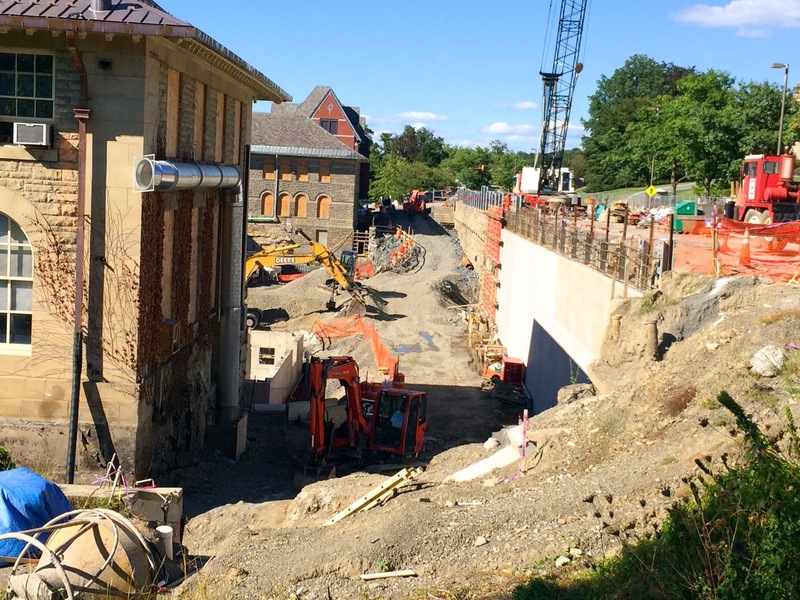 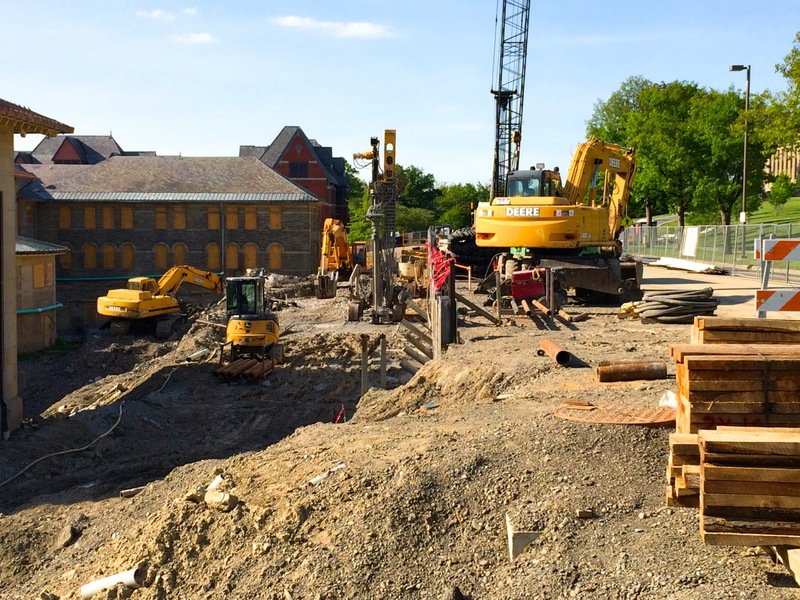 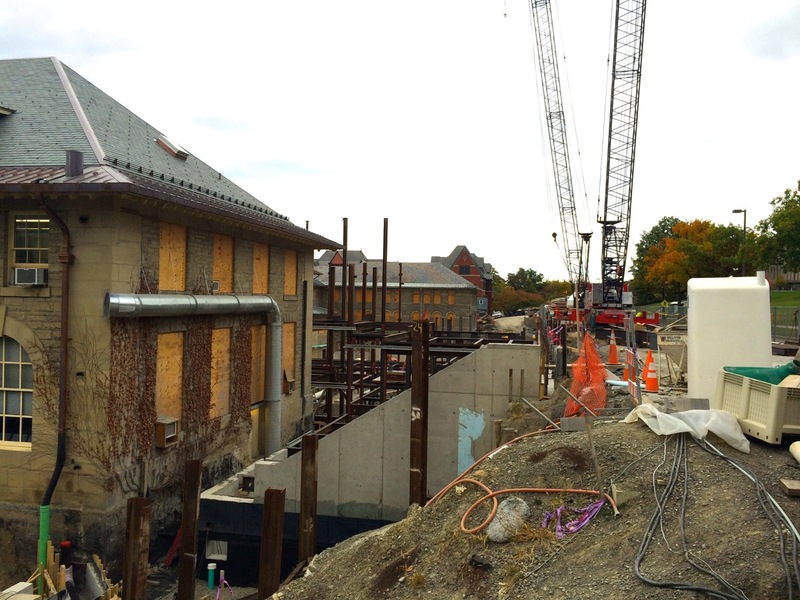 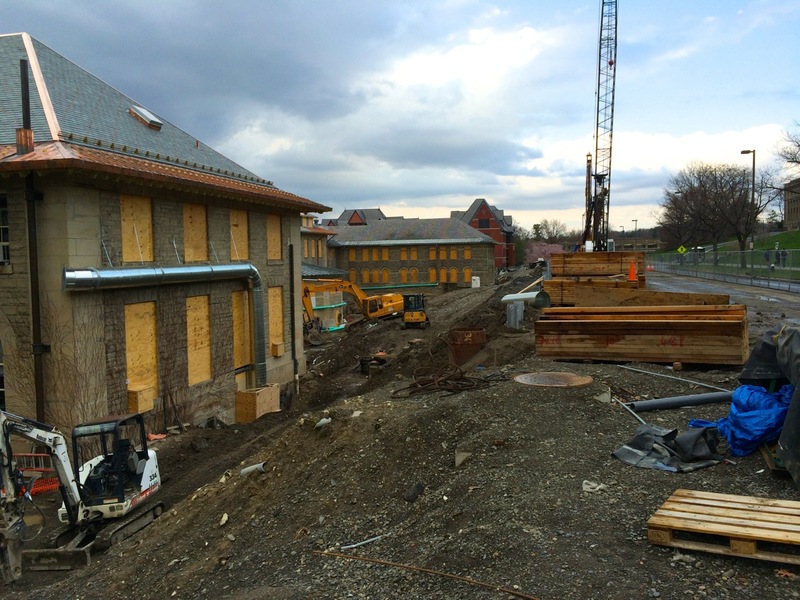 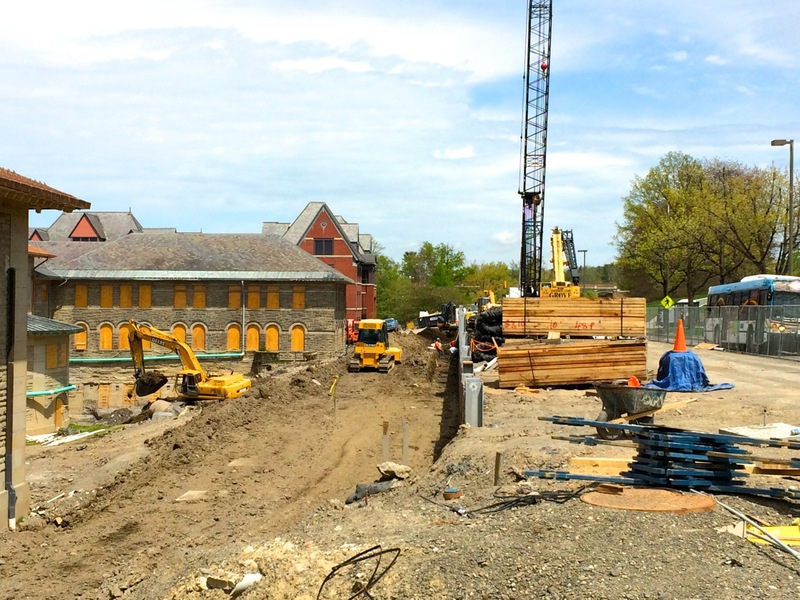 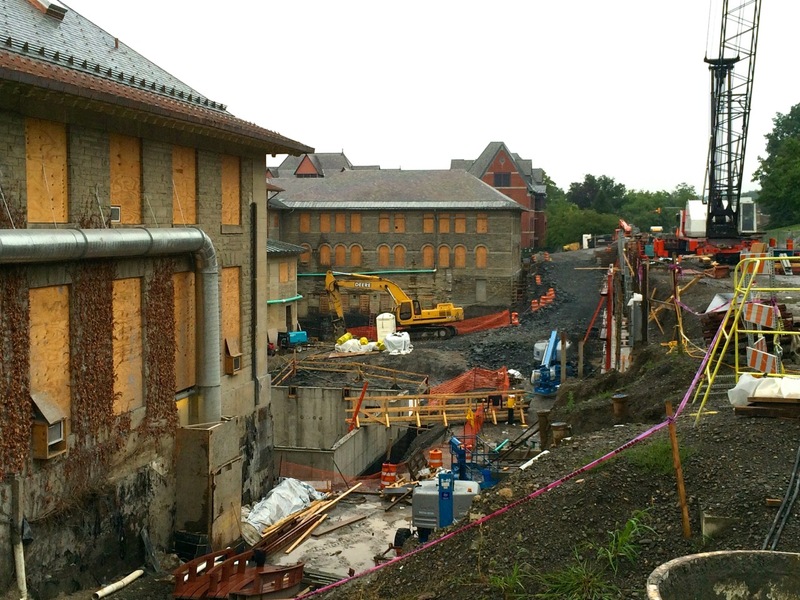 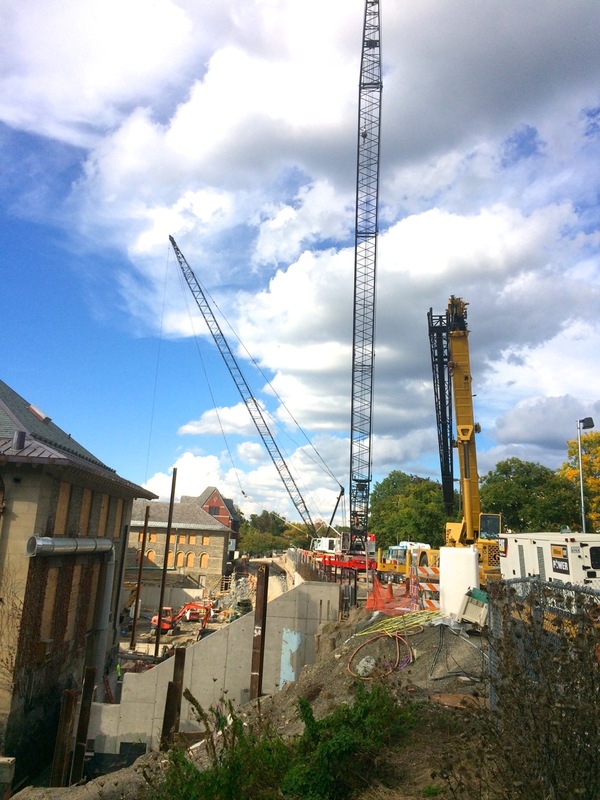 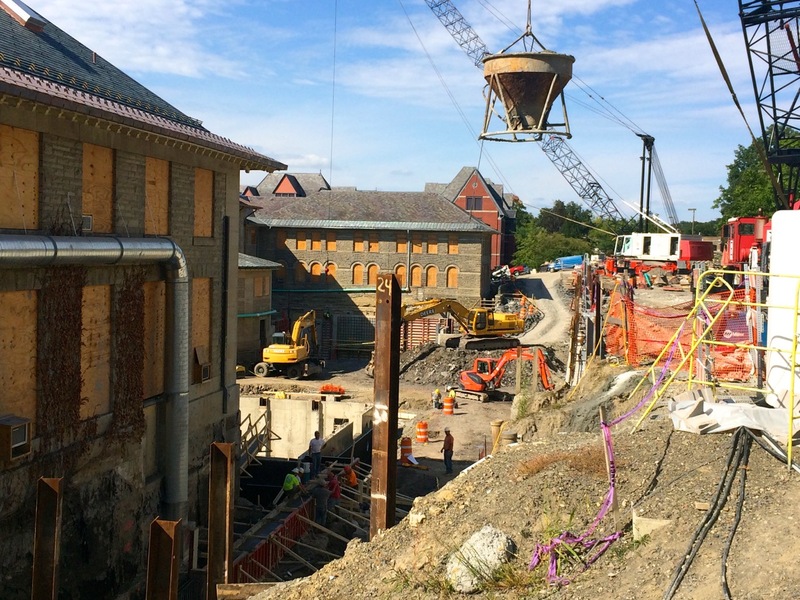 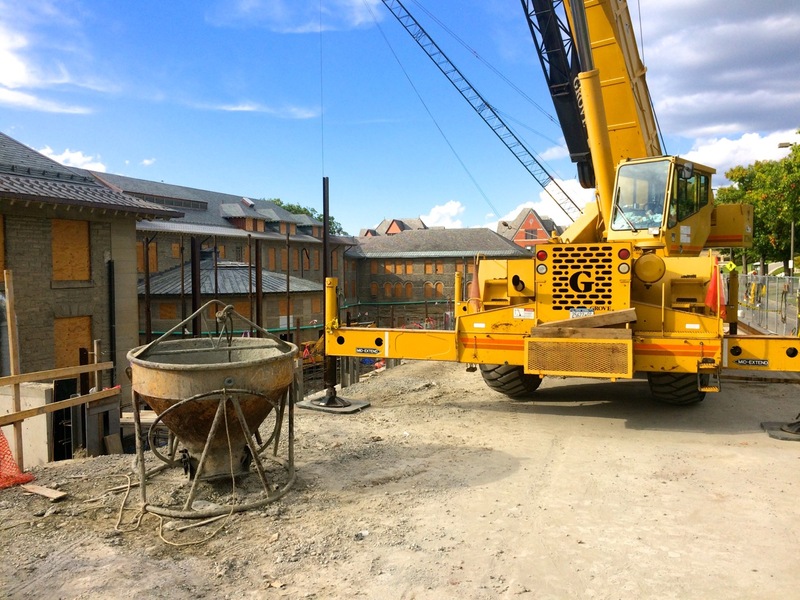 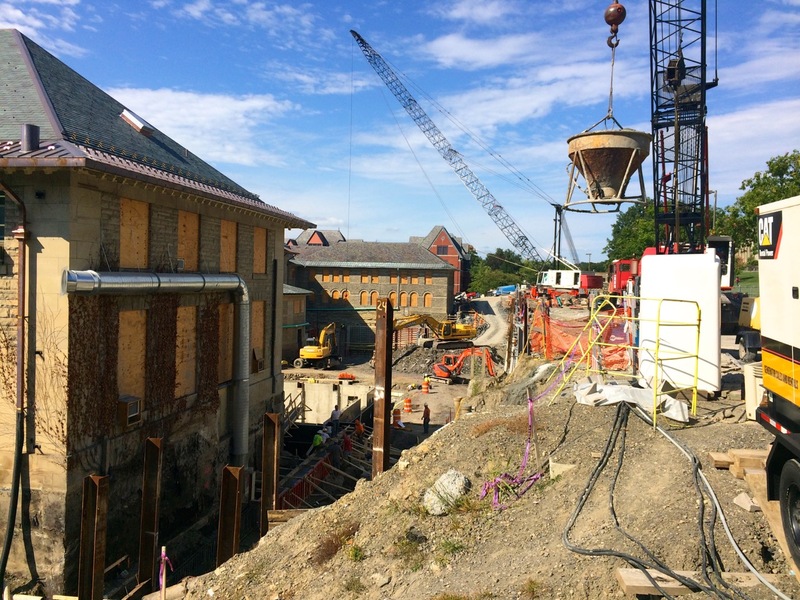 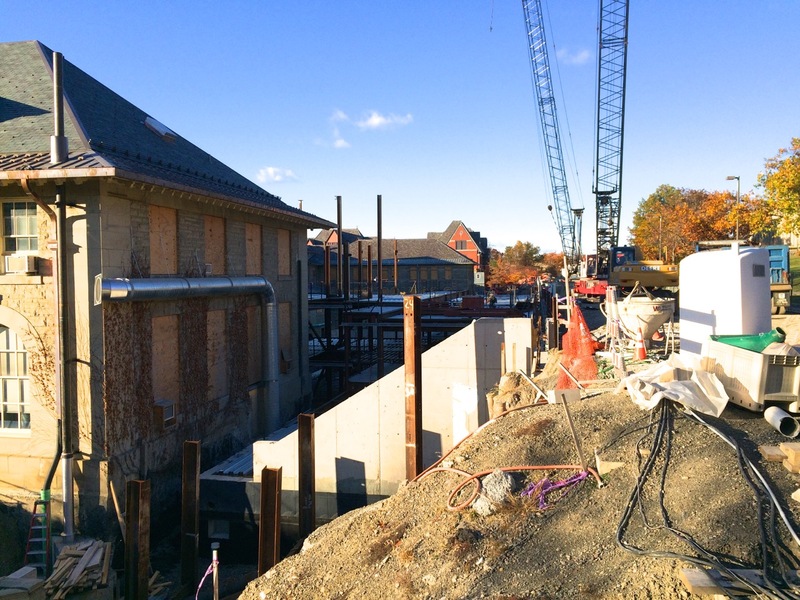 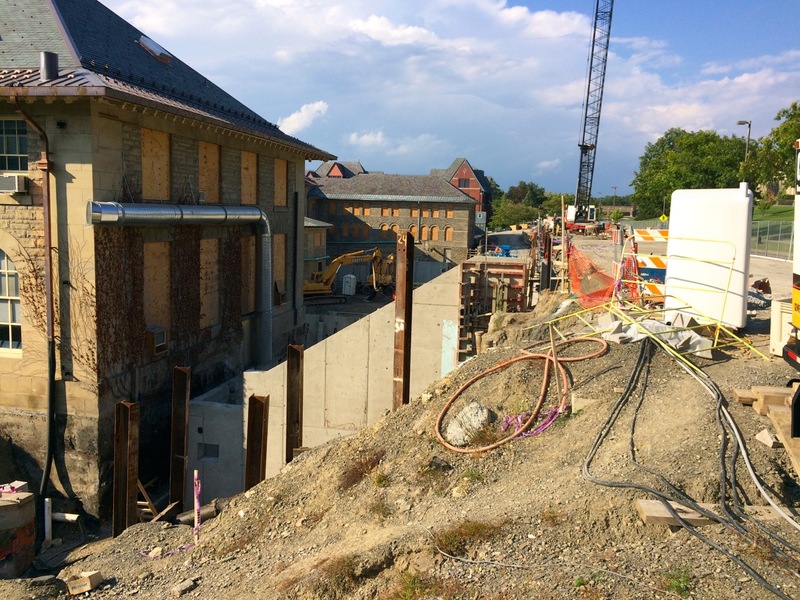 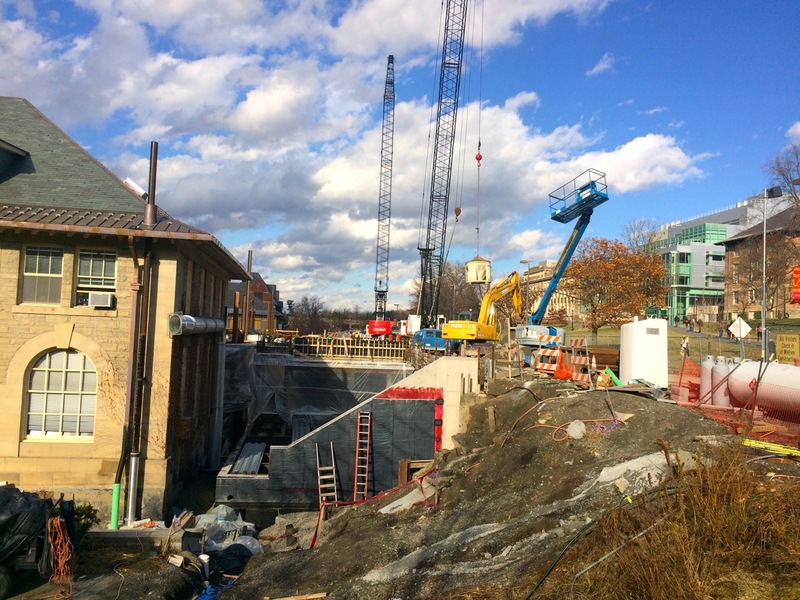 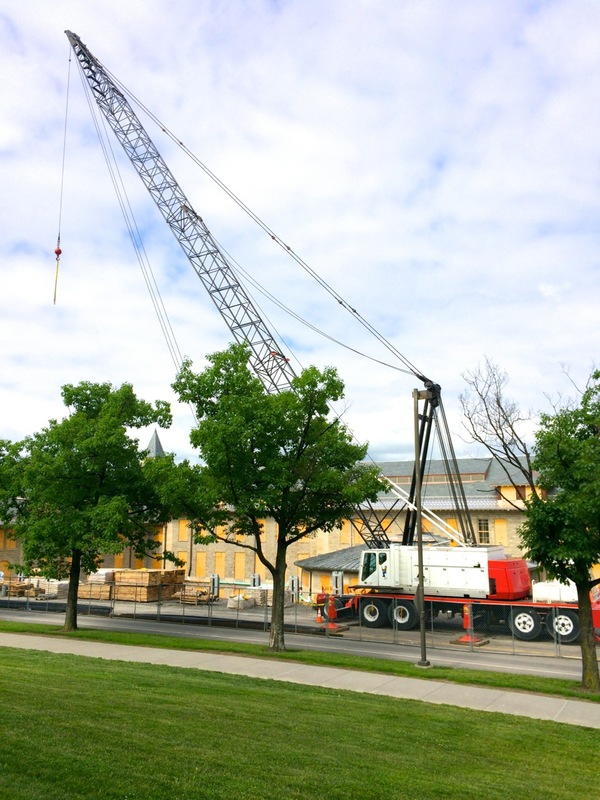 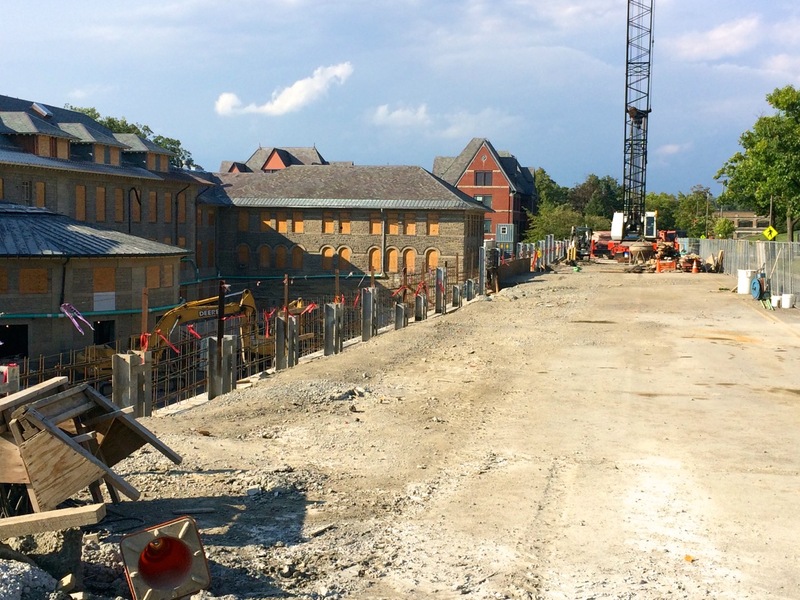 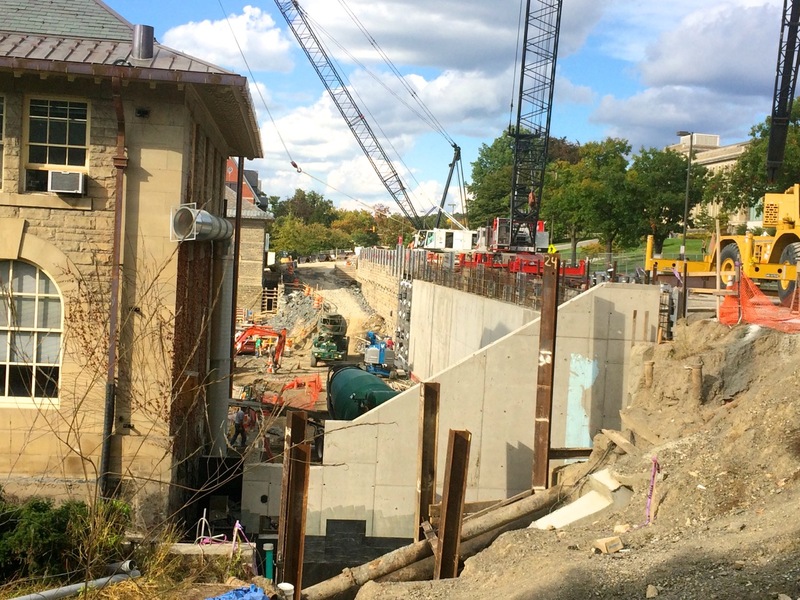 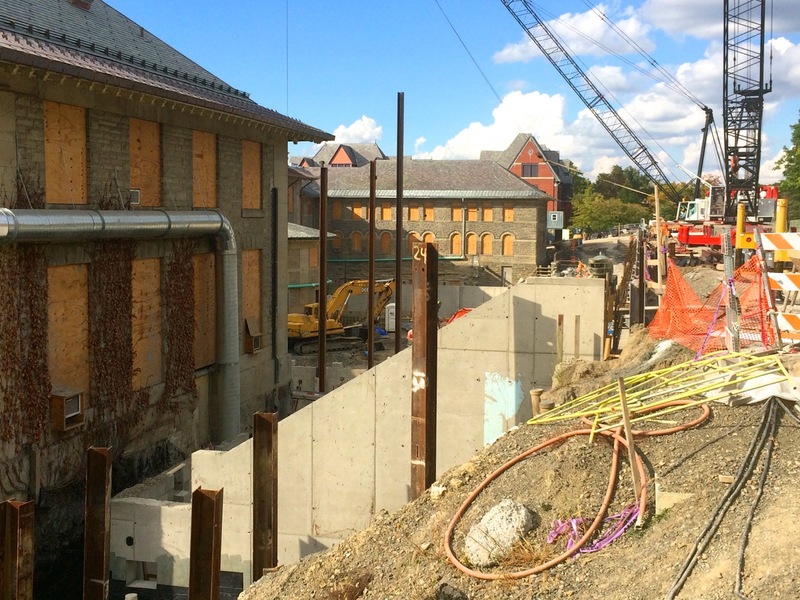 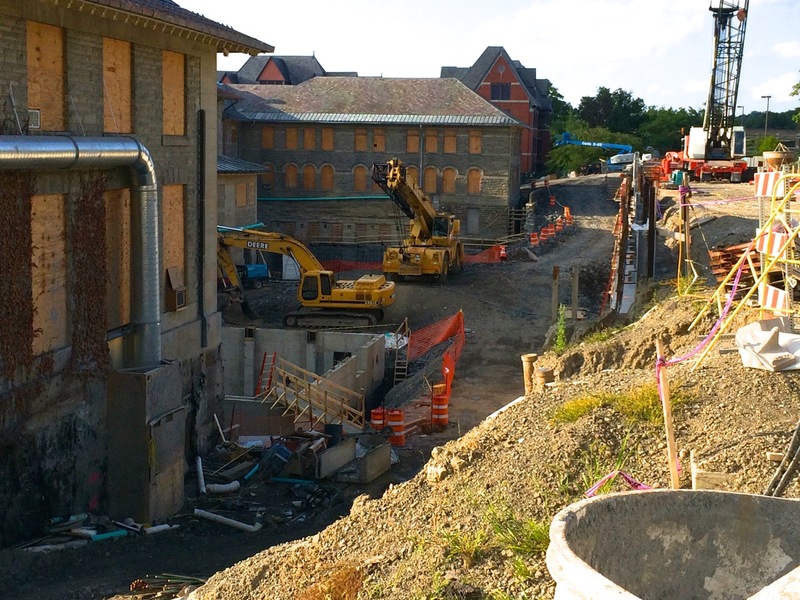 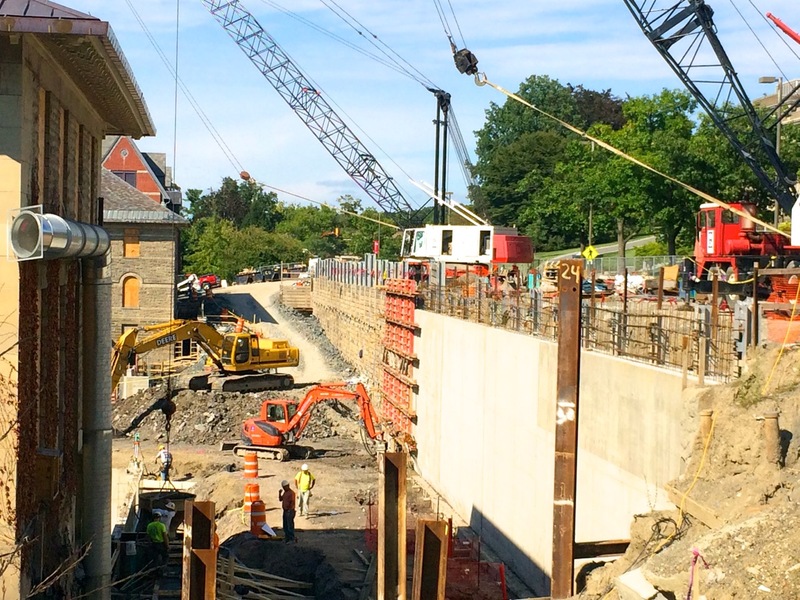 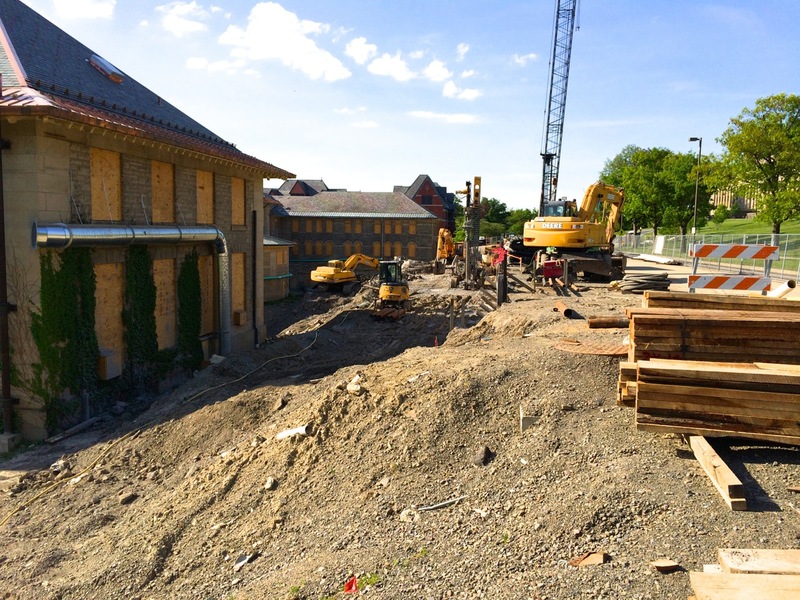 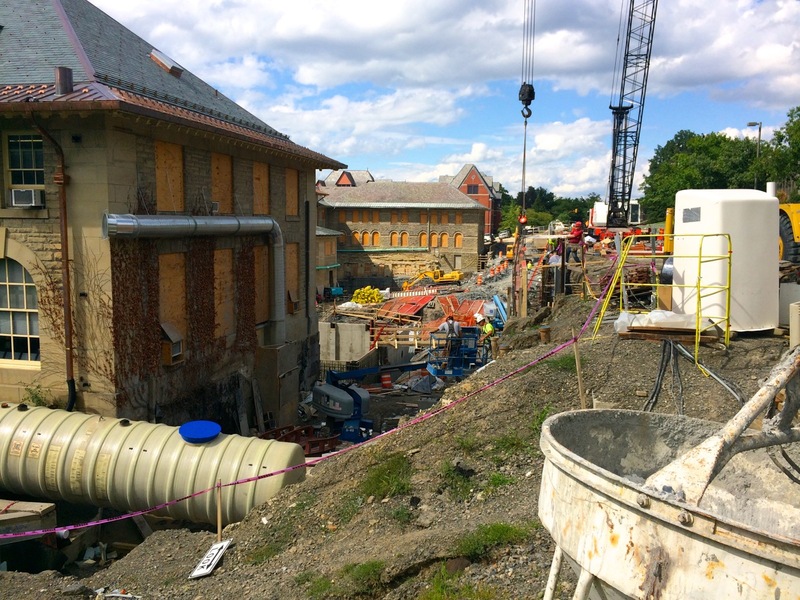 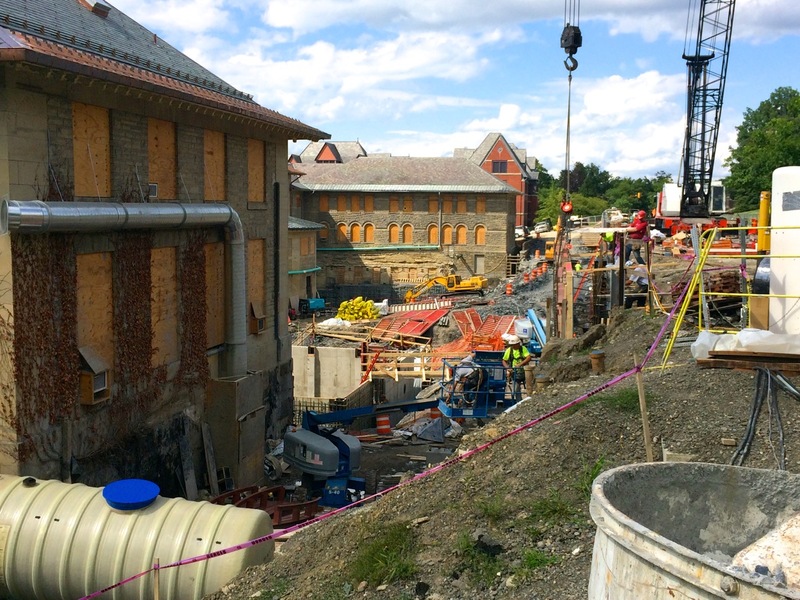 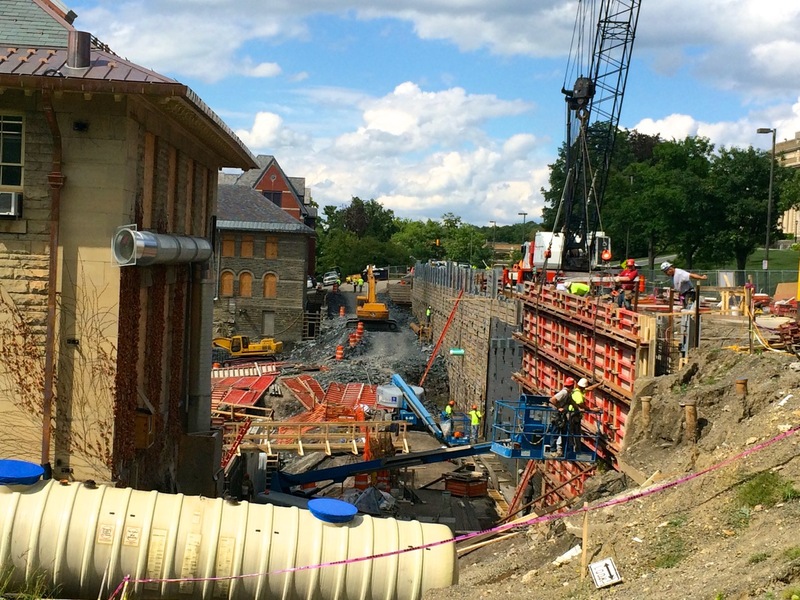 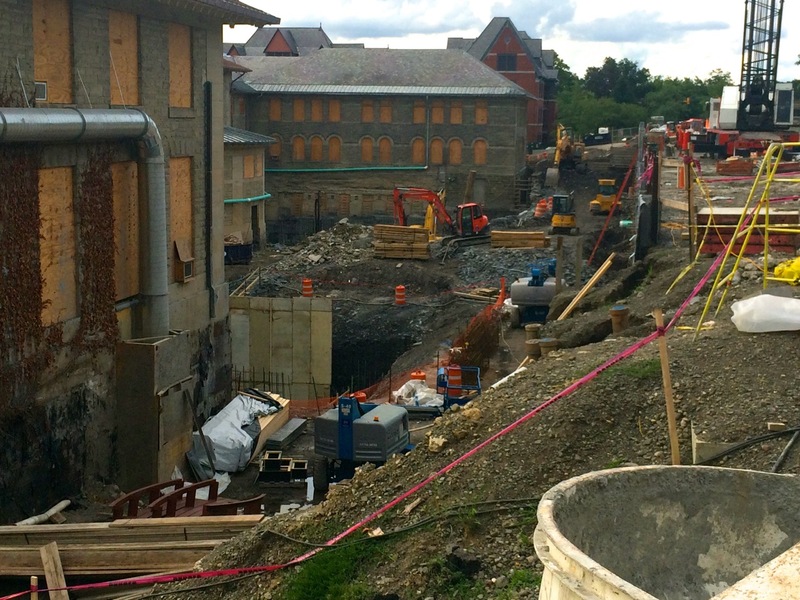 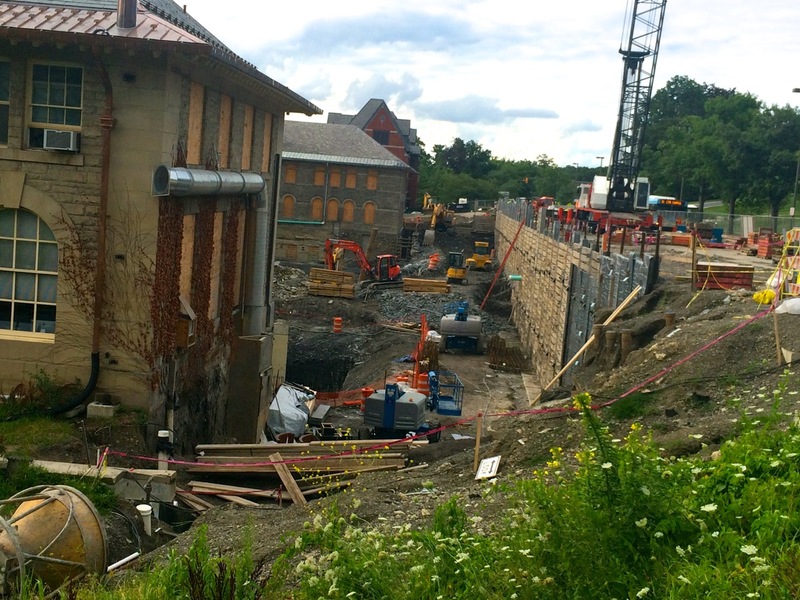 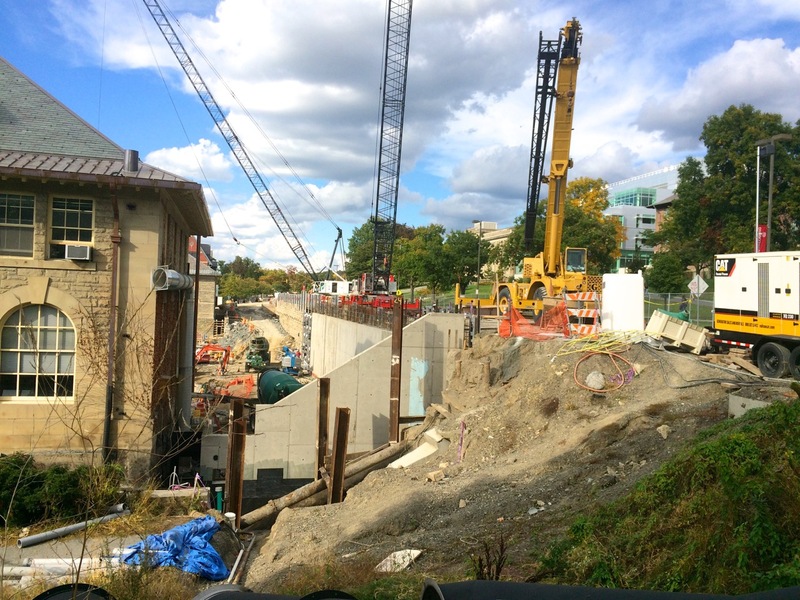 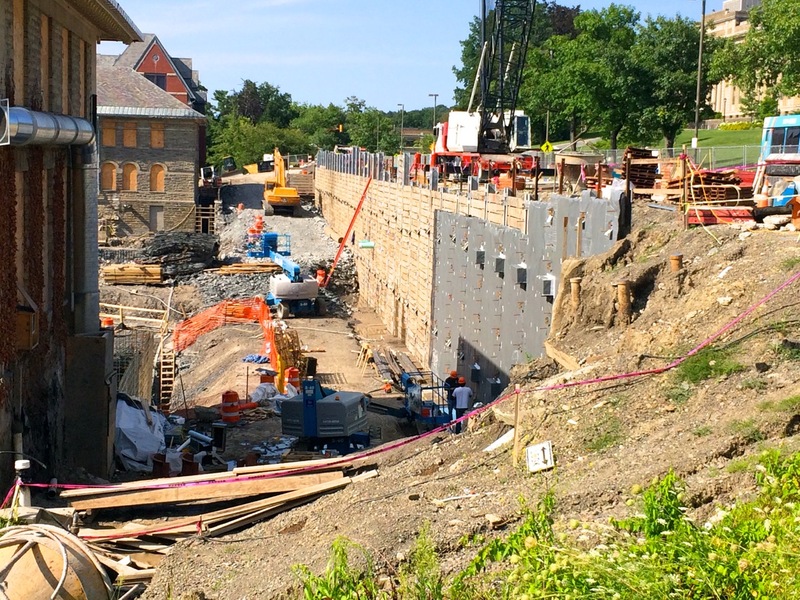 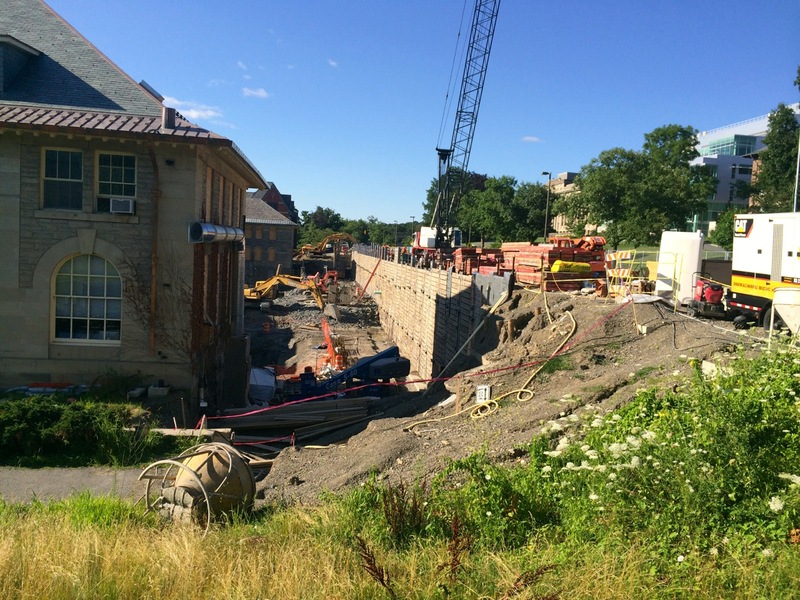 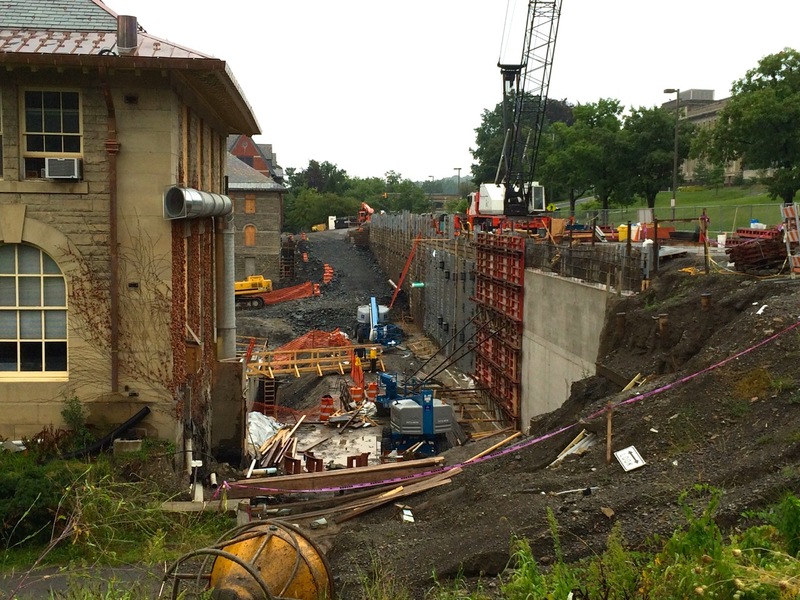 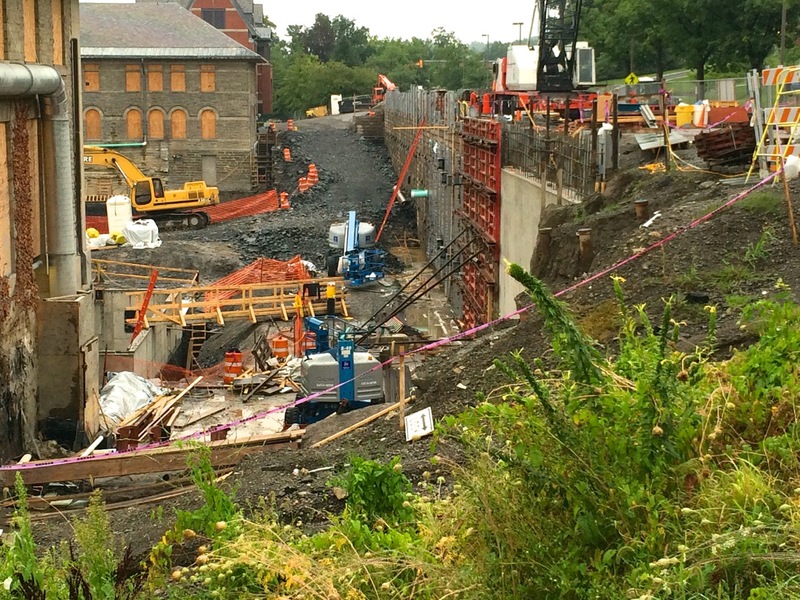 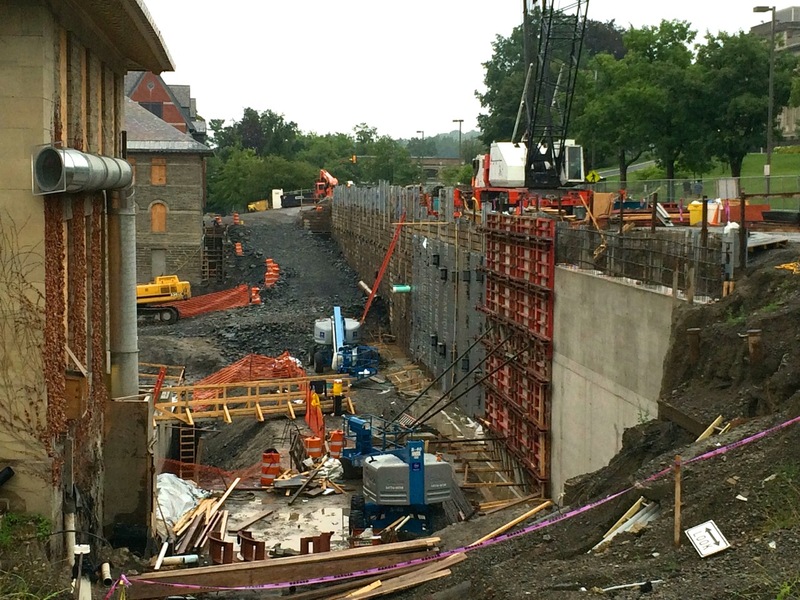 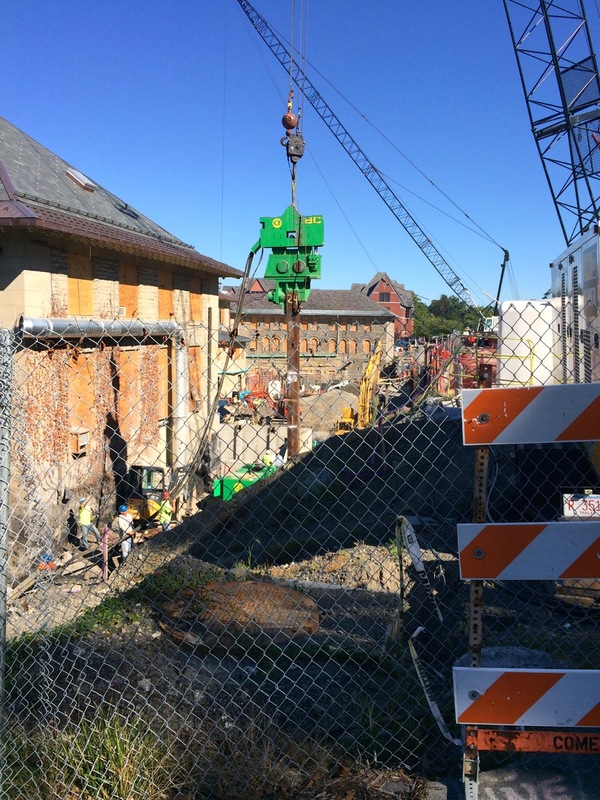 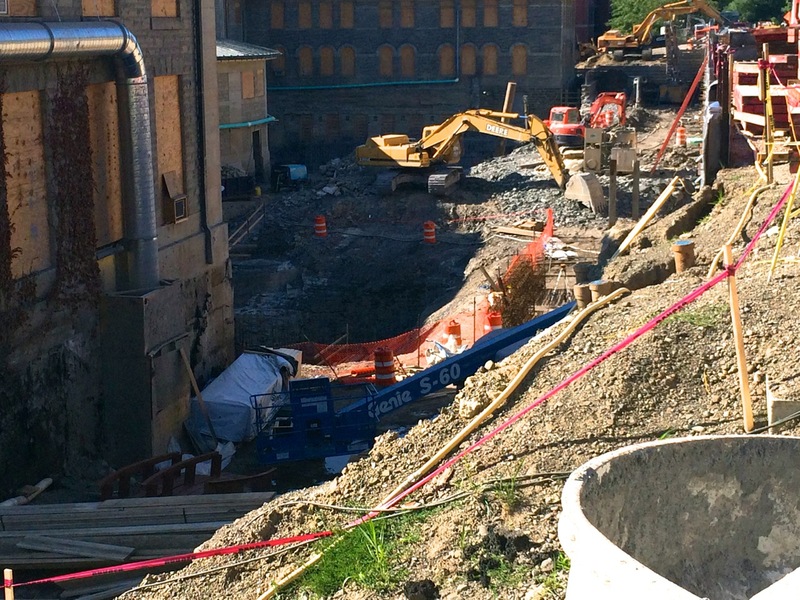 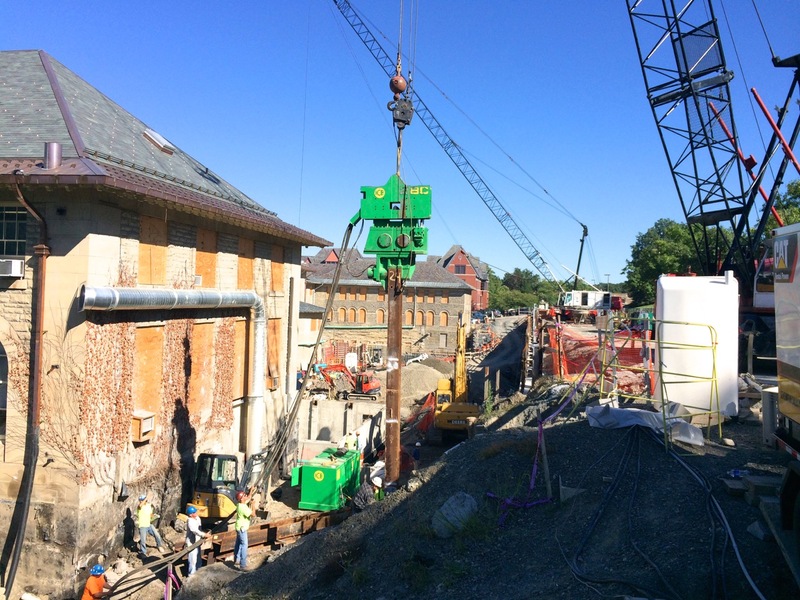 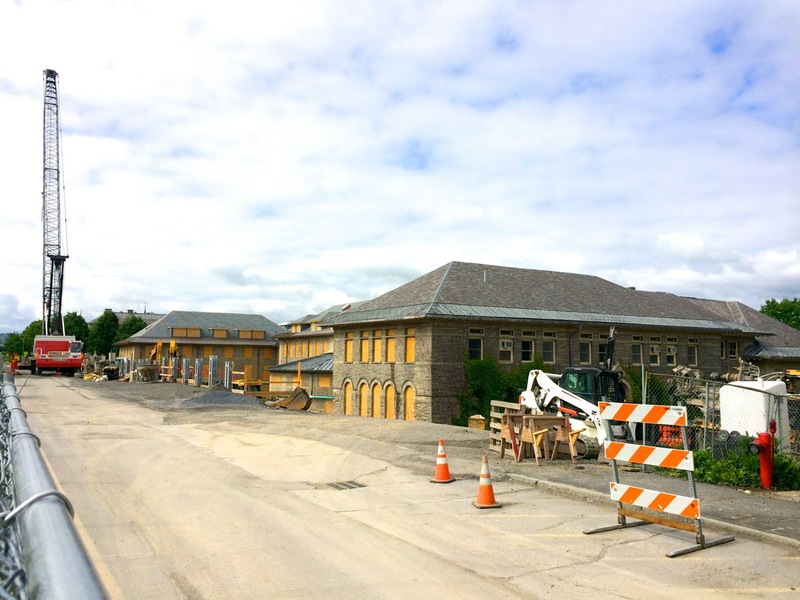 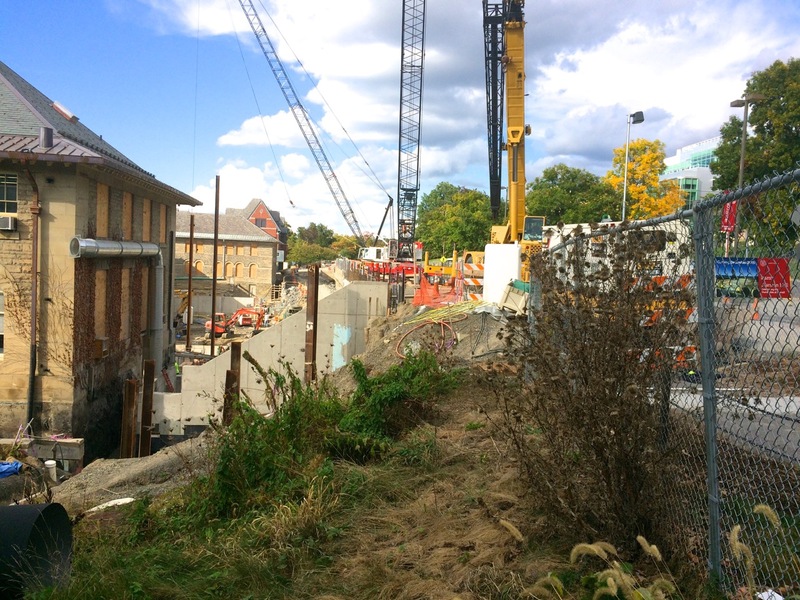 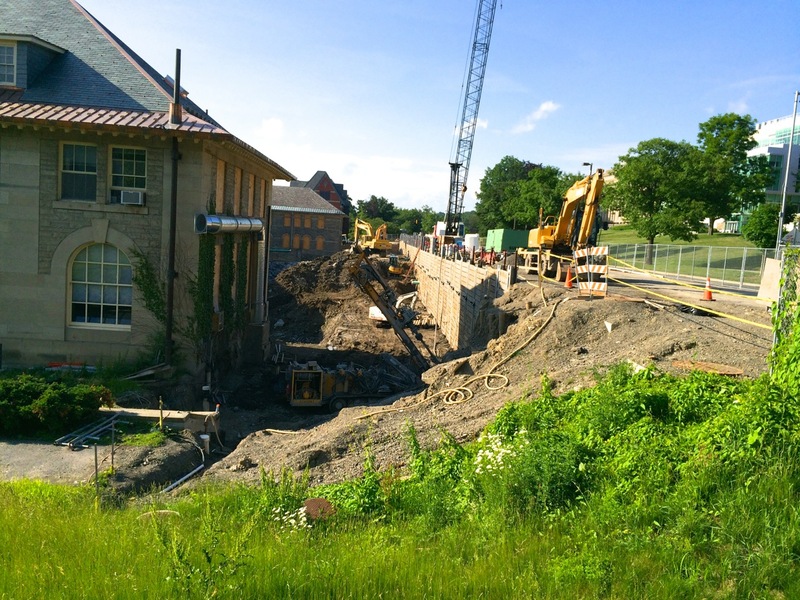 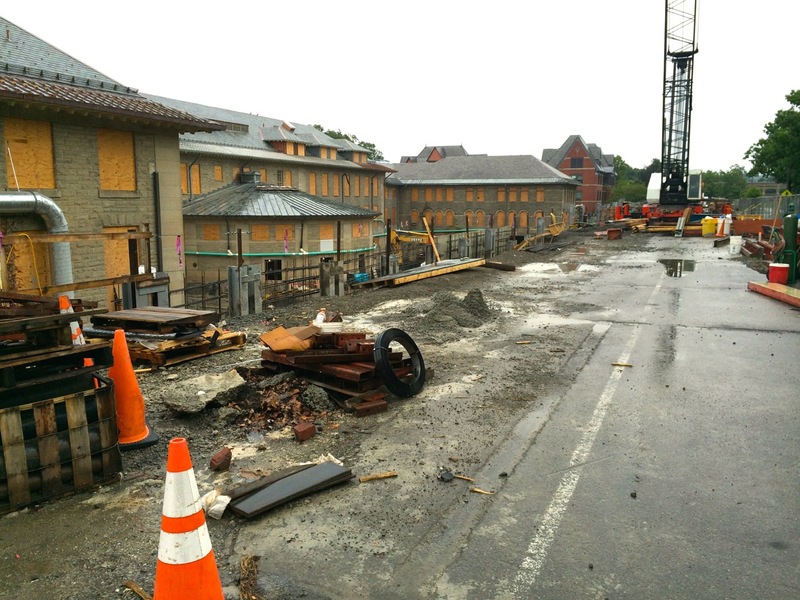 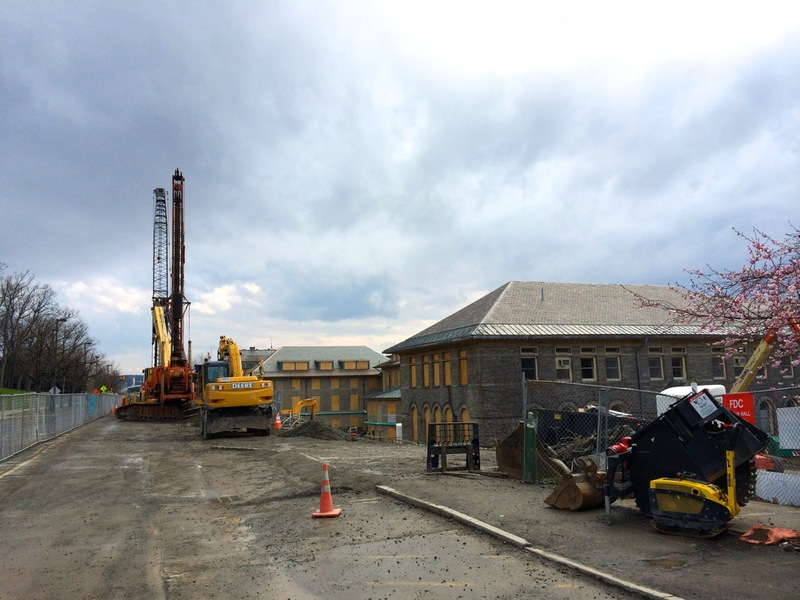 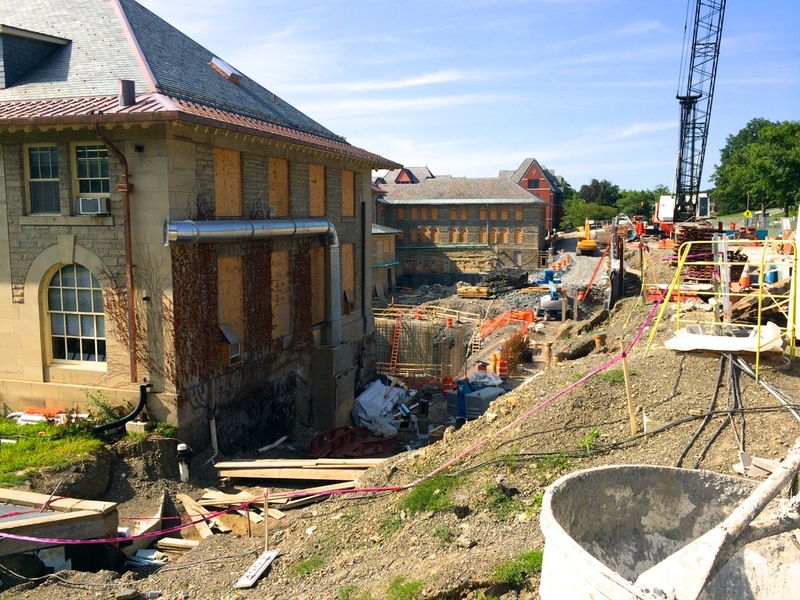 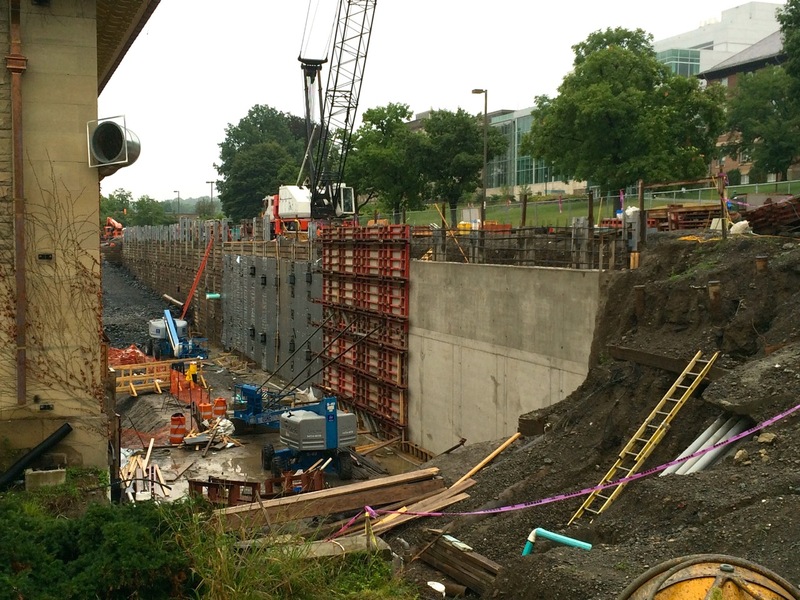 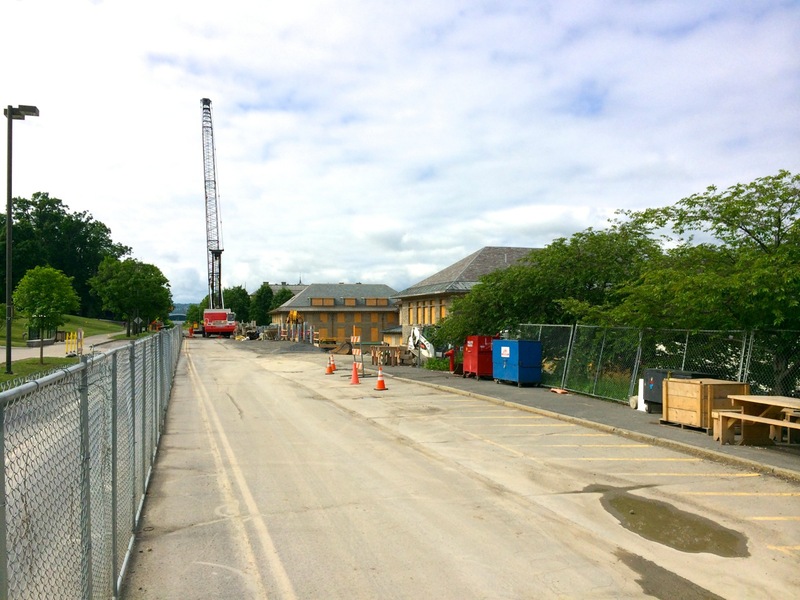 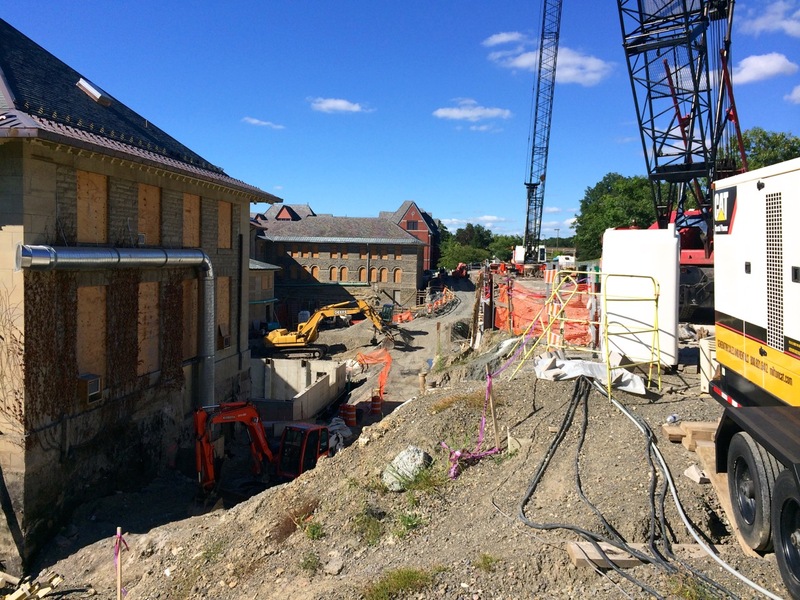 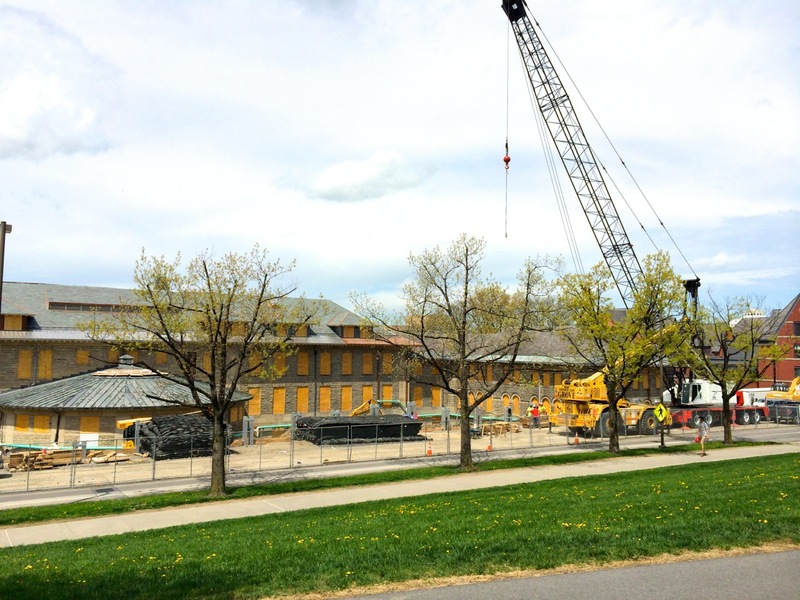 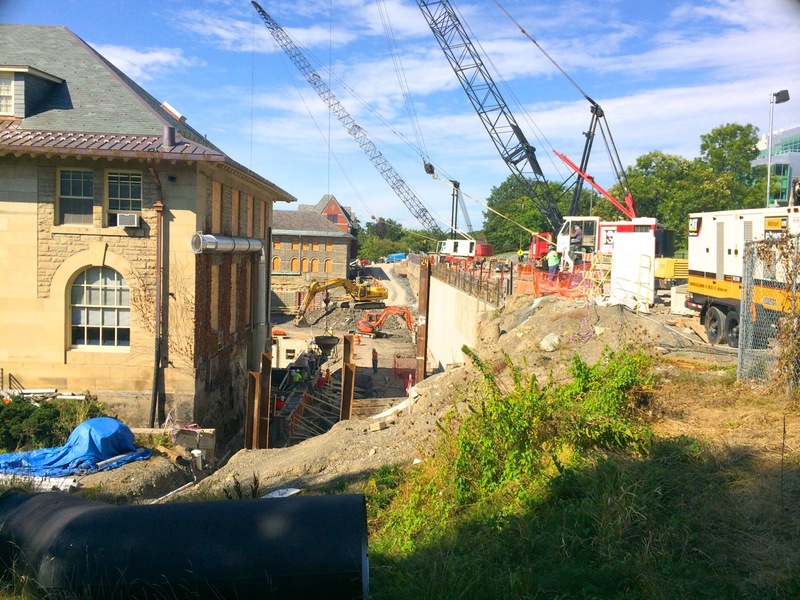 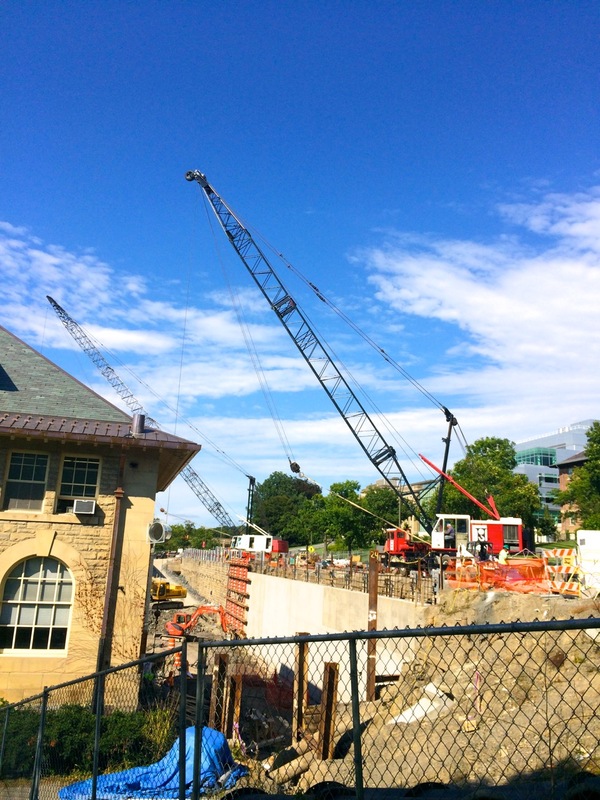 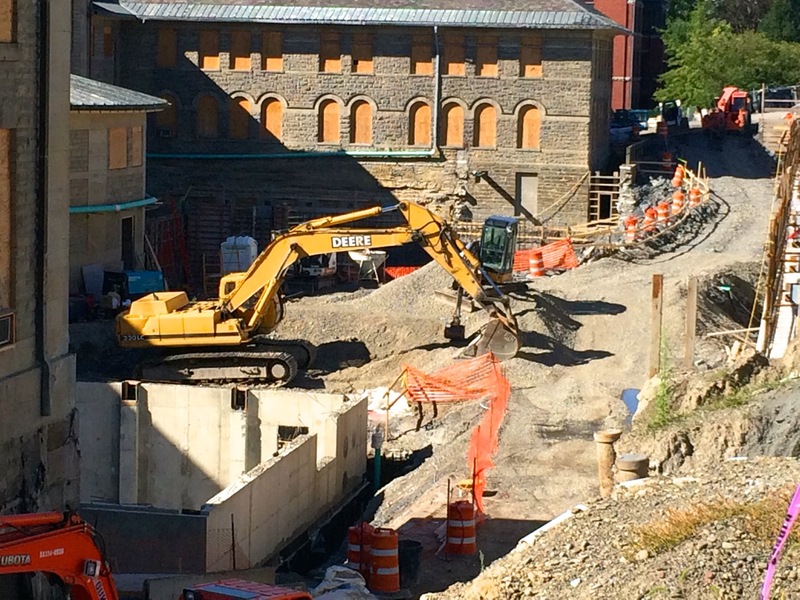 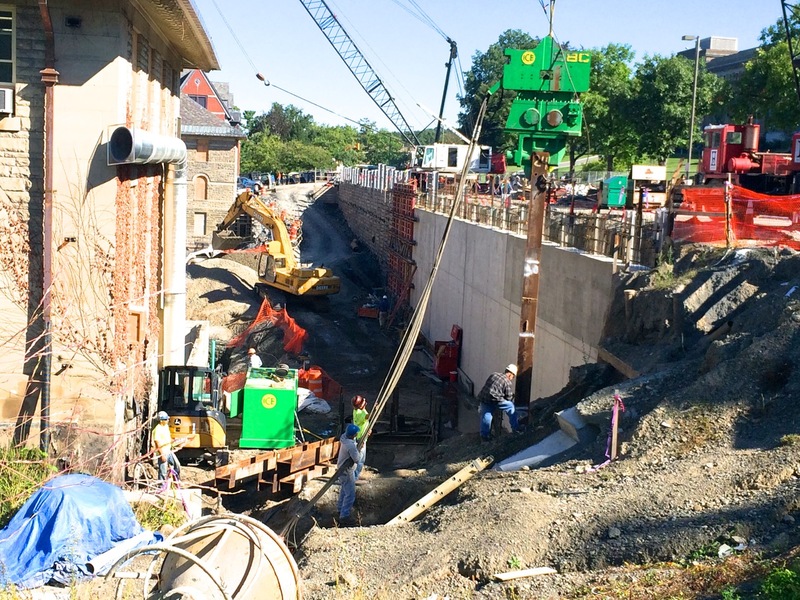 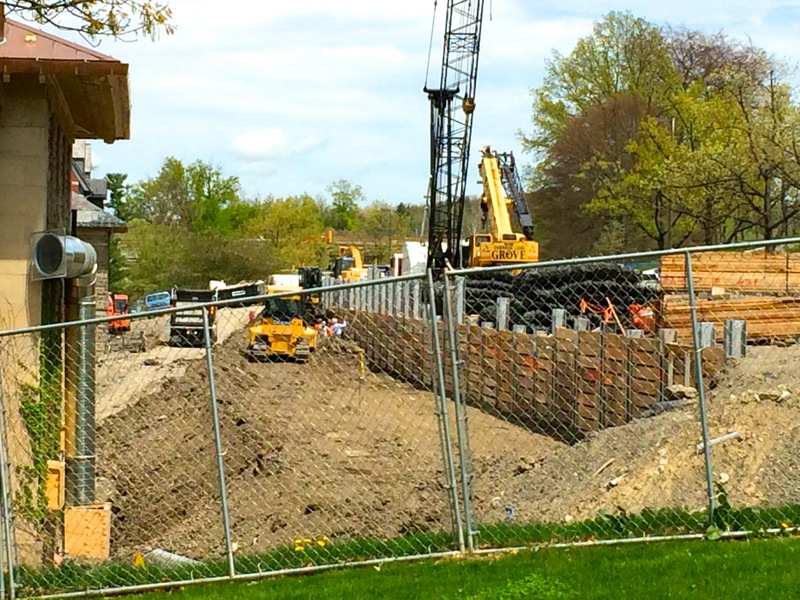 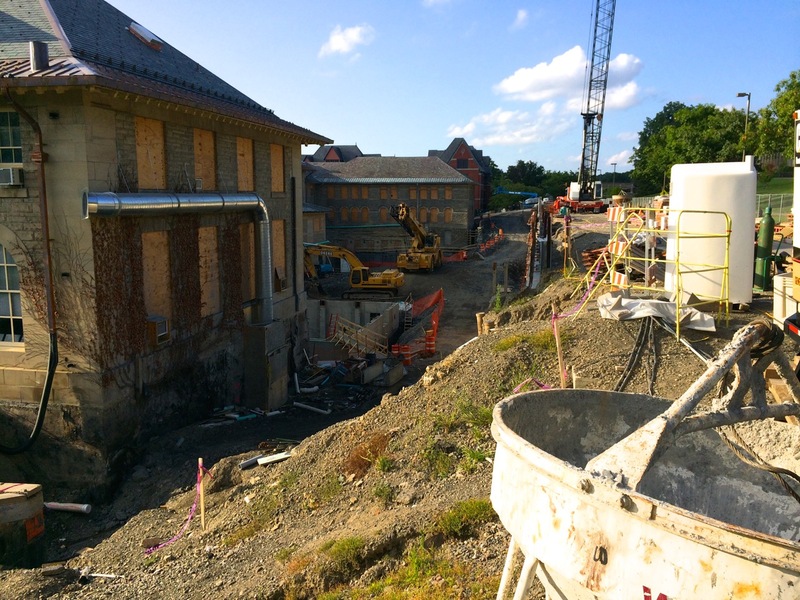 Excavation work for Cornell’s Klarman Hall Project between the wings of Goldwin Smith Hall has been making its way into bedrock, as Maine Drilling and Blasting has removed stone in the northern and southern blast zones. 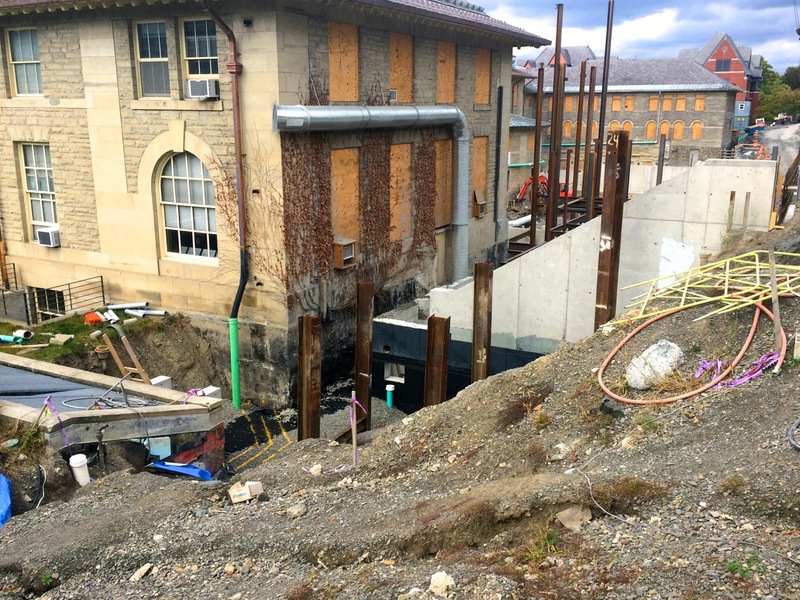 The foundation footings follow-up after the rock blasting, and it looks as if Welliver has constructed a series of rebar bends to form the reinforcement for some of the southern footings below. 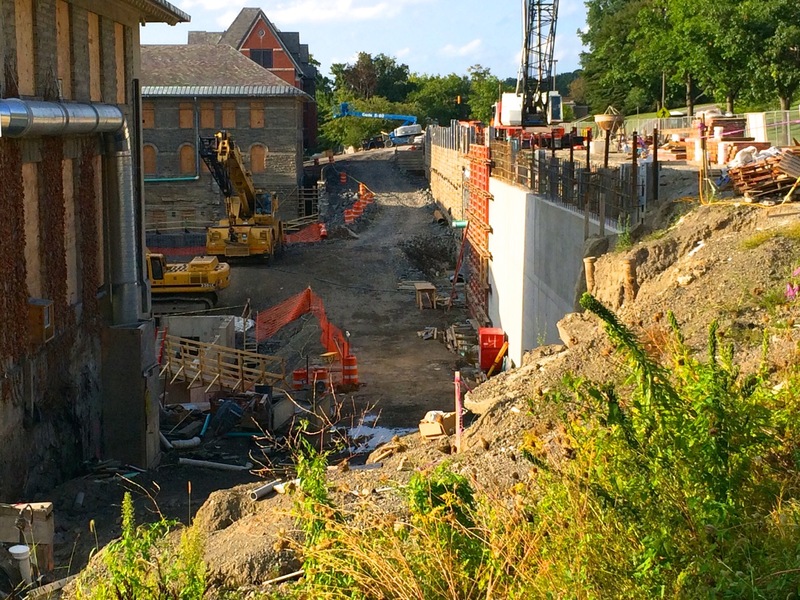 It’s been interesting getting a glimpse of the outside wall of Goldwin Smith Hall’s foundation: just a combination of stone, brick, and mortar, probably well over 2 feet thick. 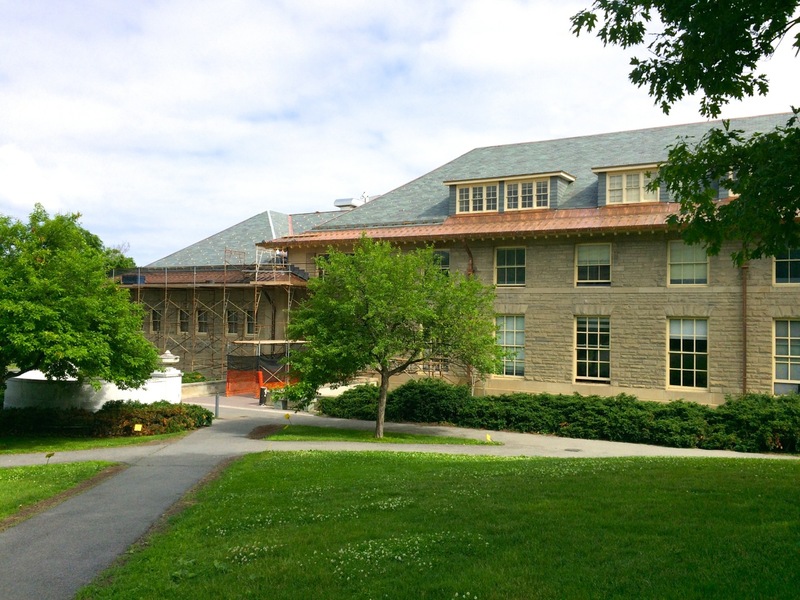 The building was originally constructed in 1892, around the time the two-way telegraph was invented to put things into perspective. 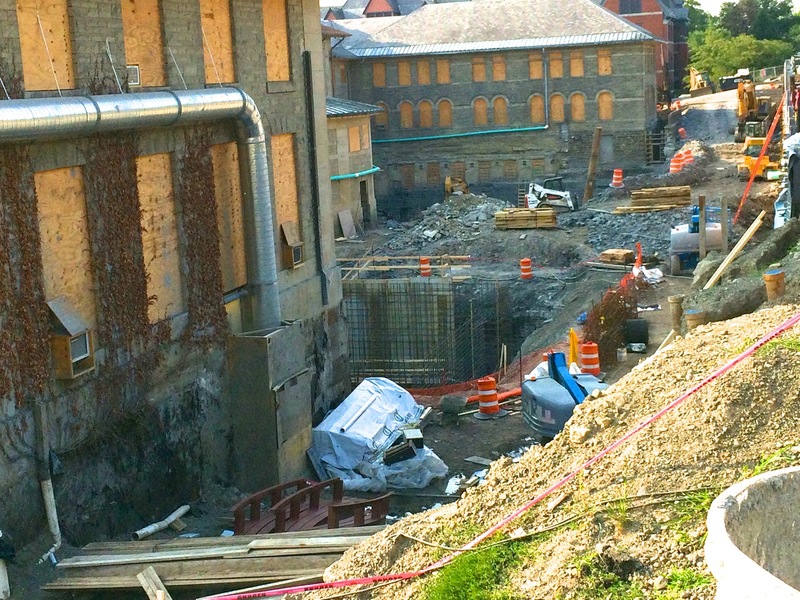 All the underpinnings were completed last month, and we should be seeing foundation work start in the next couple weeks. 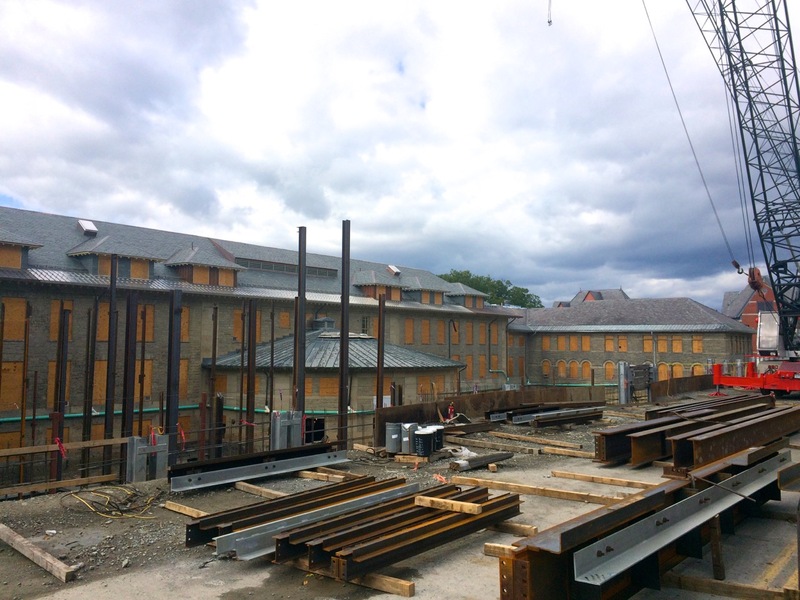 Concrete forms will be situated starting at the south end, then steel reinforcement tied in-place, then concrete poured into the form. 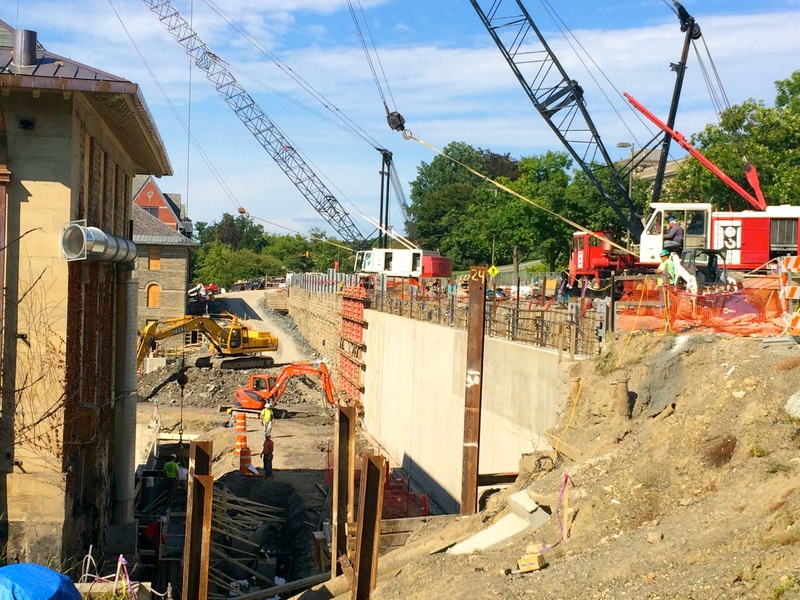 The foundation walls and steel erection phases will also go from south to north, so by the time northern foundation walls are being formed, structural steel will have begun placement on the south end. 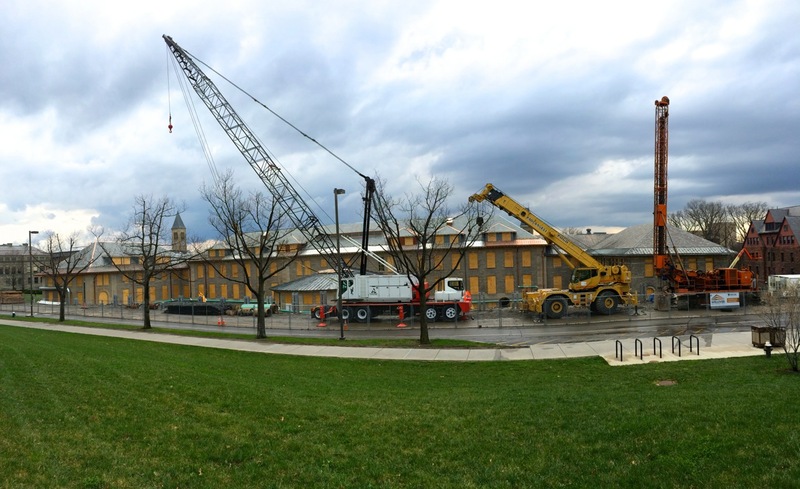 Should be a nice one to watch as it goes up. 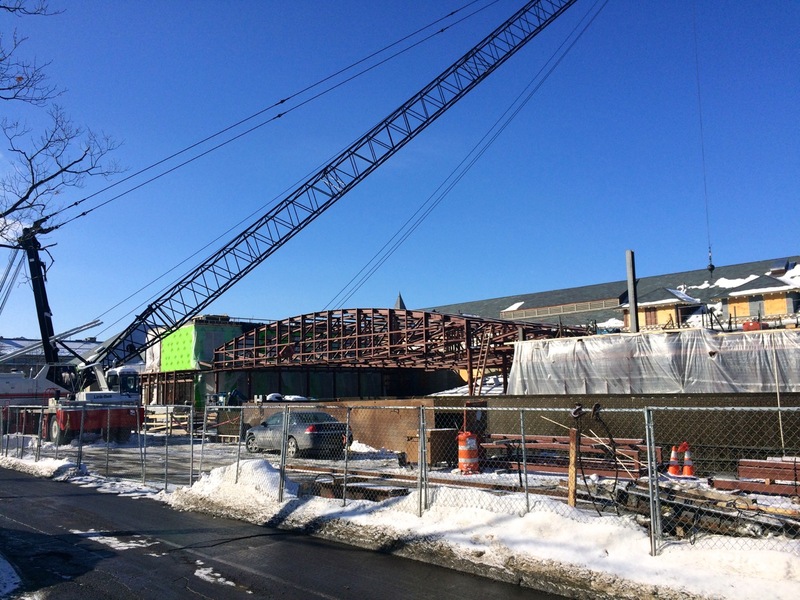 Quite an elevation change too; this one starts well below-grade, a lot like the recent Law School Expansion, constructiom which was also managed by Welliver. The design for Klarman Hall is by Koetter | Kim & Associates. 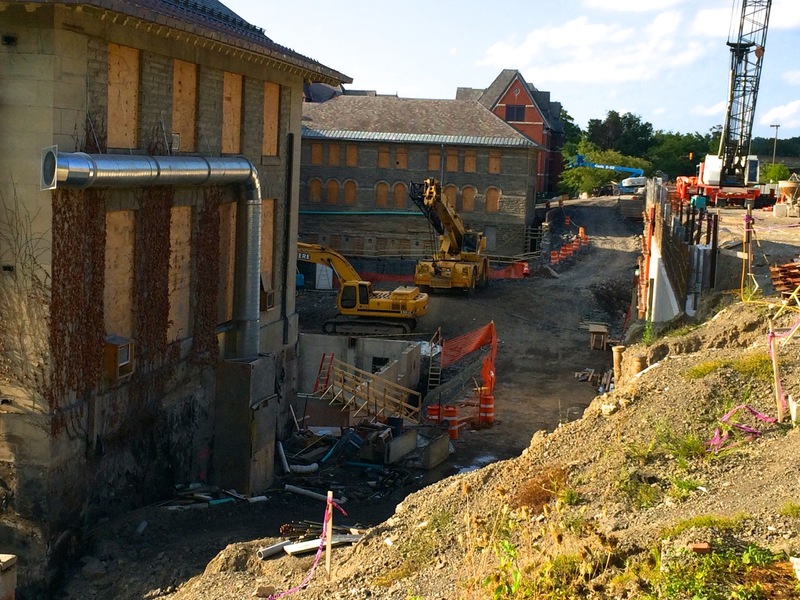 An excavator has been removing soil in front of the shoring wall along East Ave, and re-roofing work on Goldwin Smith has progressed to the west side of the building, facing the Arts Quad. 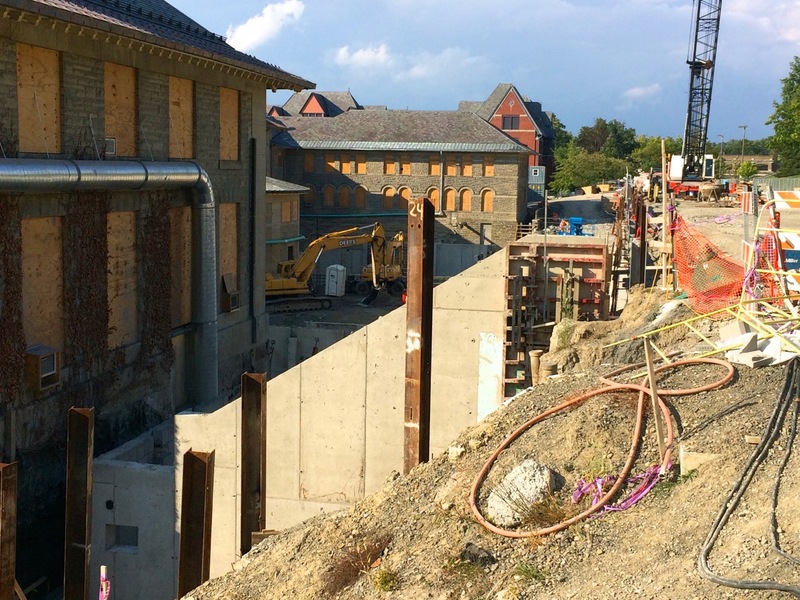 I’m not positive, but in looking at the drawings, there must be another shoring wall to go in closer to East Ave. in order to excavate another section of soil for the future building’s foundation. 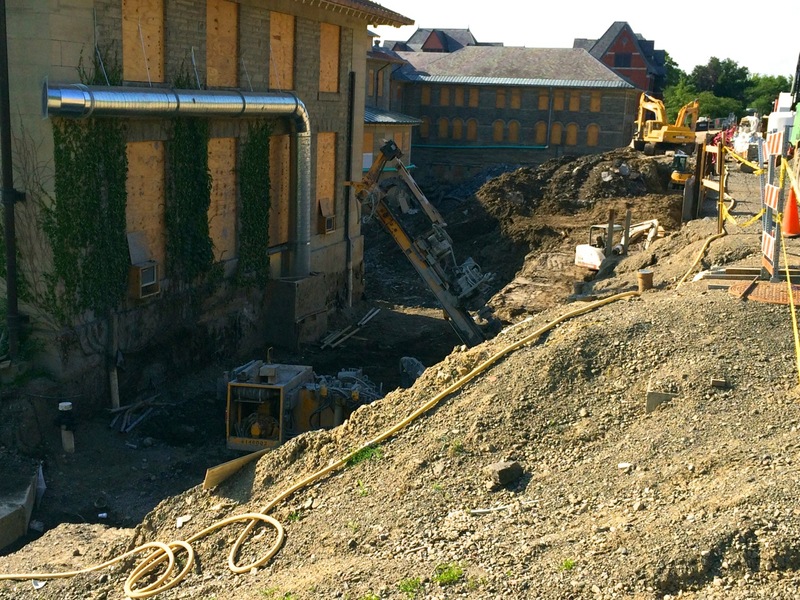 The project schedule shows rock removal beginning about a week from now, so there’s probably a solid layer of bedrock underneath the excavated area. 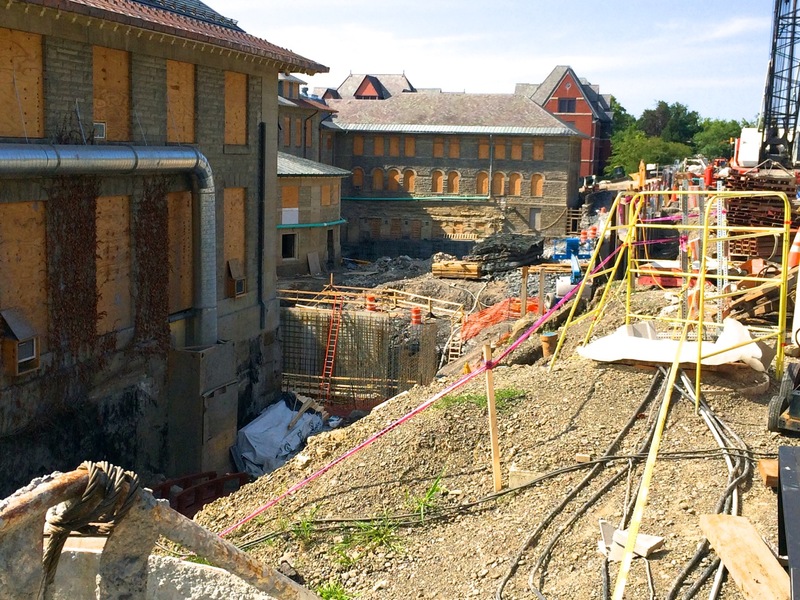 The lowest floor of Klarman Hall will sit nearly equal with Goldwin Smith’s lowest floor, so the excavation will be going down much further. 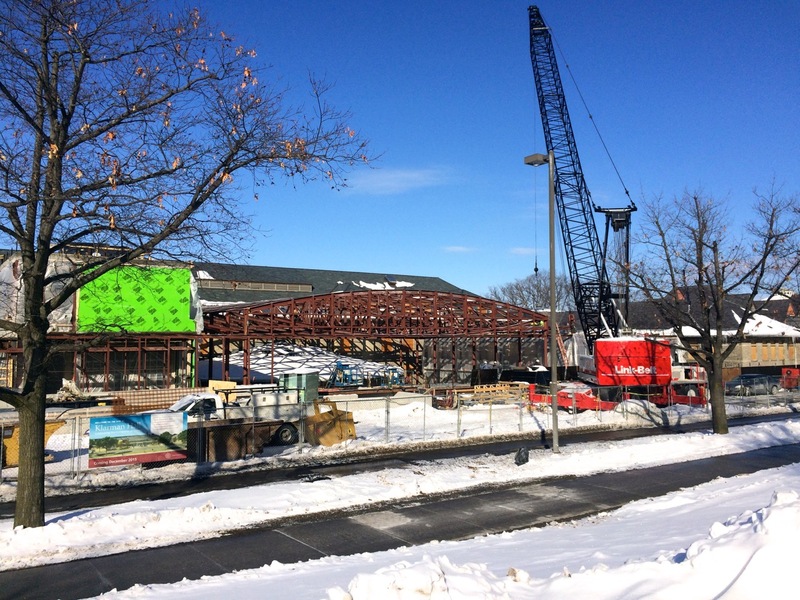 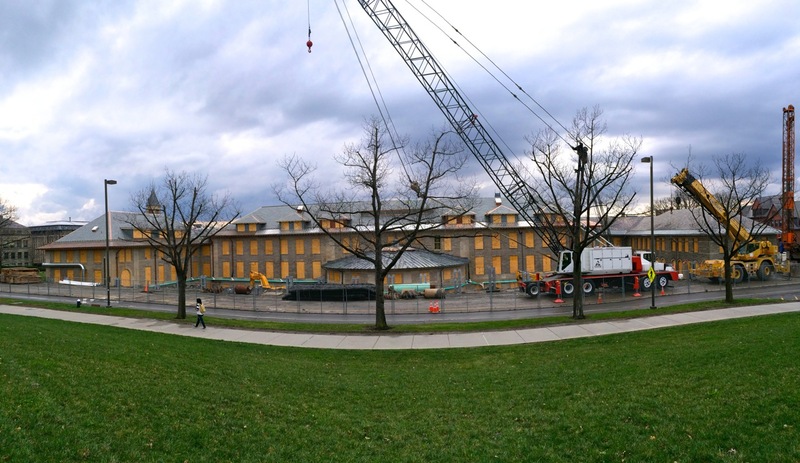 Klarman Hall will be a new 33,250 square foot Humanities Building, designed by Koetter | Kim & Associates and built by Welliver to be completed around the end of 2015. 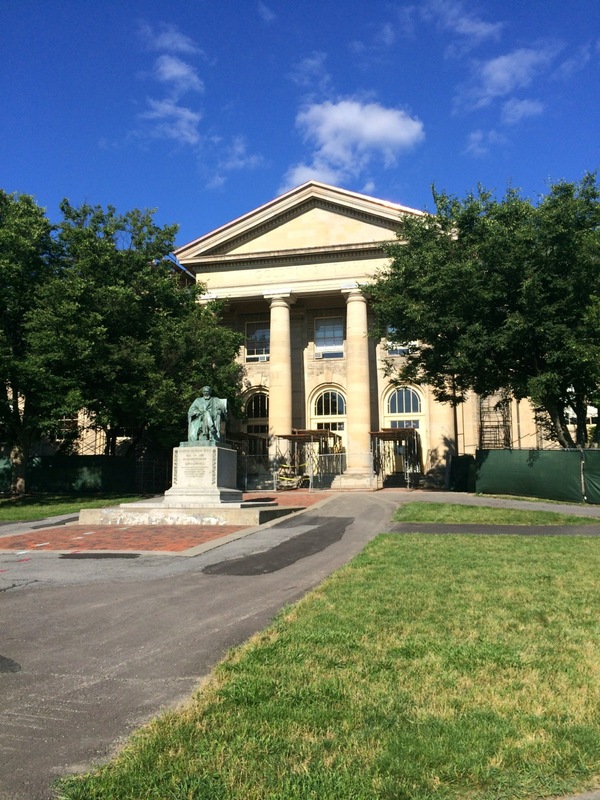 Goldwin Smith Hall was built in 1892, designed by Charles Osborne (an architecture professor), Carrère and Hastings (a prominent Beaux-Arts/neo-classical architecture firm). 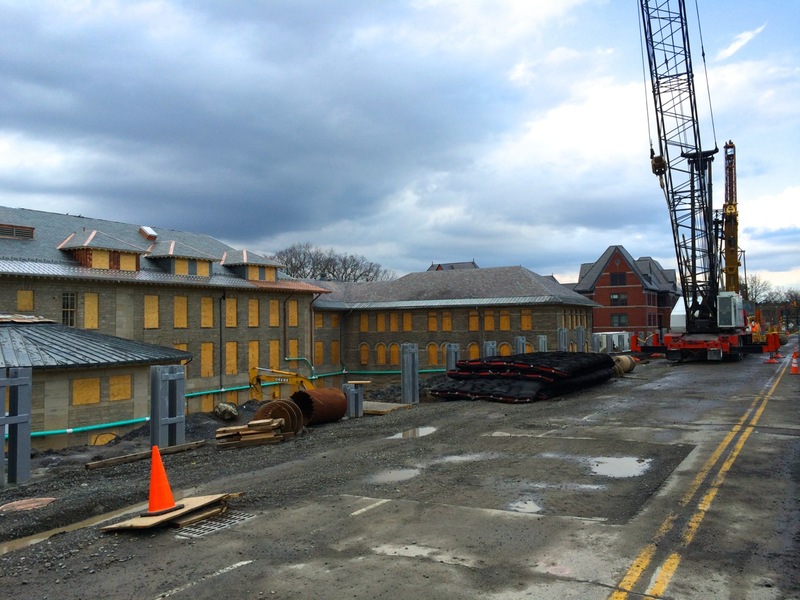 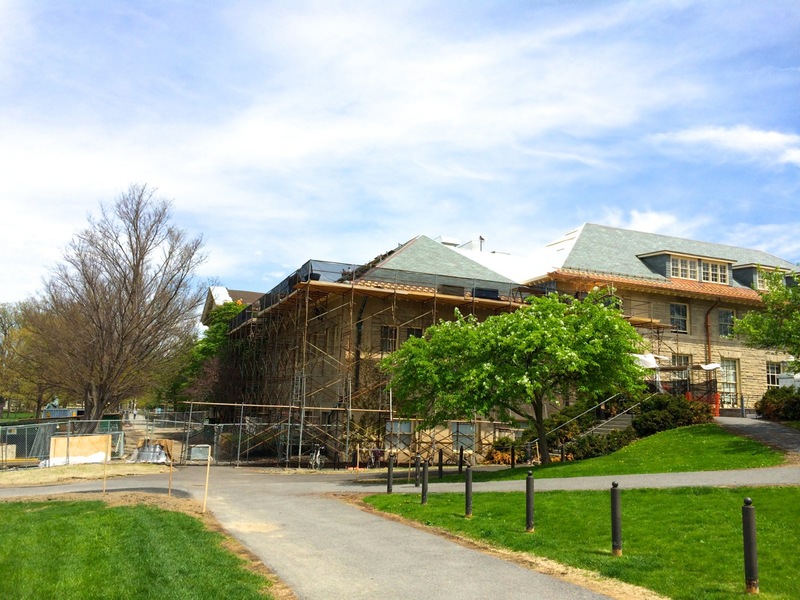 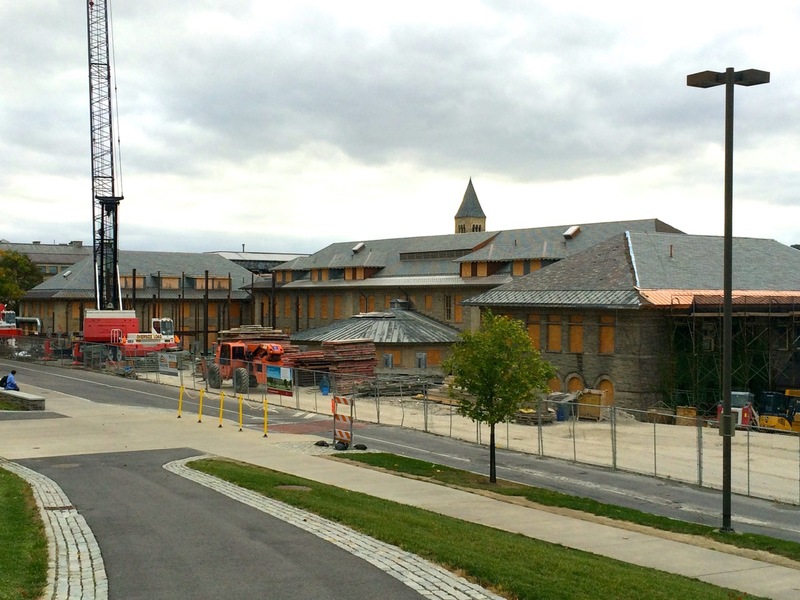 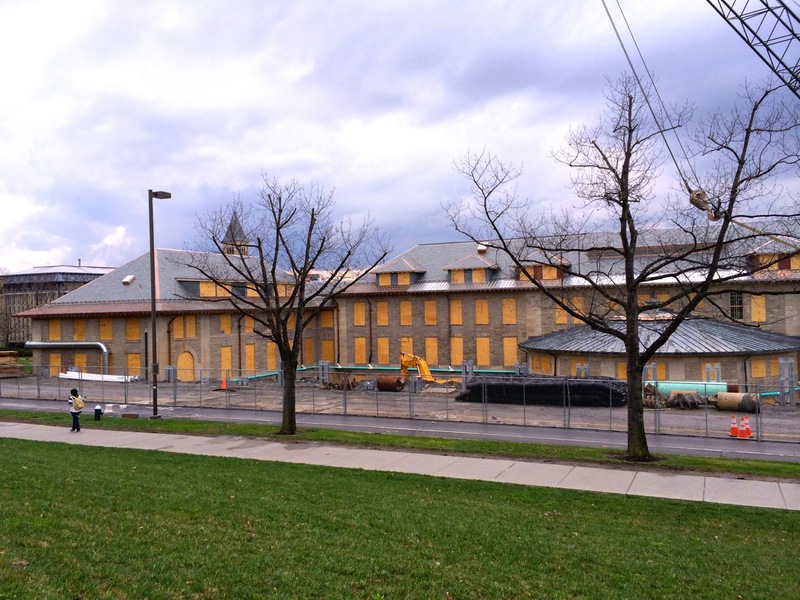 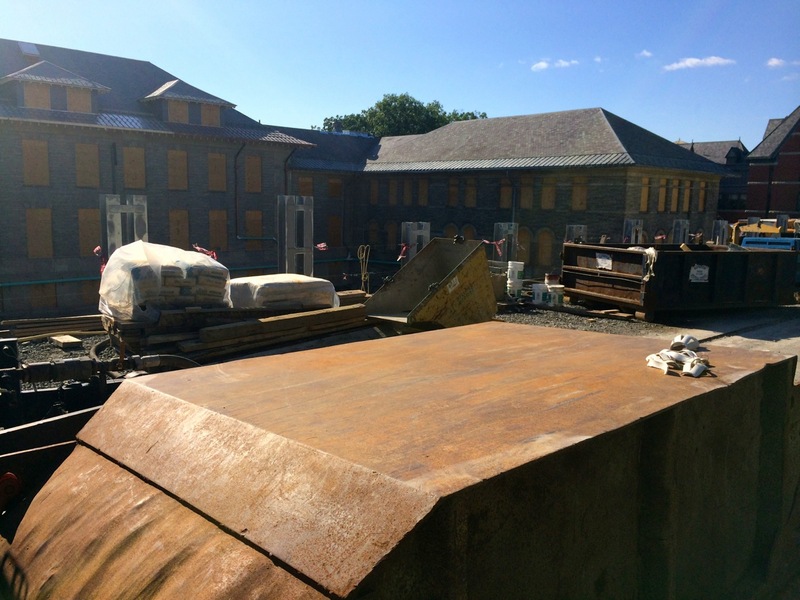 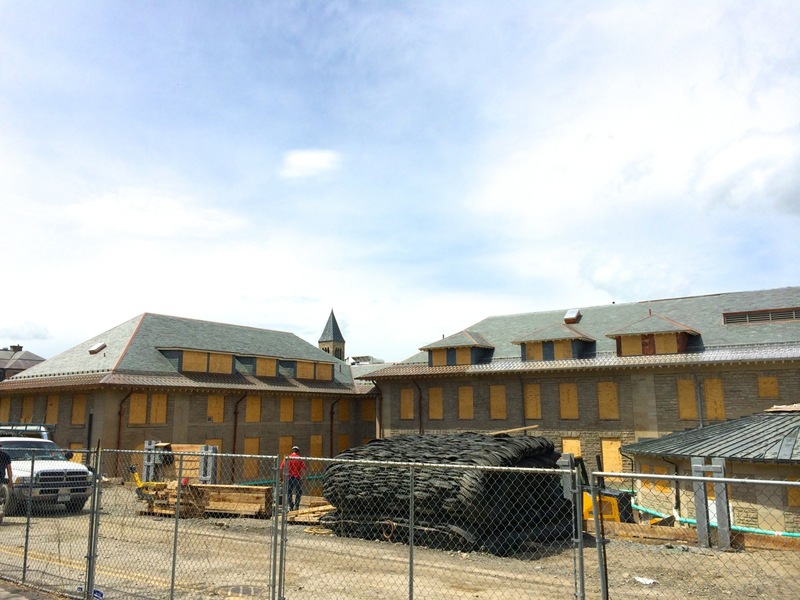 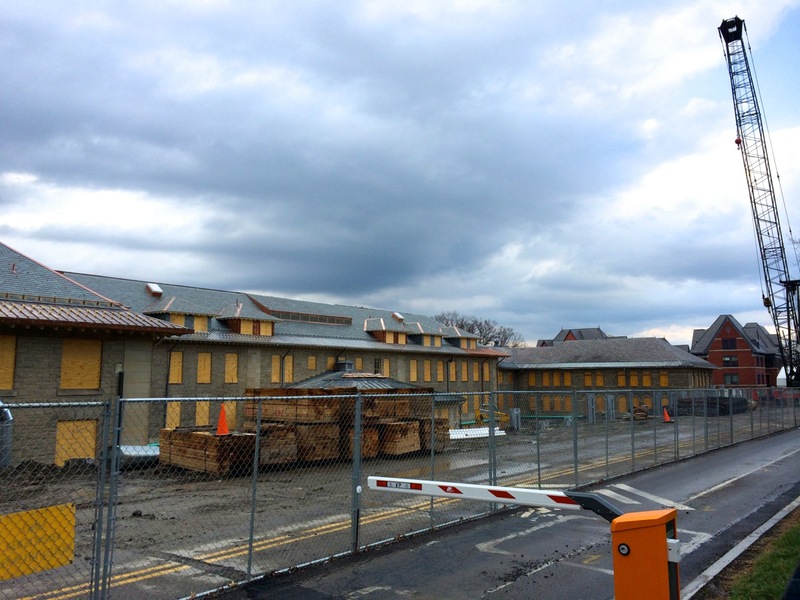 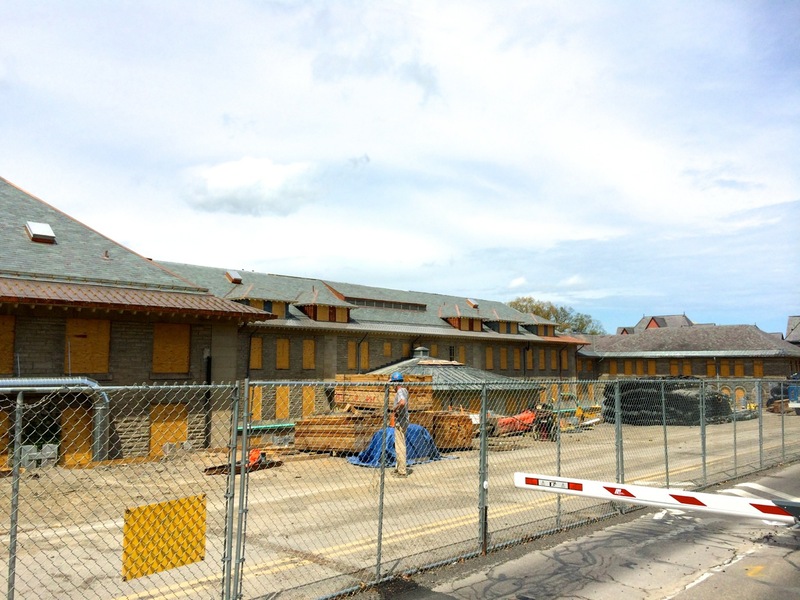 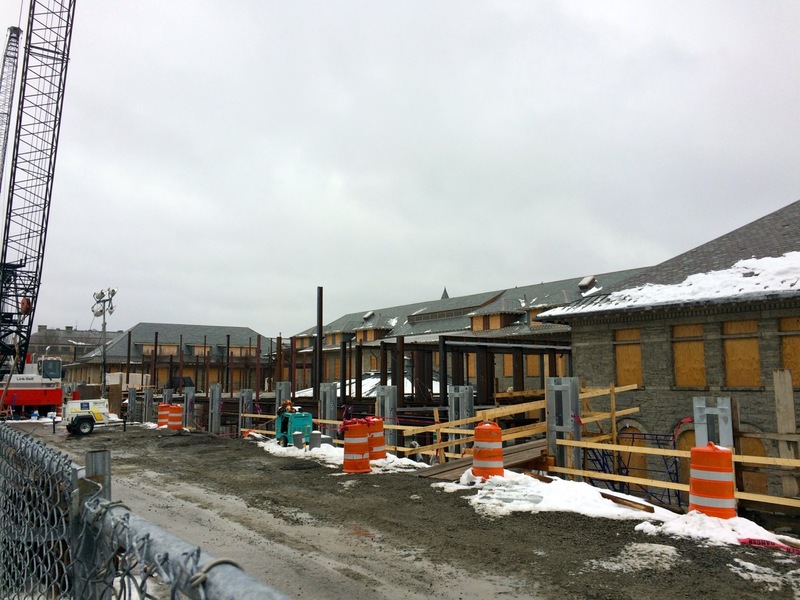 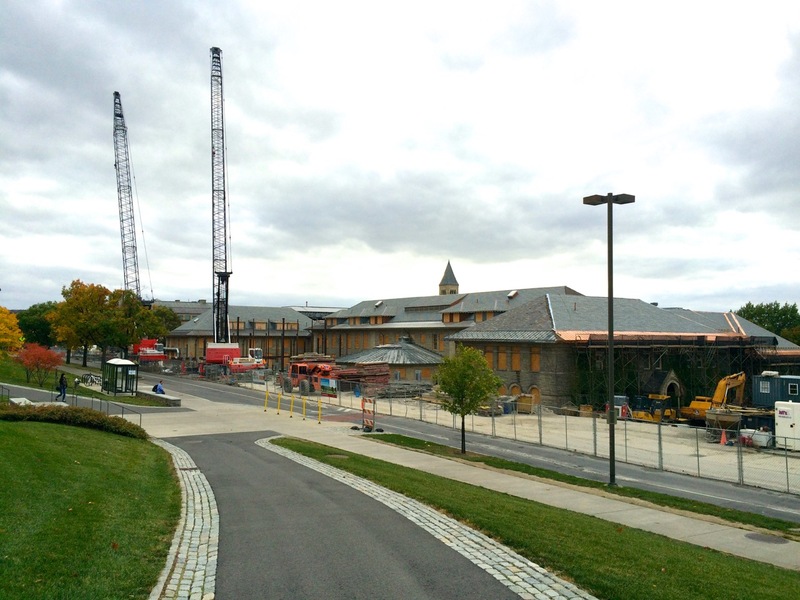 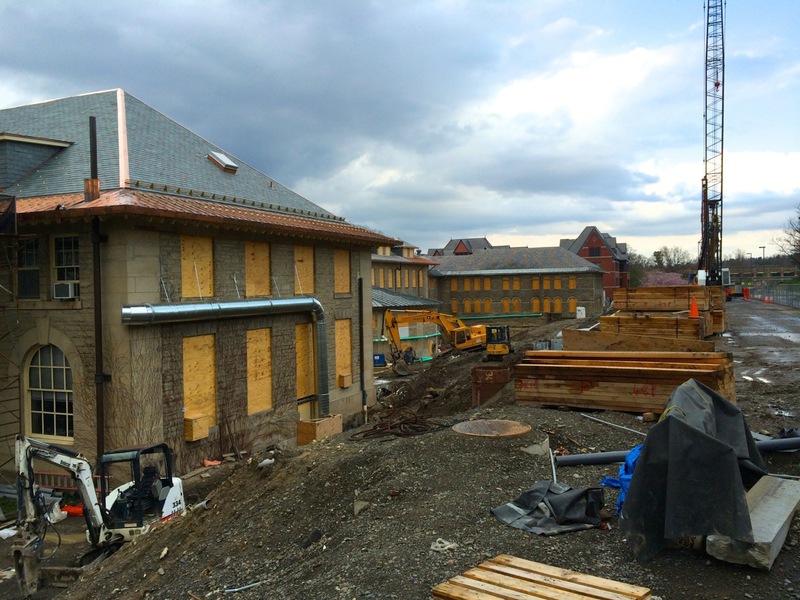 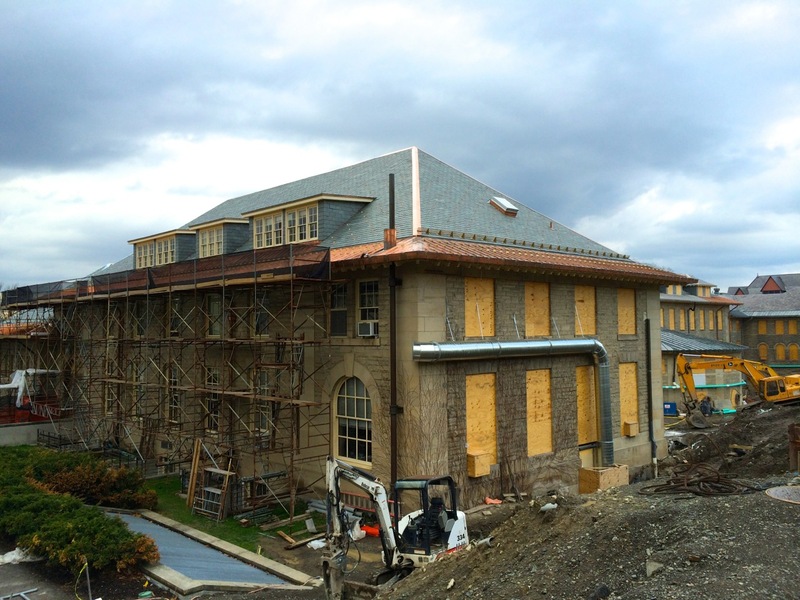 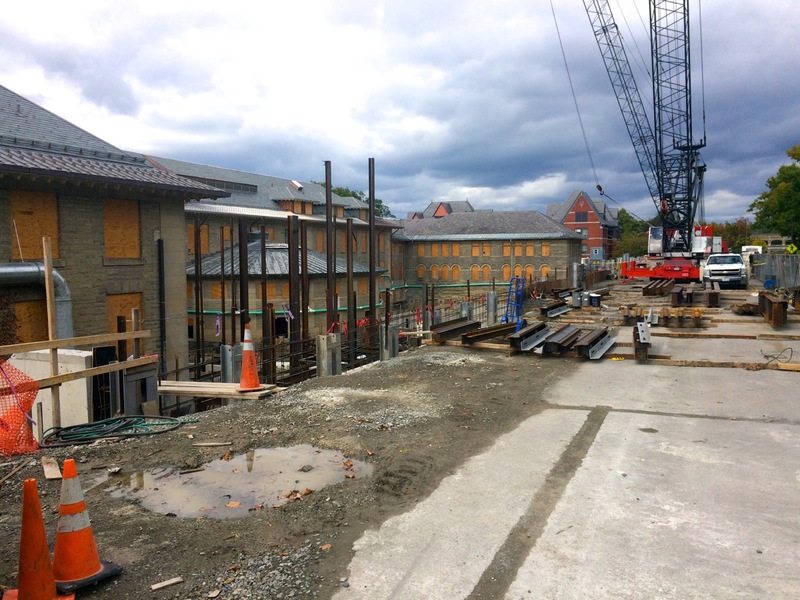 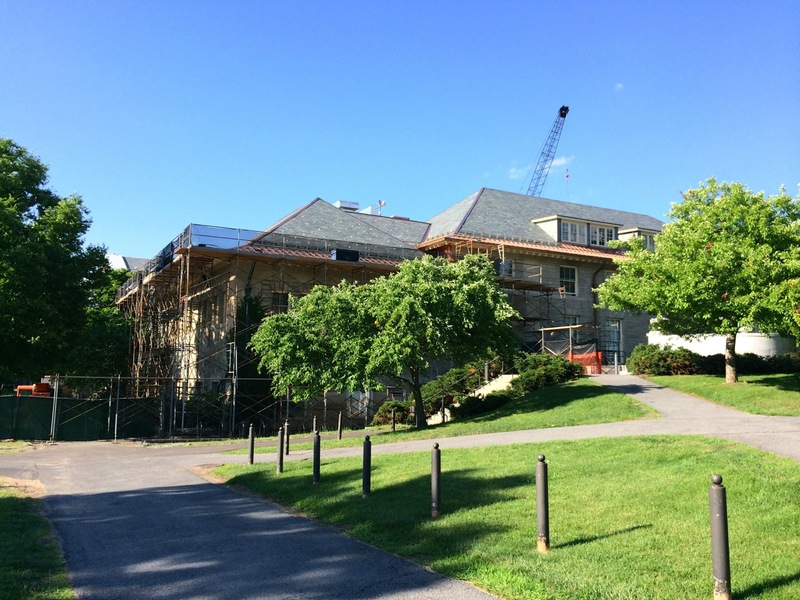 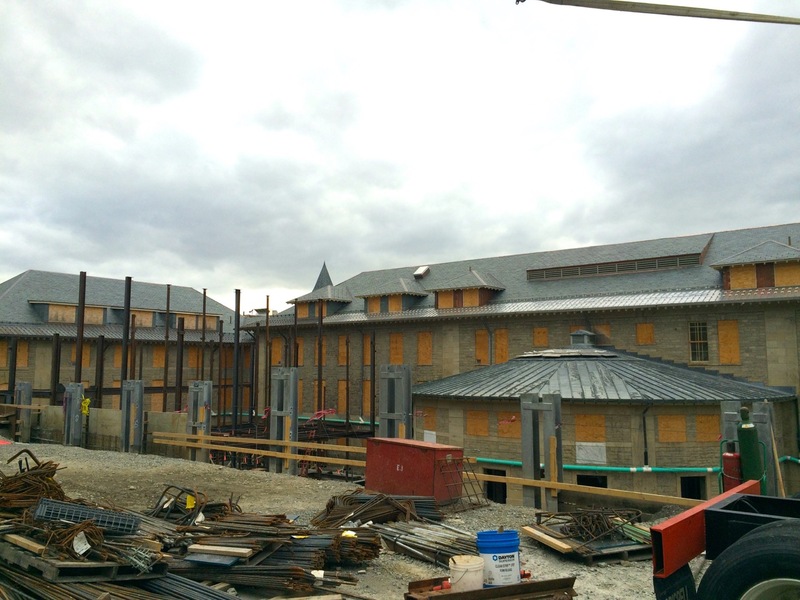 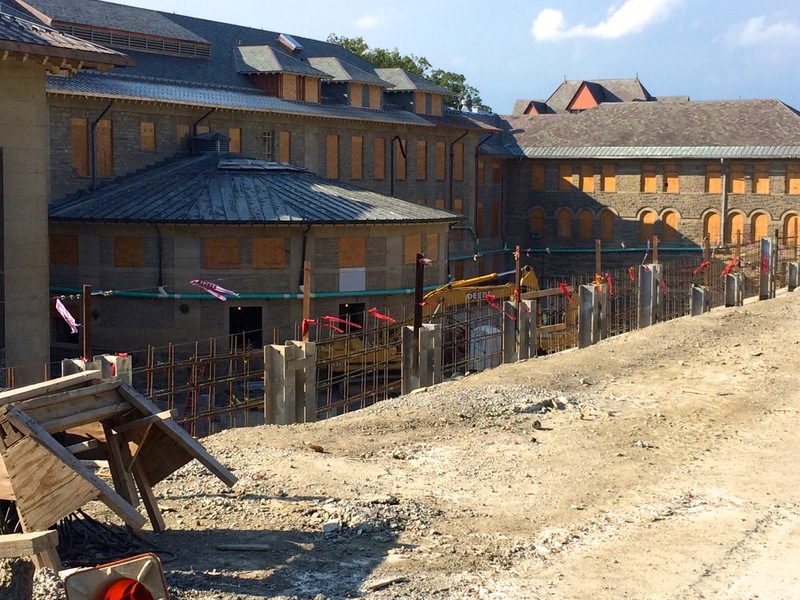 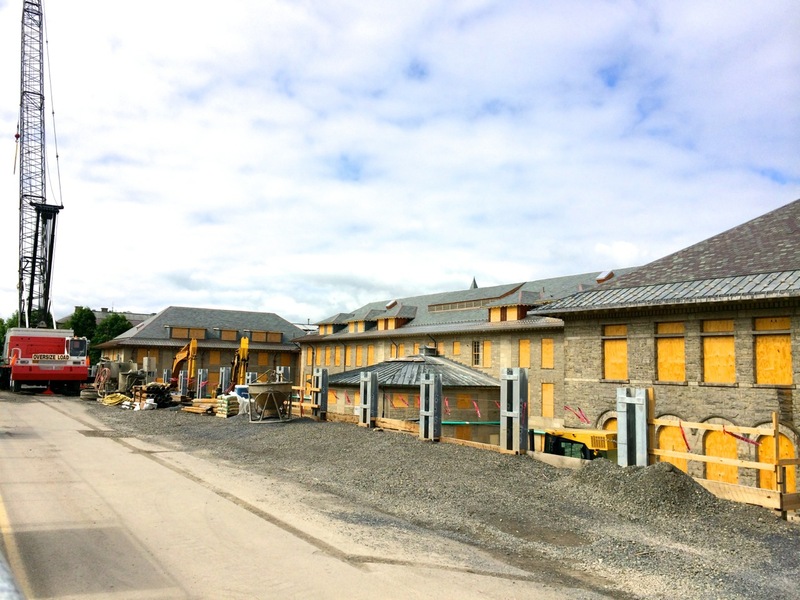 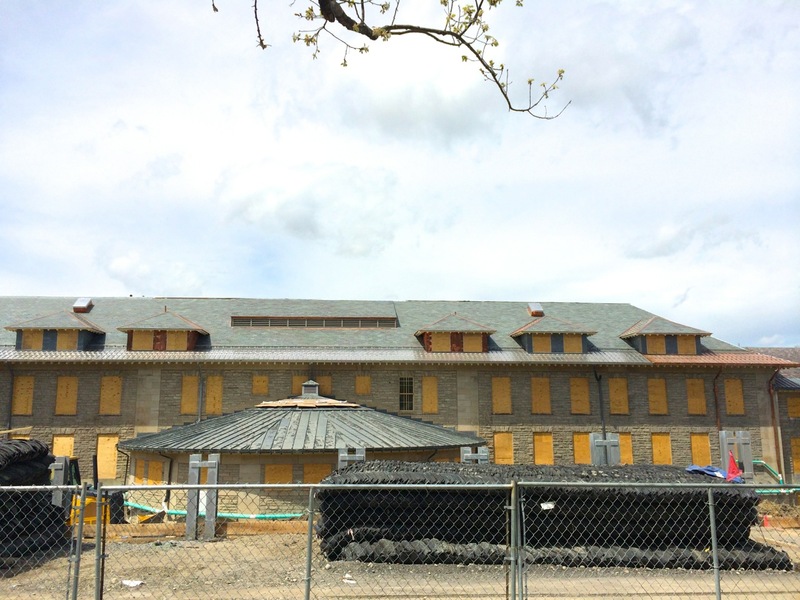 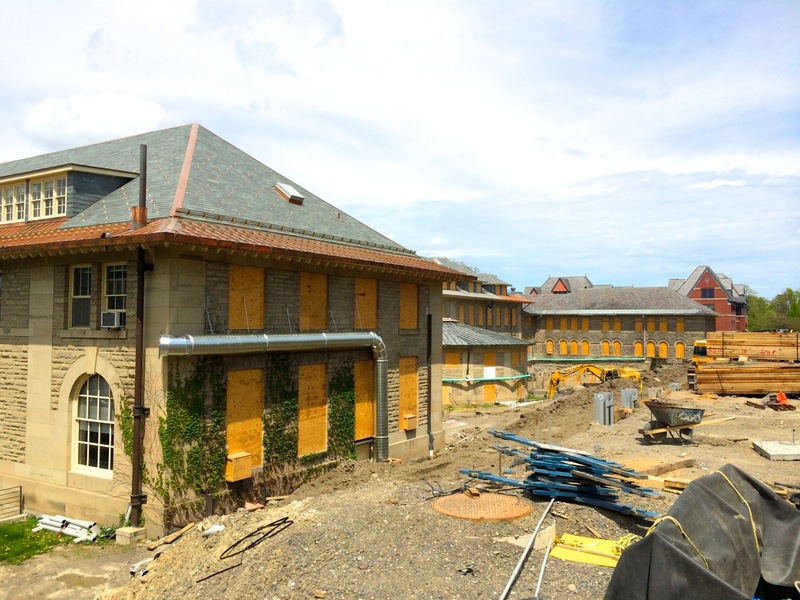 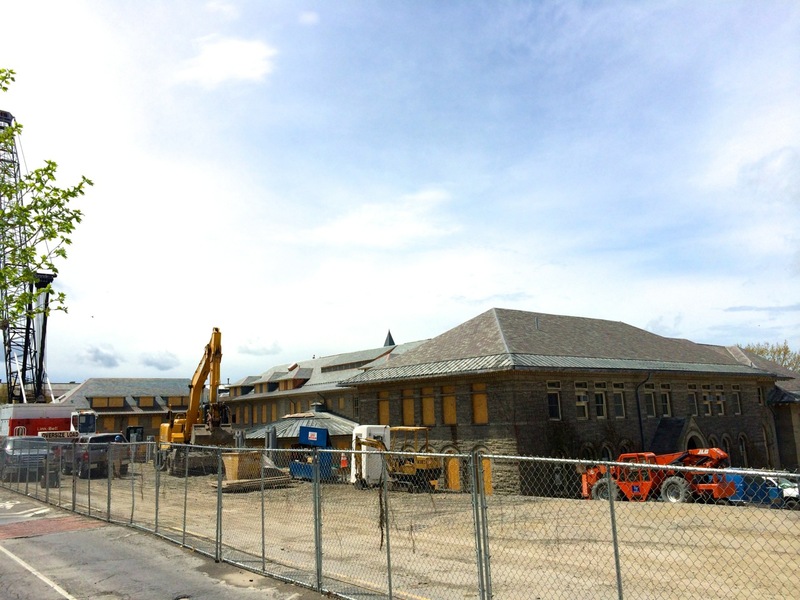 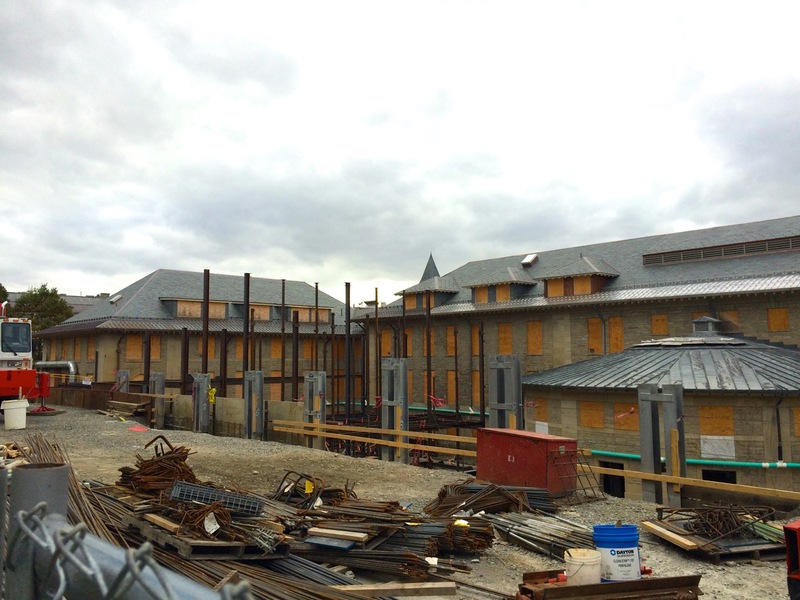 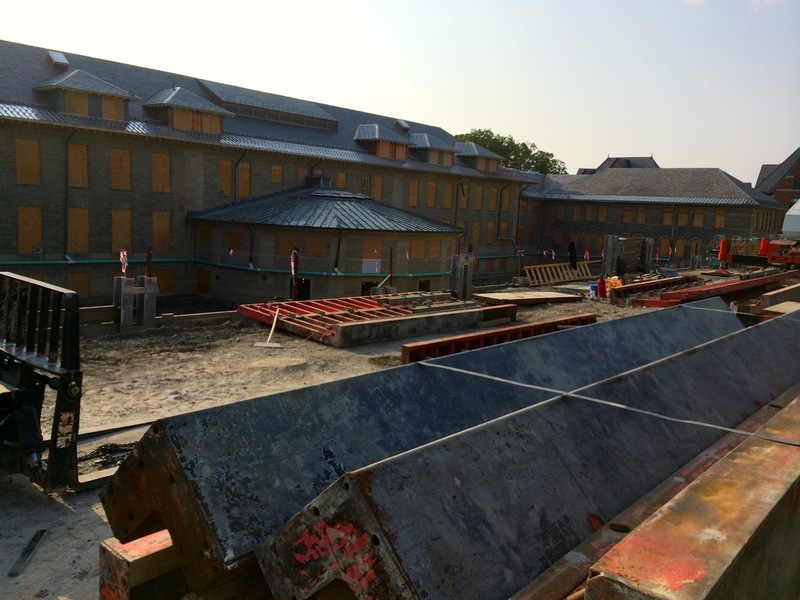 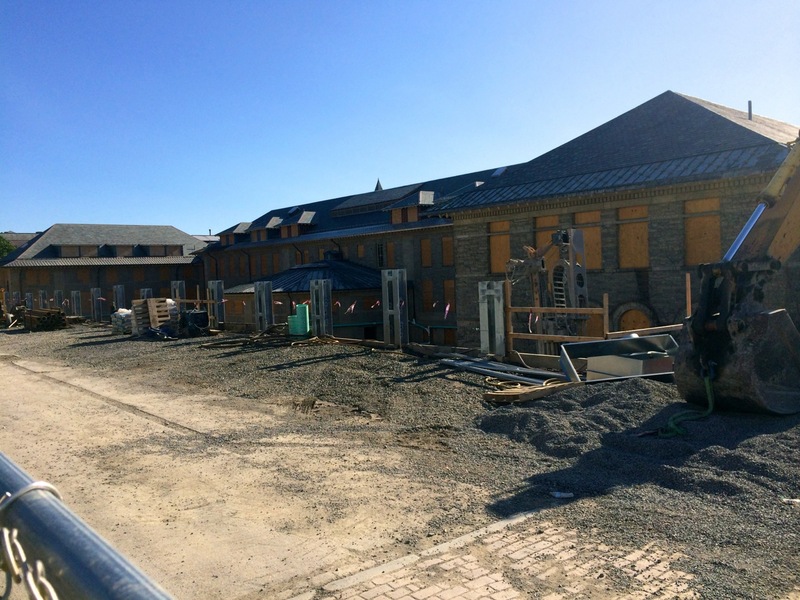 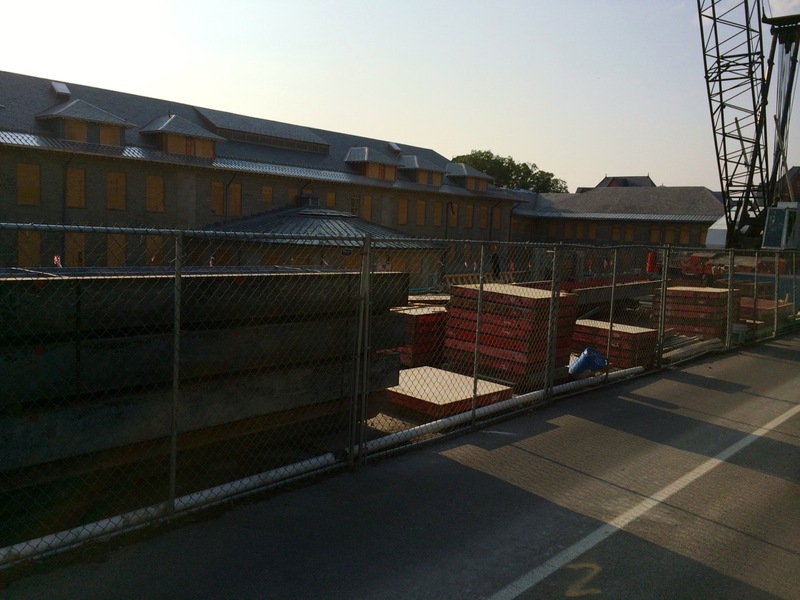 The metal shoring beams along East Ave appear to have been completed since early April, and the slate and metal re-roofing of Goldwin Smith Hall has progressed to the far southern edge. 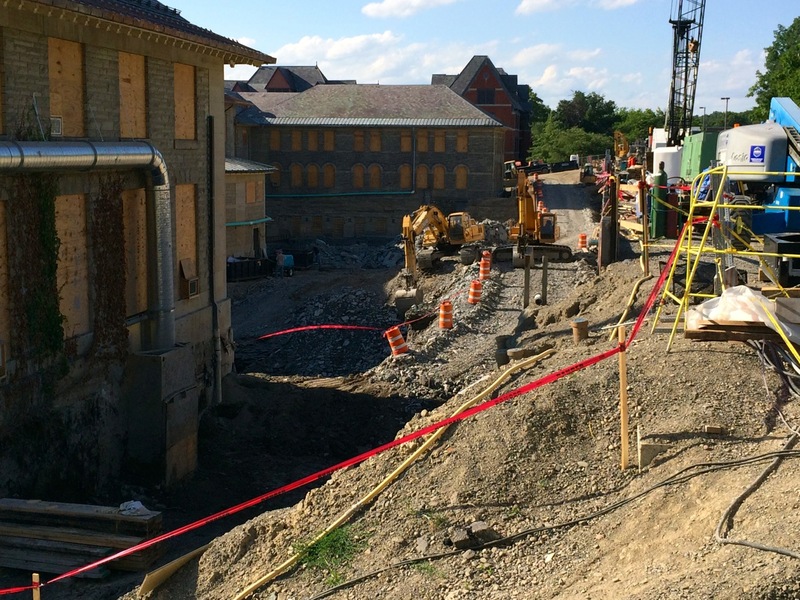 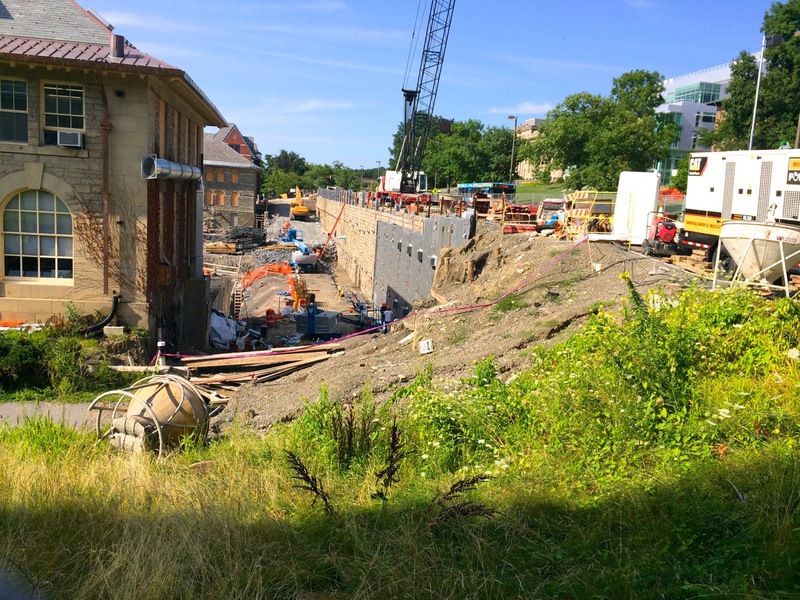 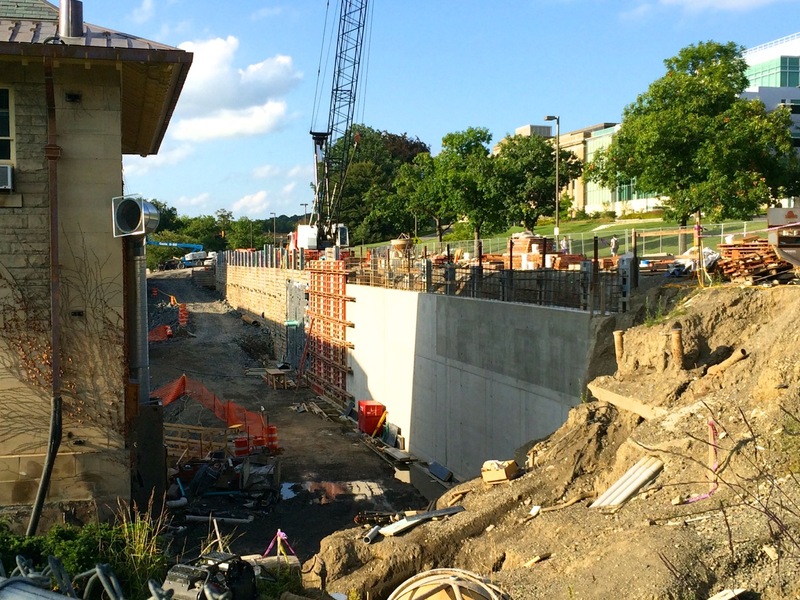 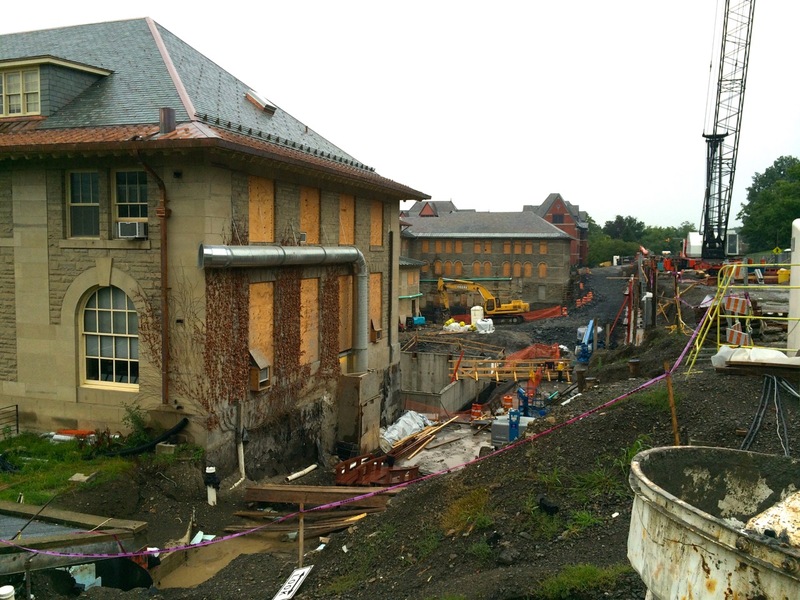 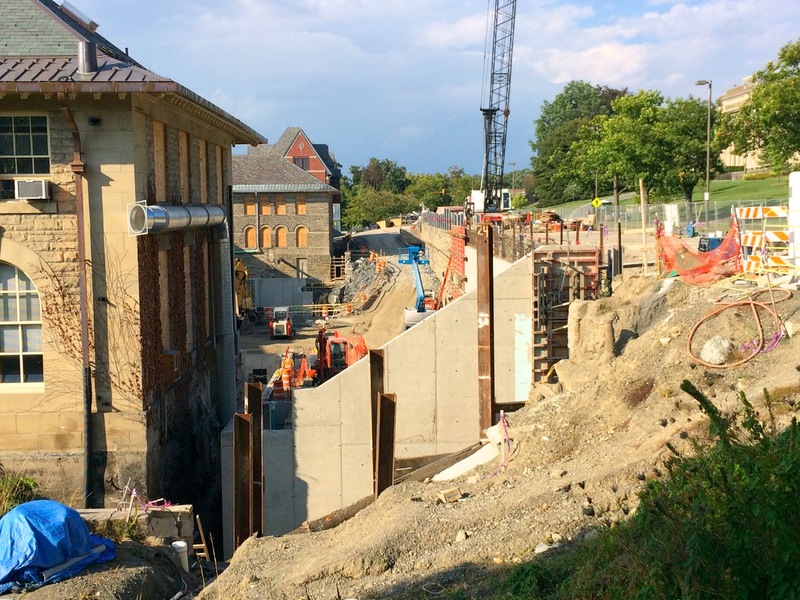 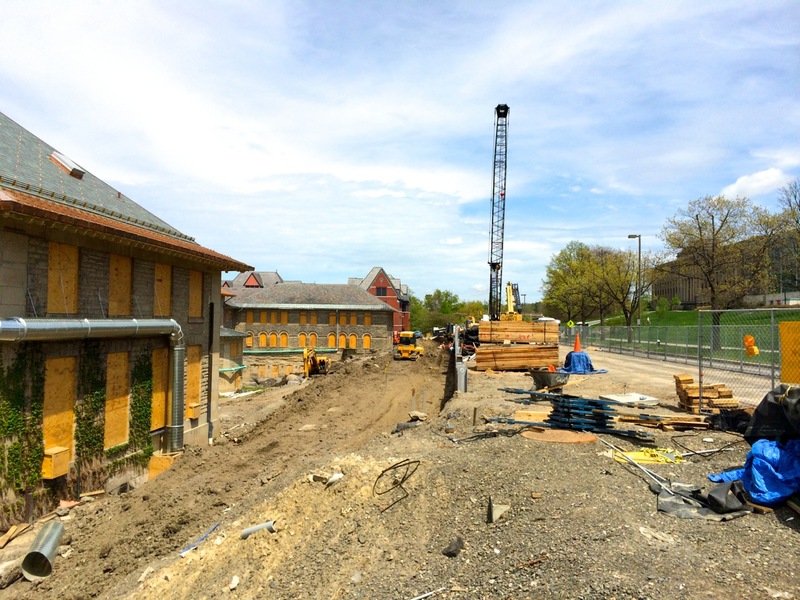 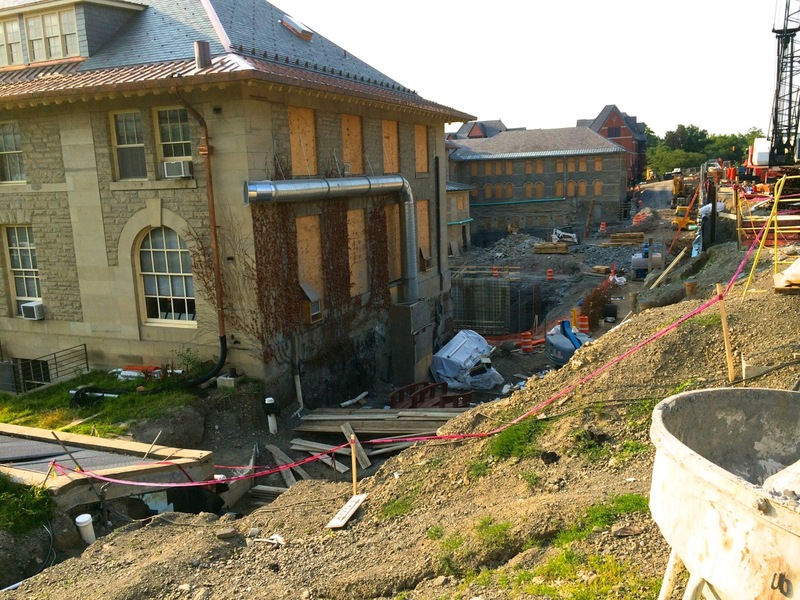 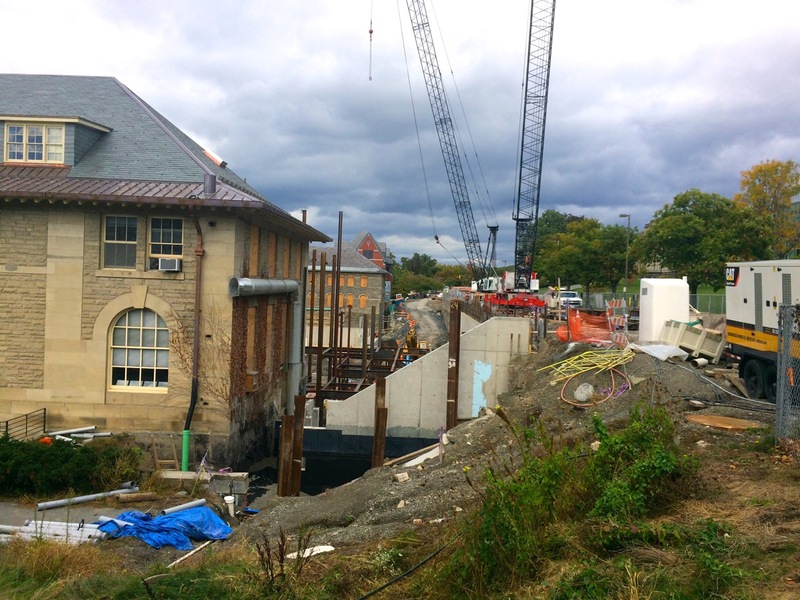 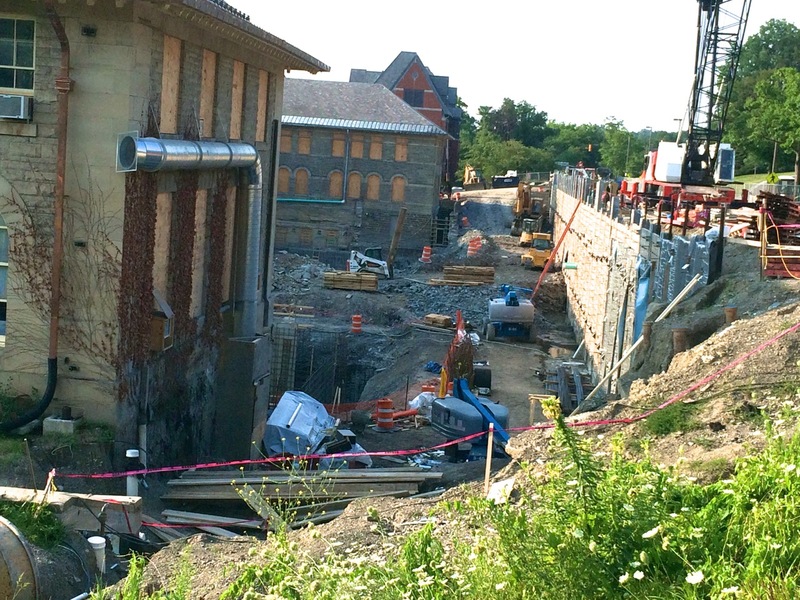 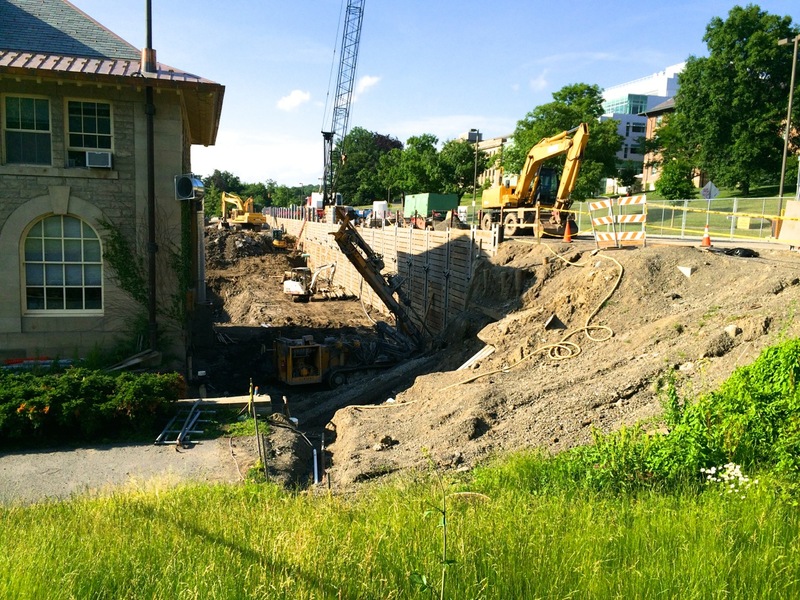 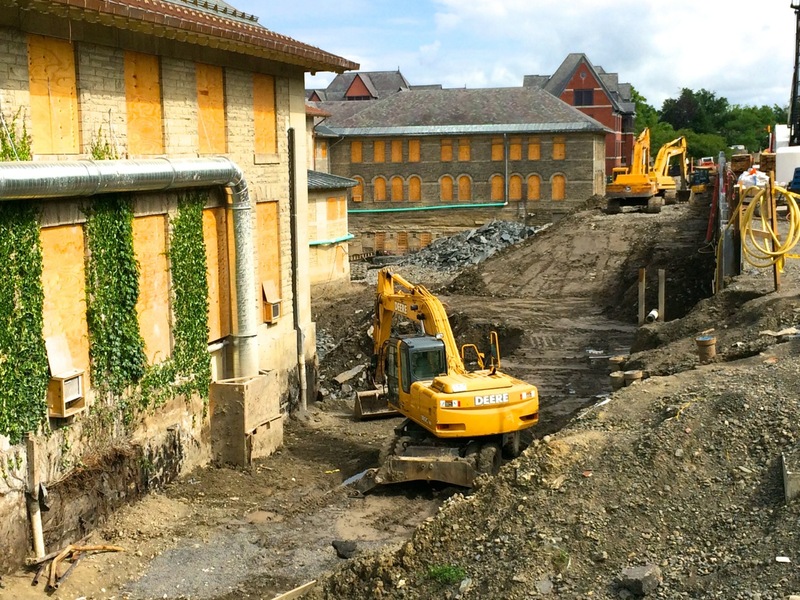 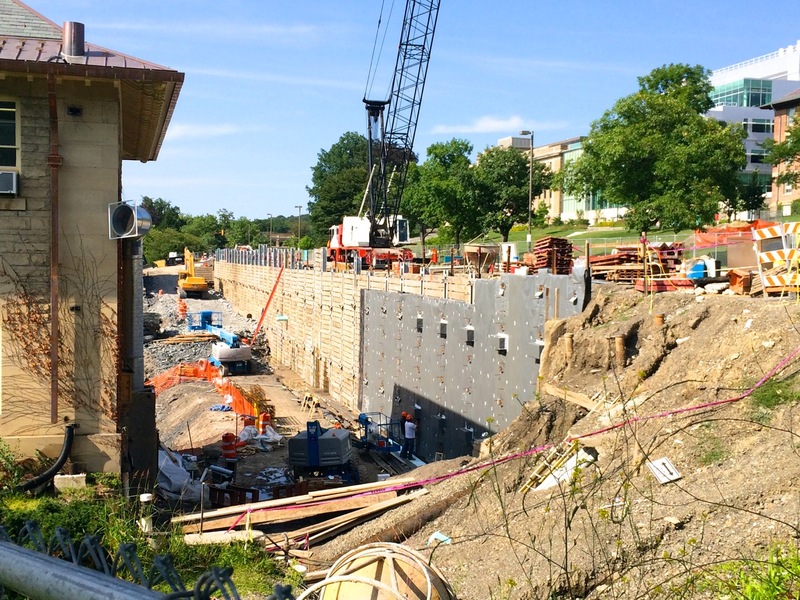 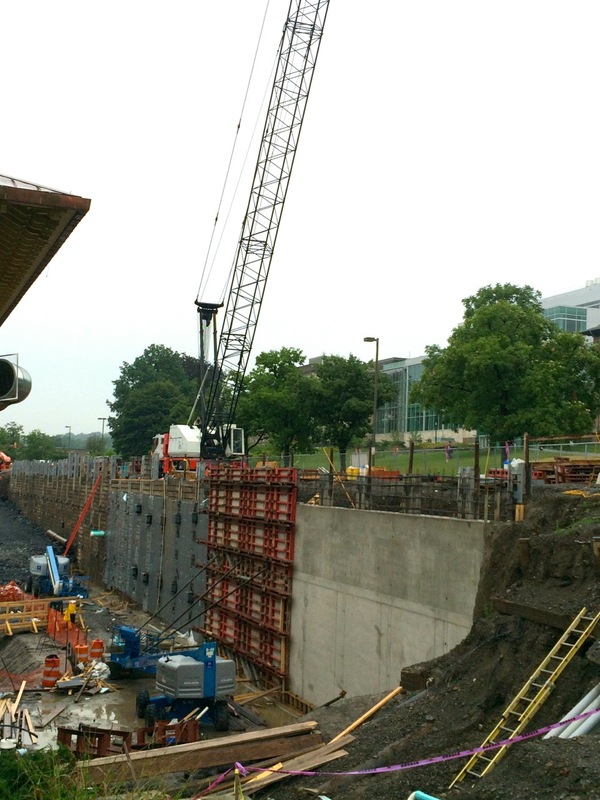 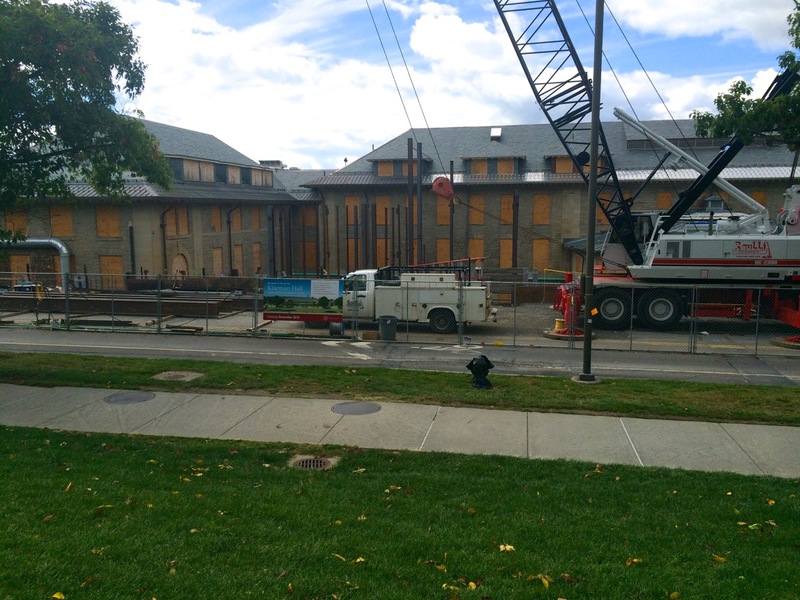 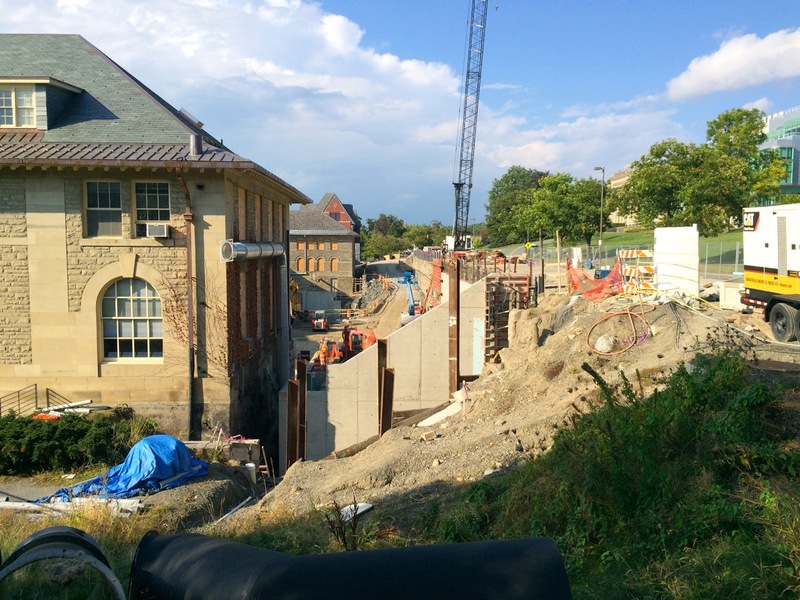 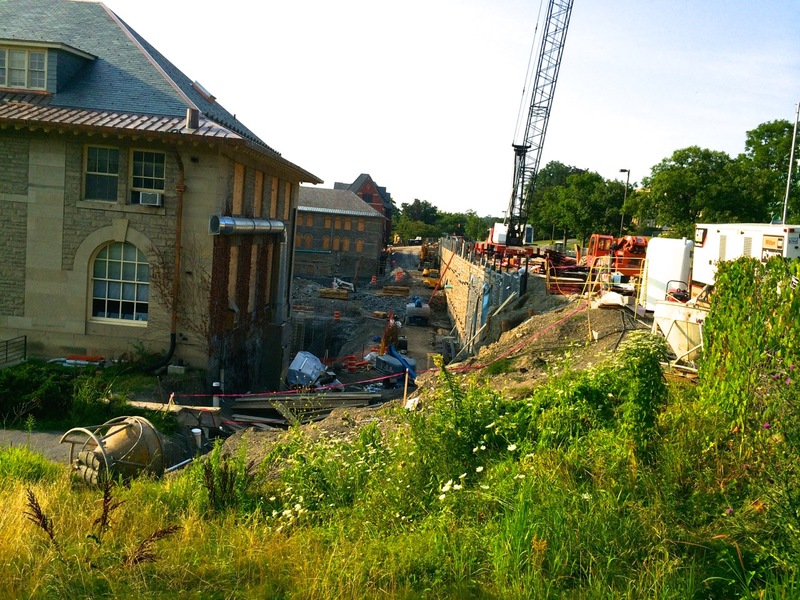 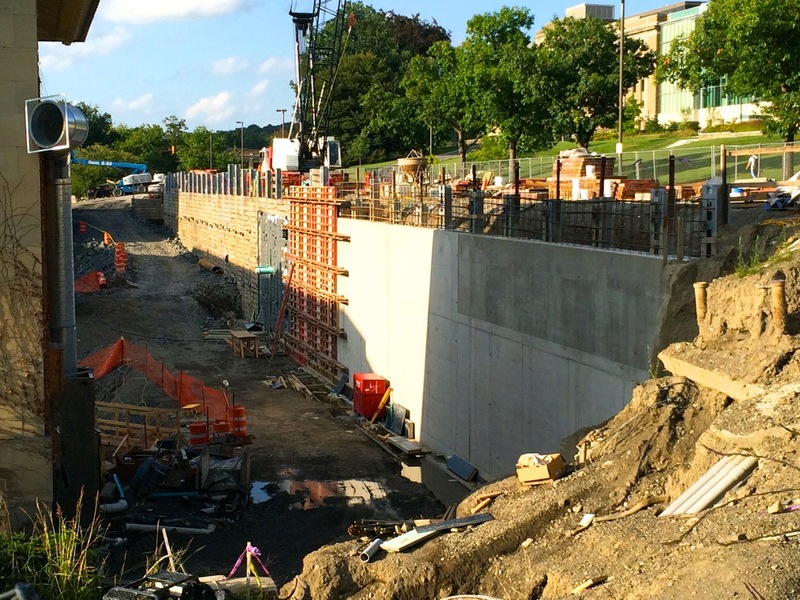 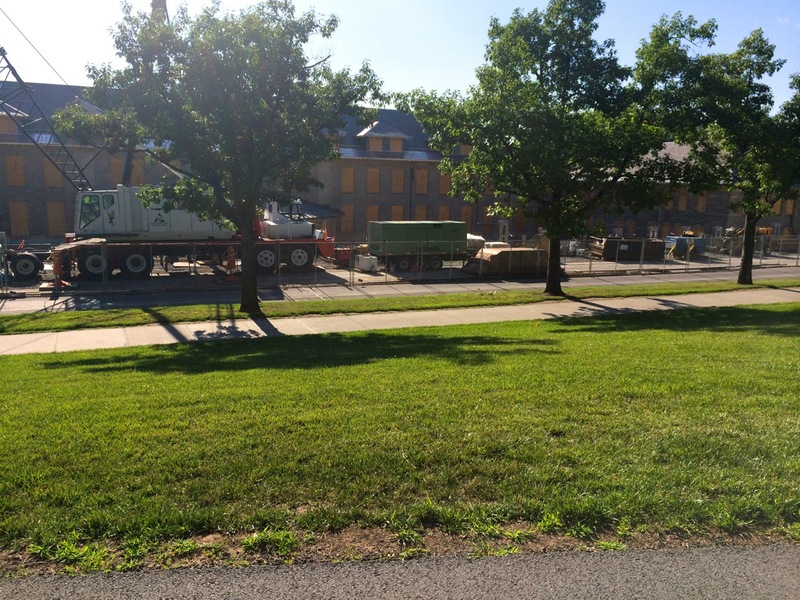 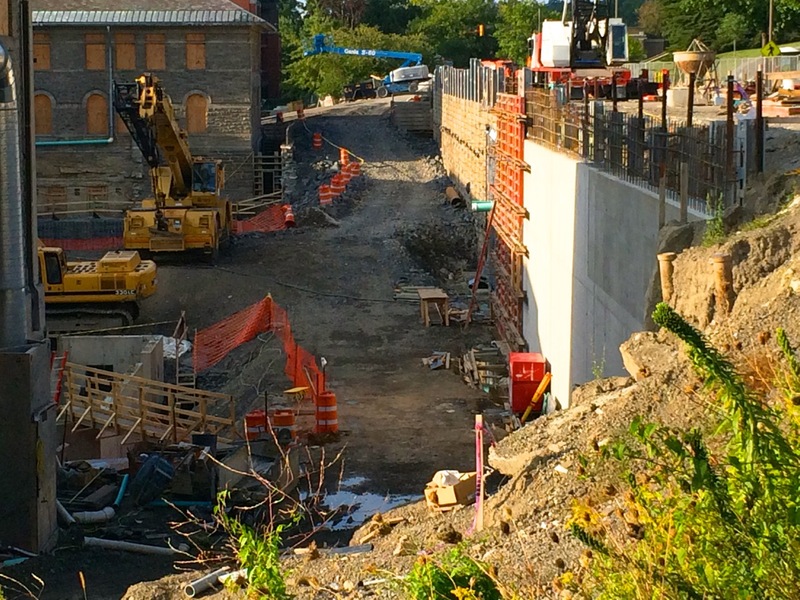 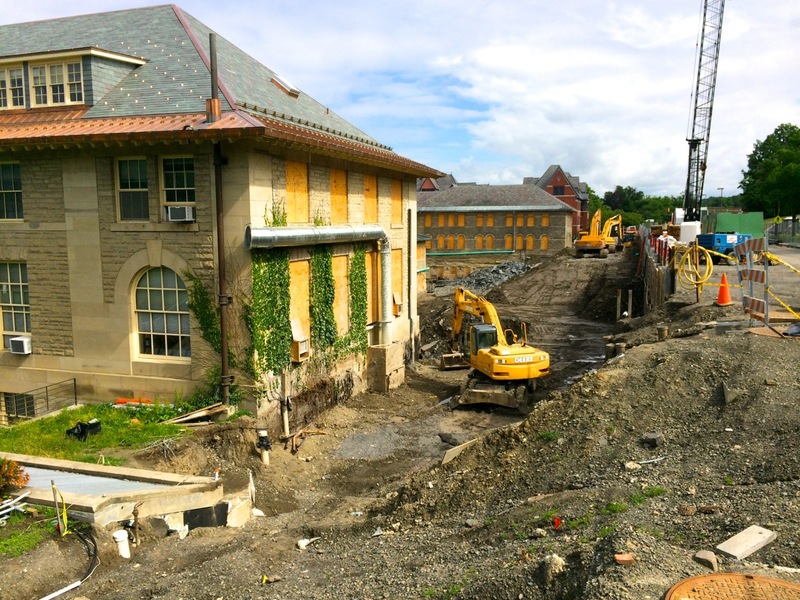 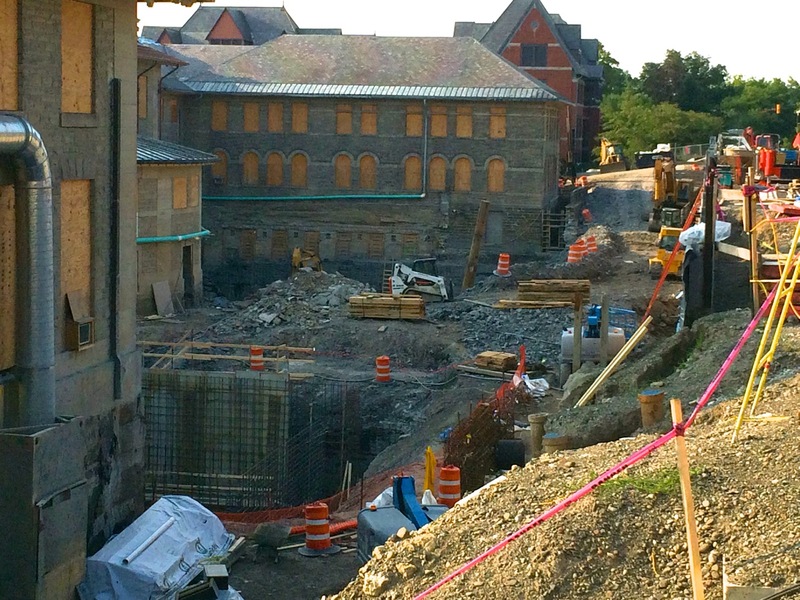 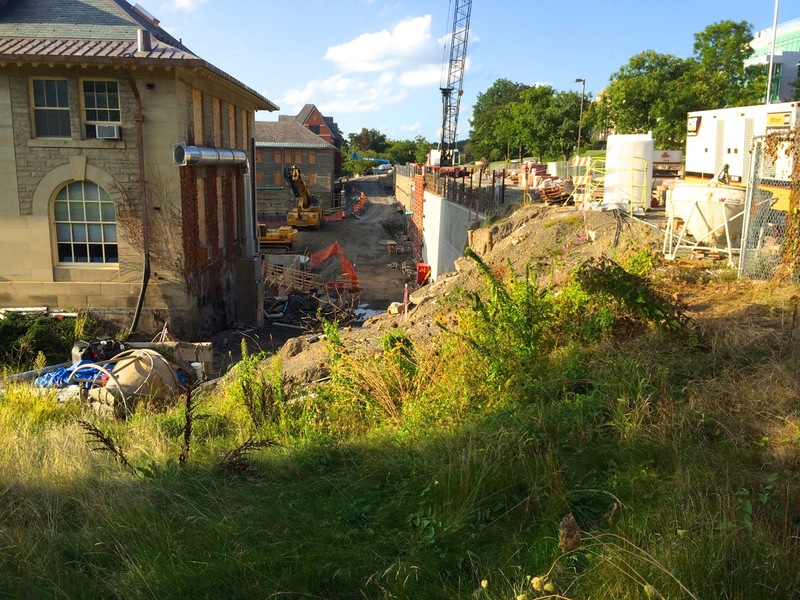 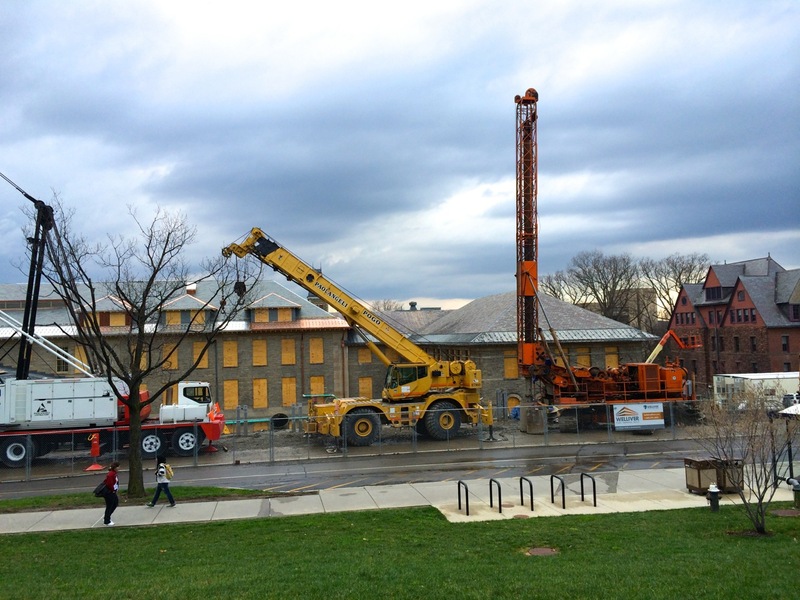 Foundation underpinnings for Goldwin Smith Hall will continue for the rest of this month, then further excavation of the hillside will take place along East Ave to prepare for structural foundation work for the future Klarman Hall.